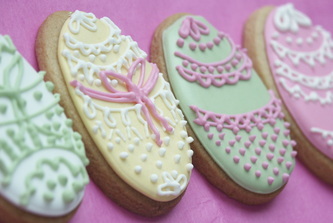 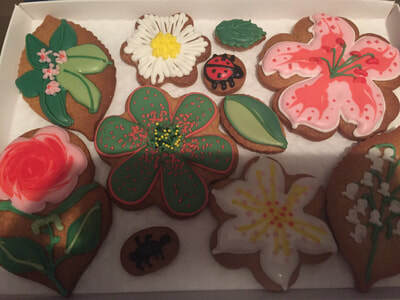 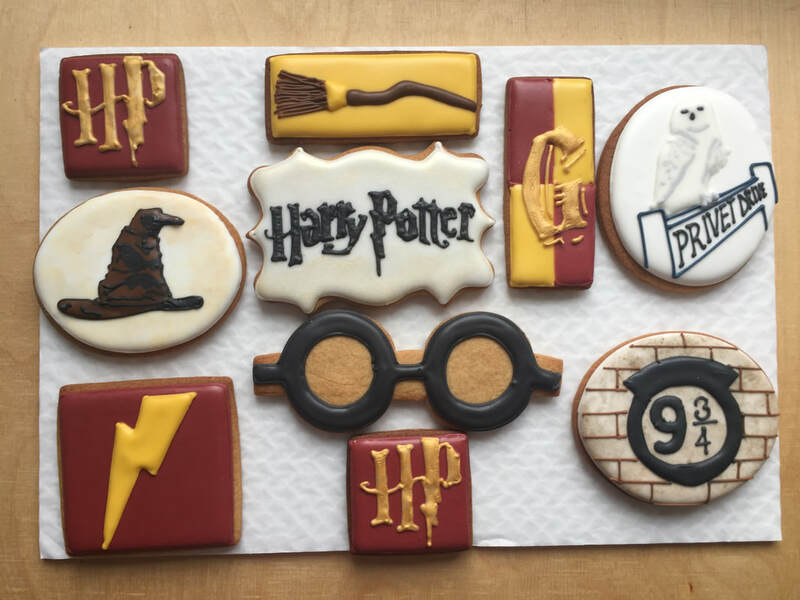 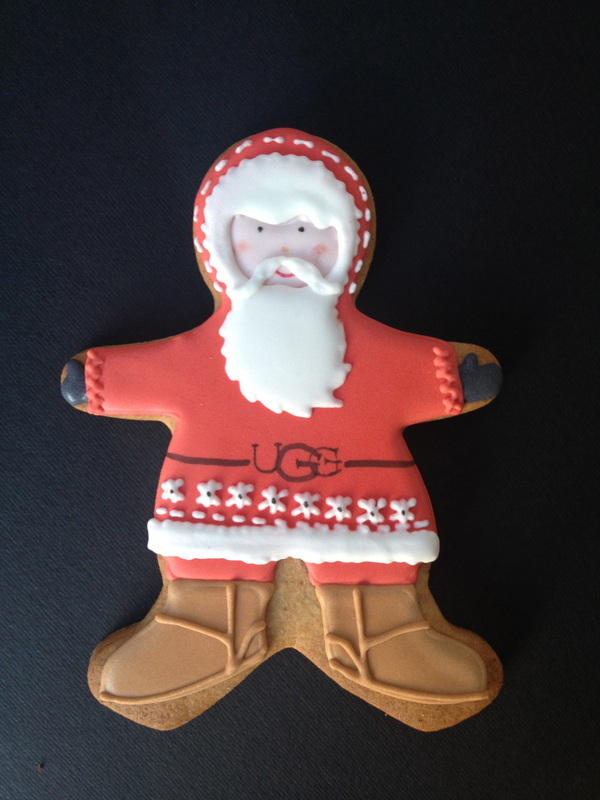 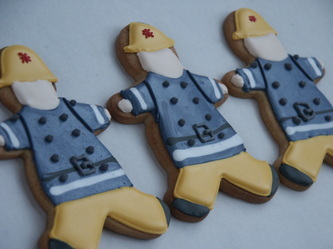 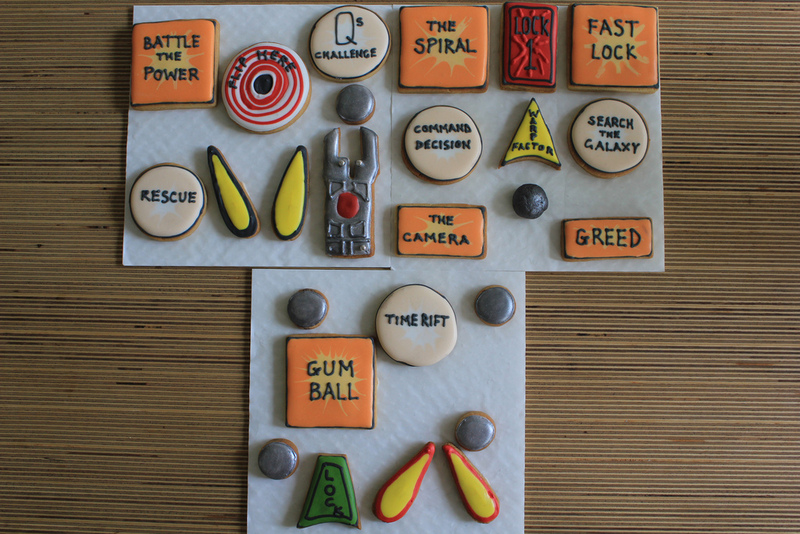 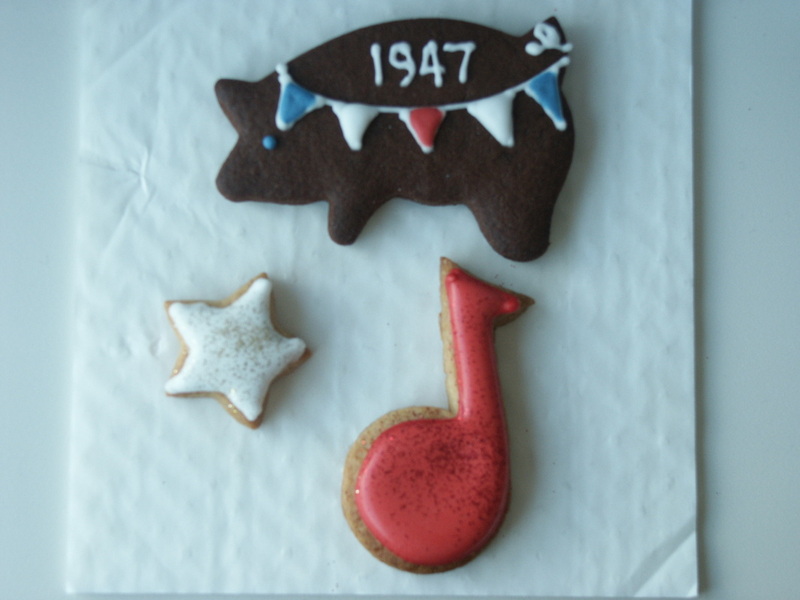 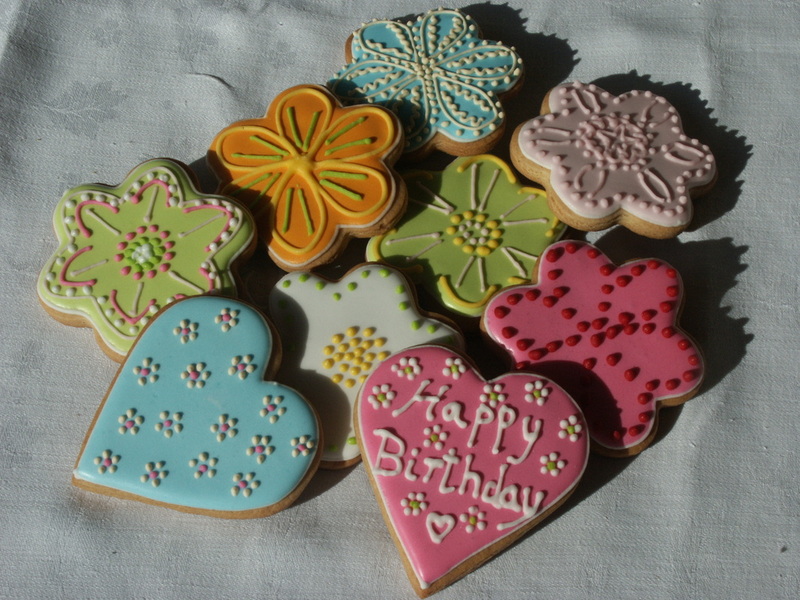 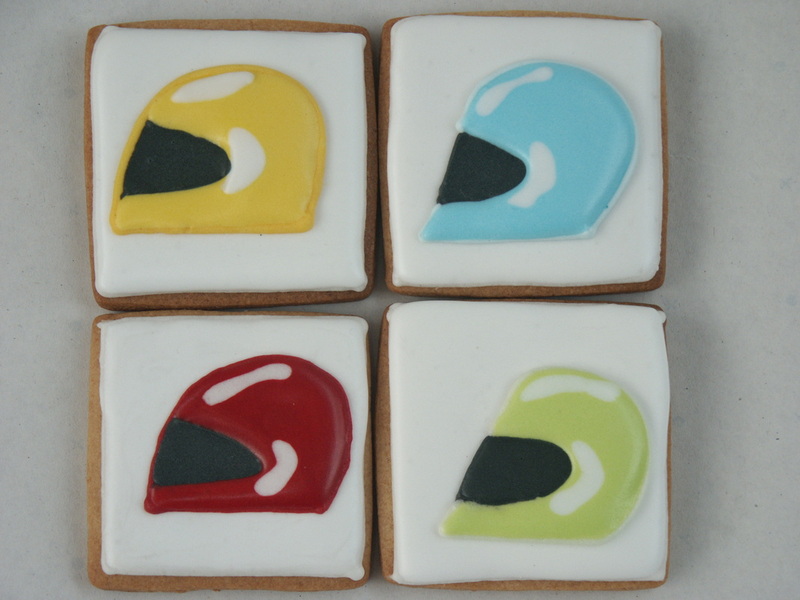 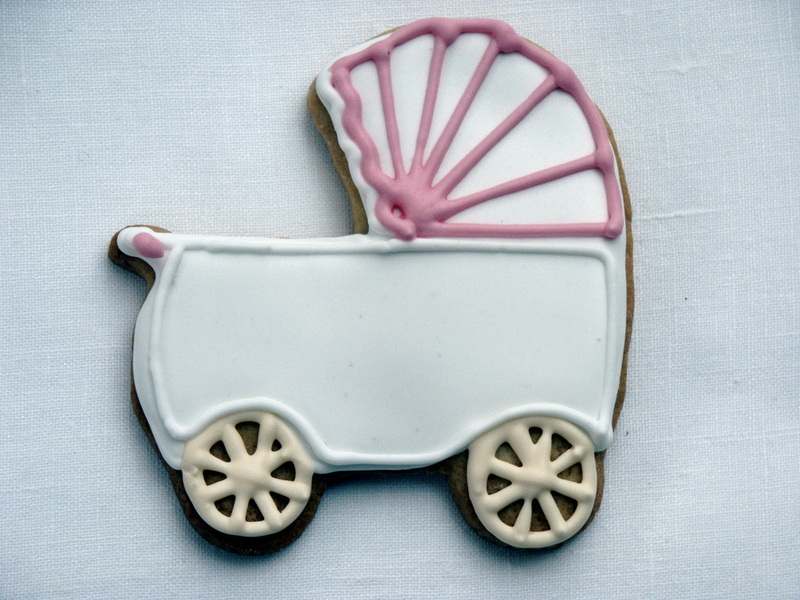 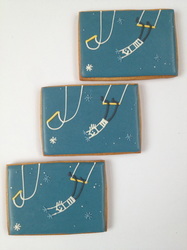 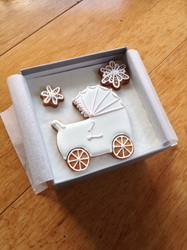 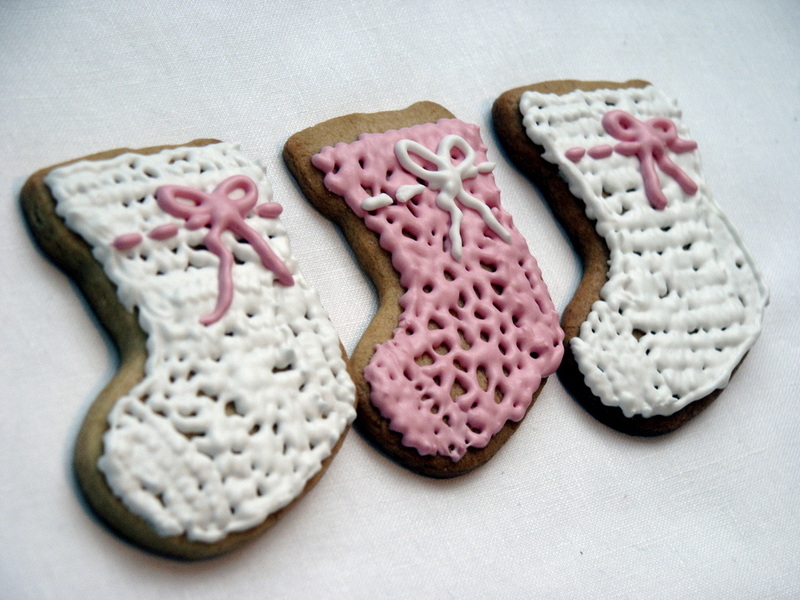 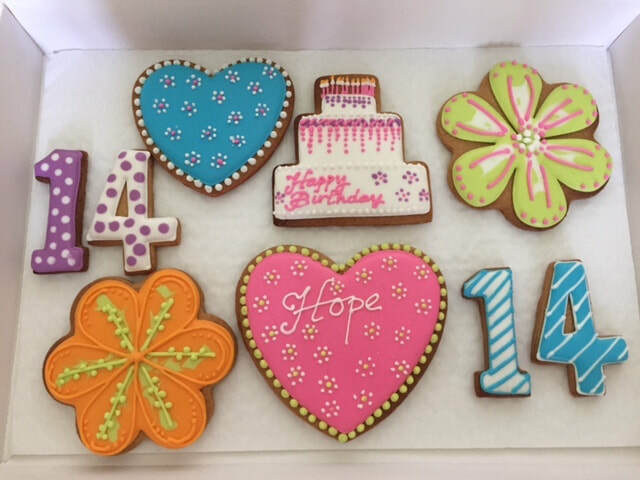 Gift biscuits for any occasion that taste as good as they look - vanilla, lemon, chocolate, ginger or spice, decorated to suit your desire. 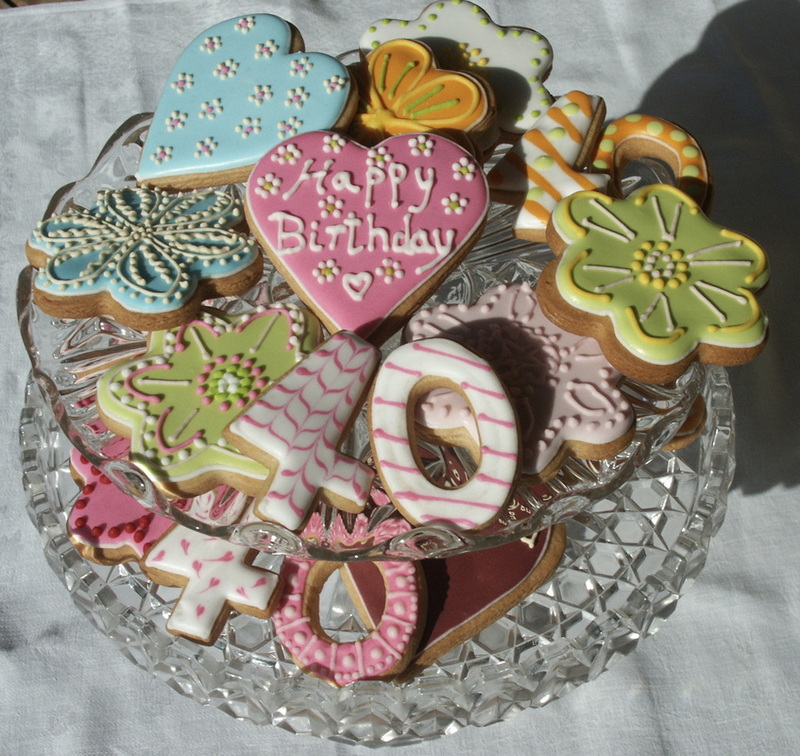 Made using the finest, freshest ingredients and carefully hand-iced, each biscuit is a delicious, original and luxurious treat. . A milestone birthday, someone leaving the office, moving house, getting engaged or married. 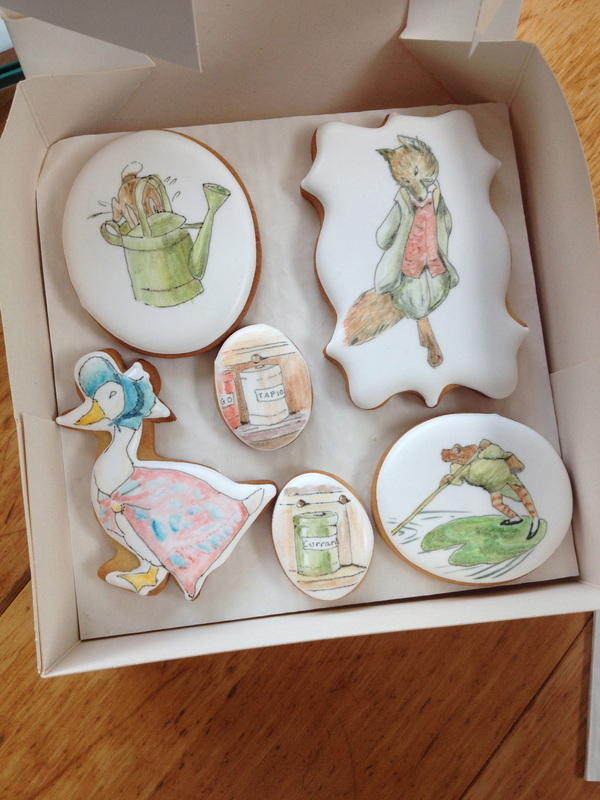 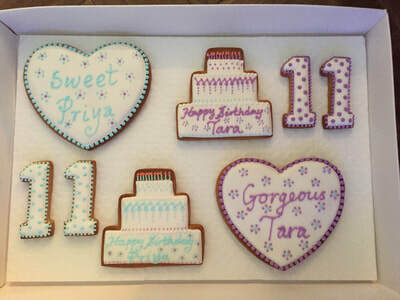 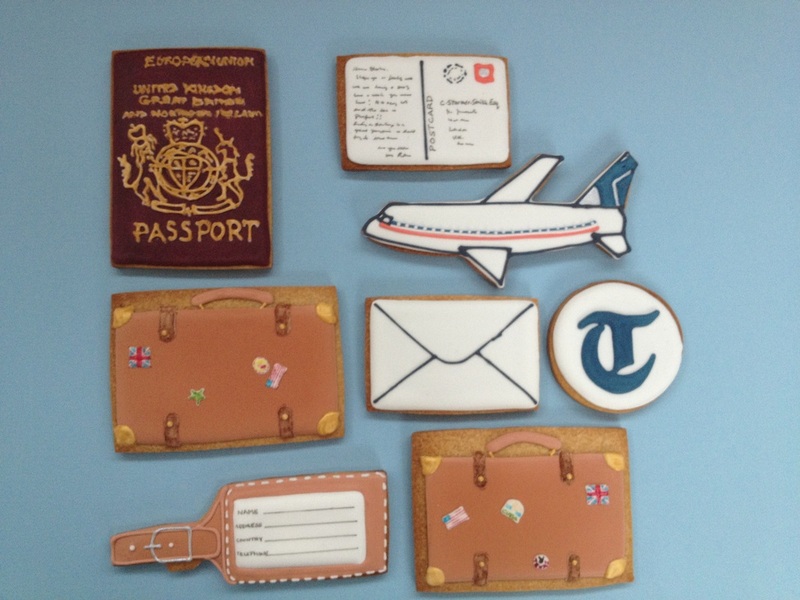 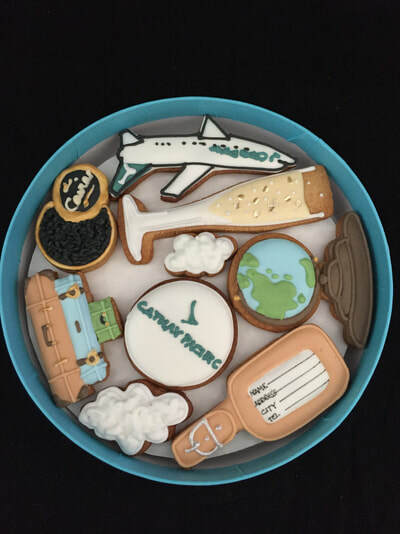 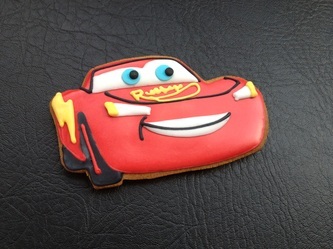 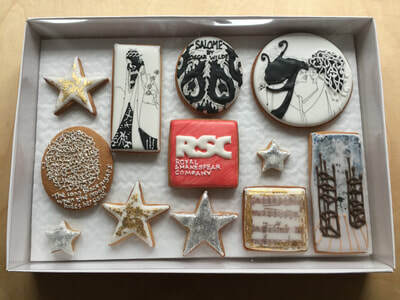 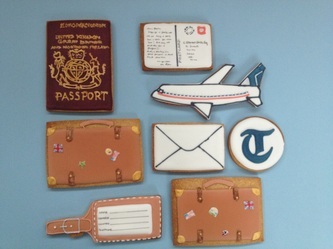 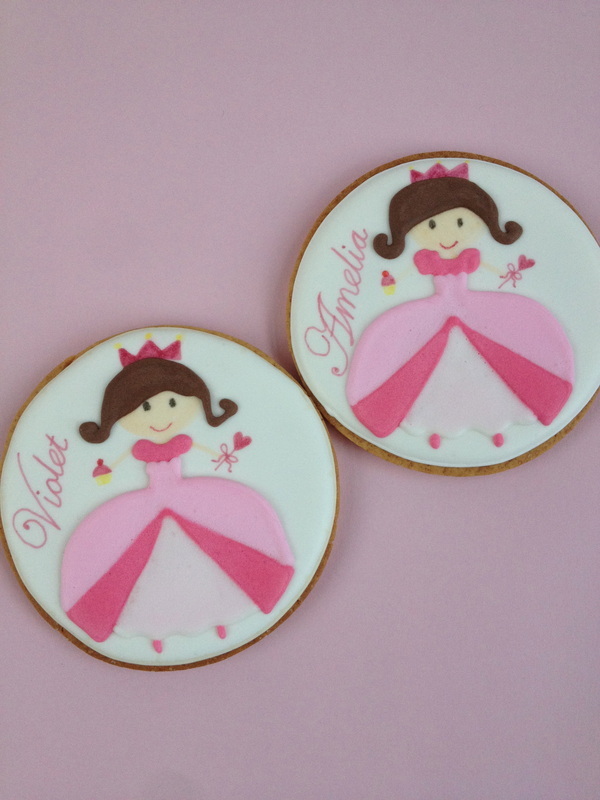 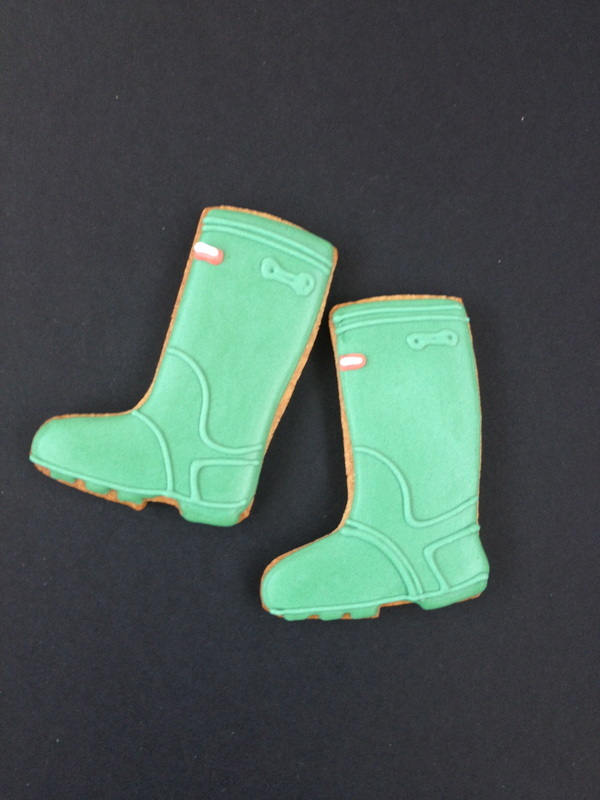 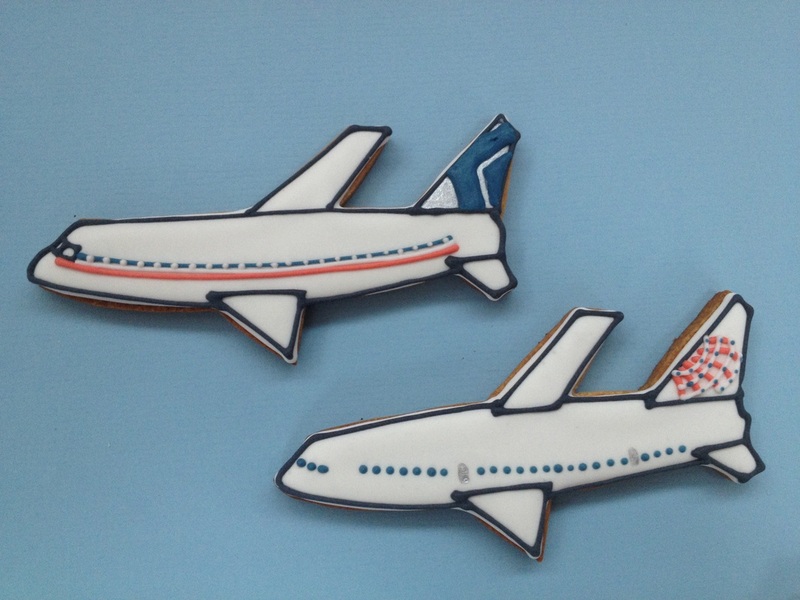 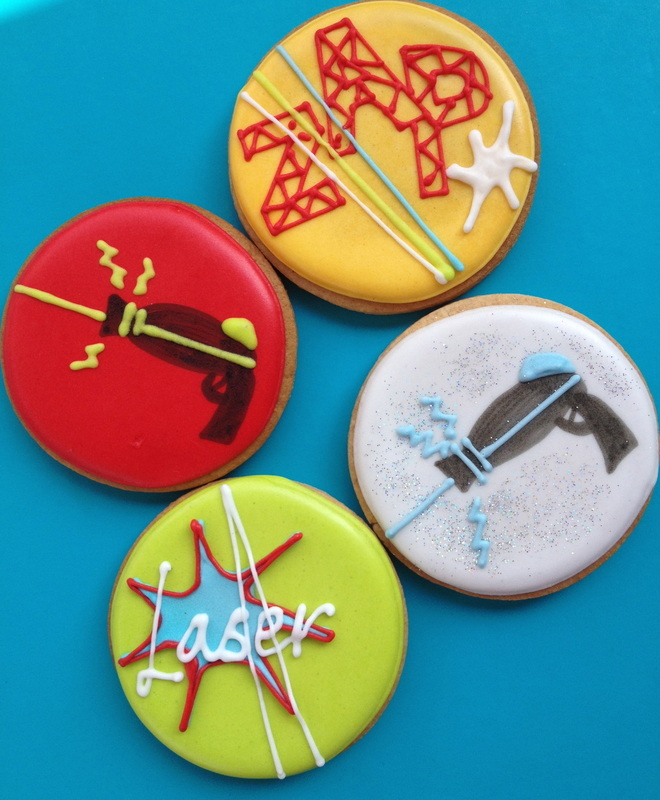 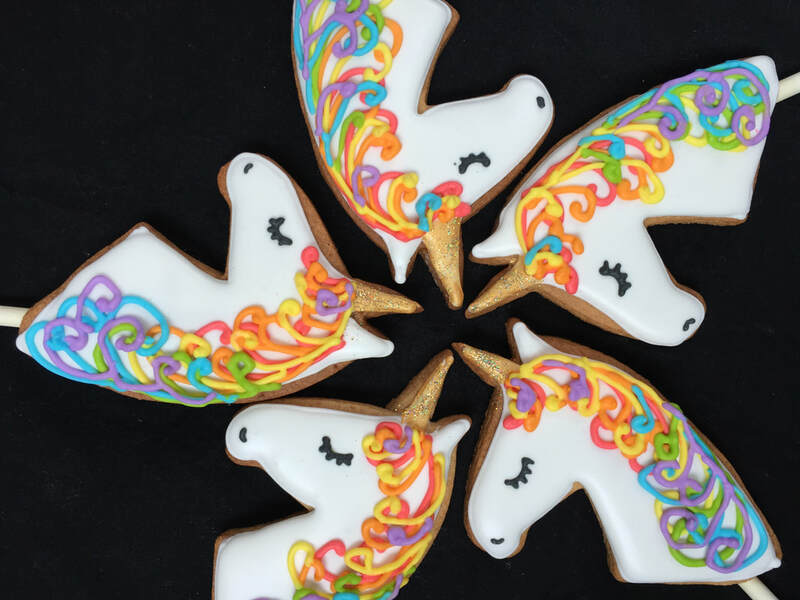 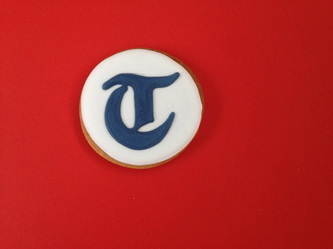 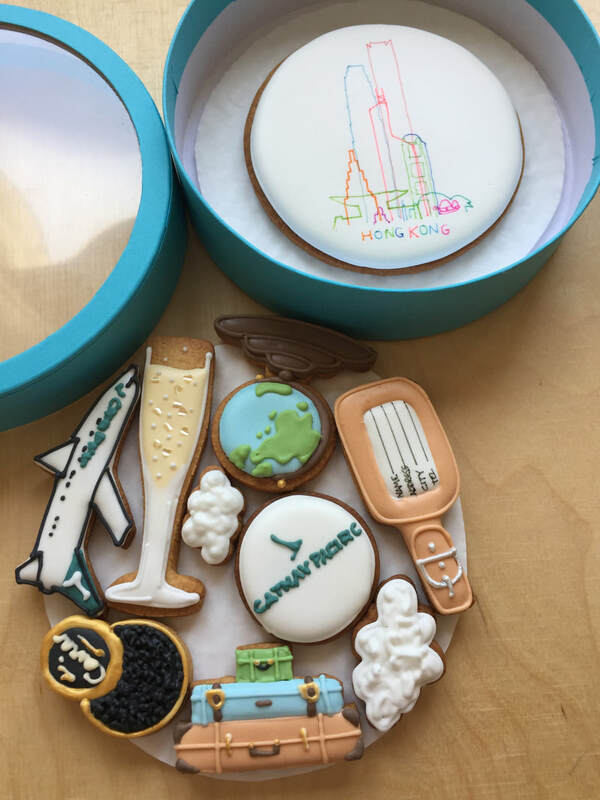 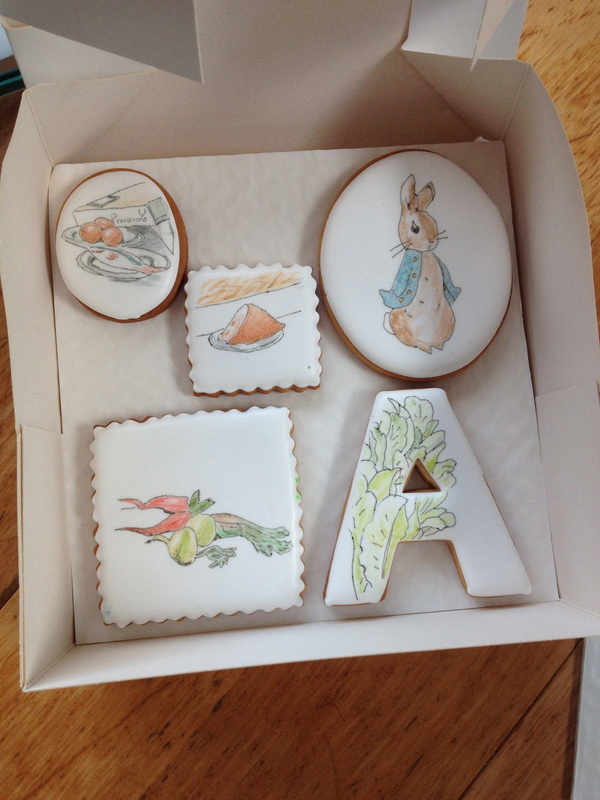 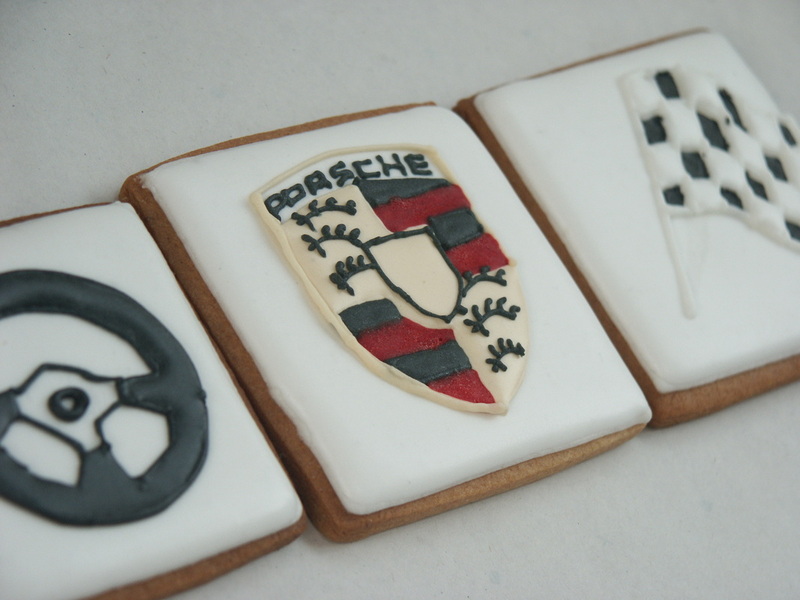 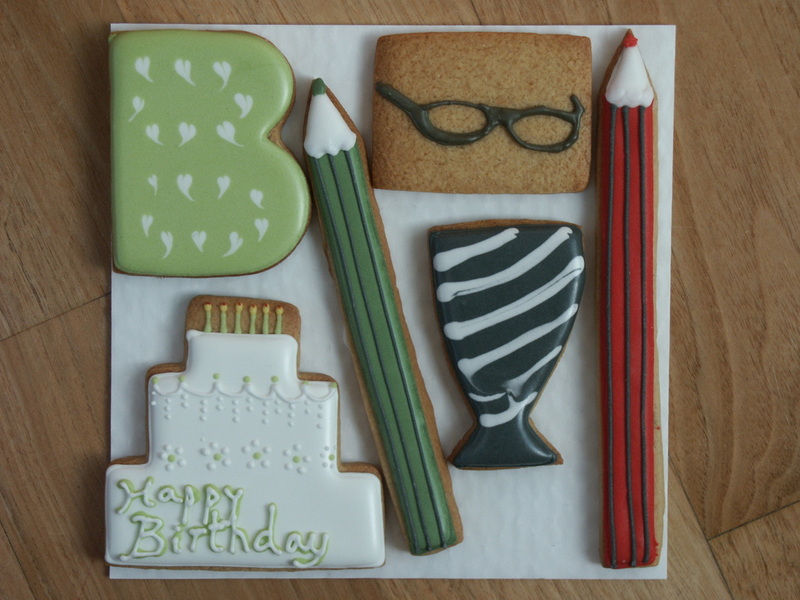 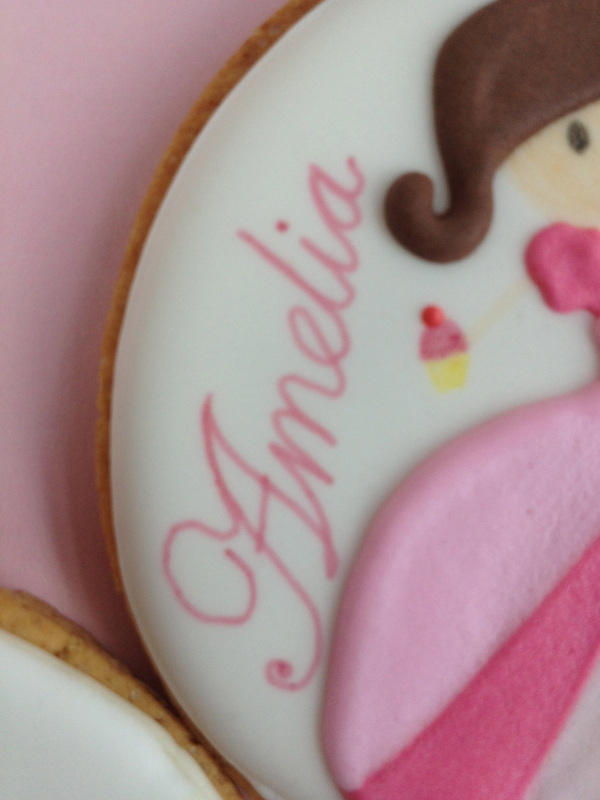 a themed children's birthday party or corporate logos, brighten-up-a-Friday-afternoon-in-the-office, or just to say 'Thank you' to someone...there's a beautiful collection of biscuits to say it with style. 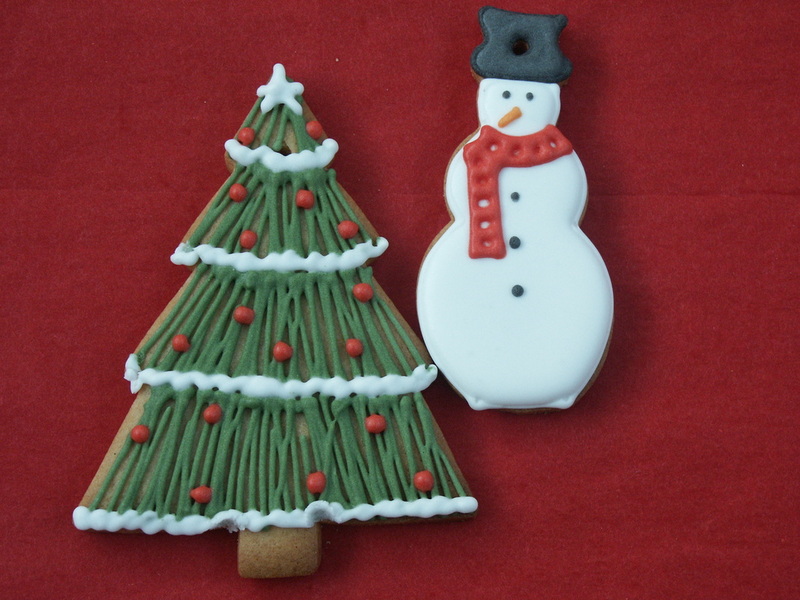 Let us know what you'd like and we'll make it! 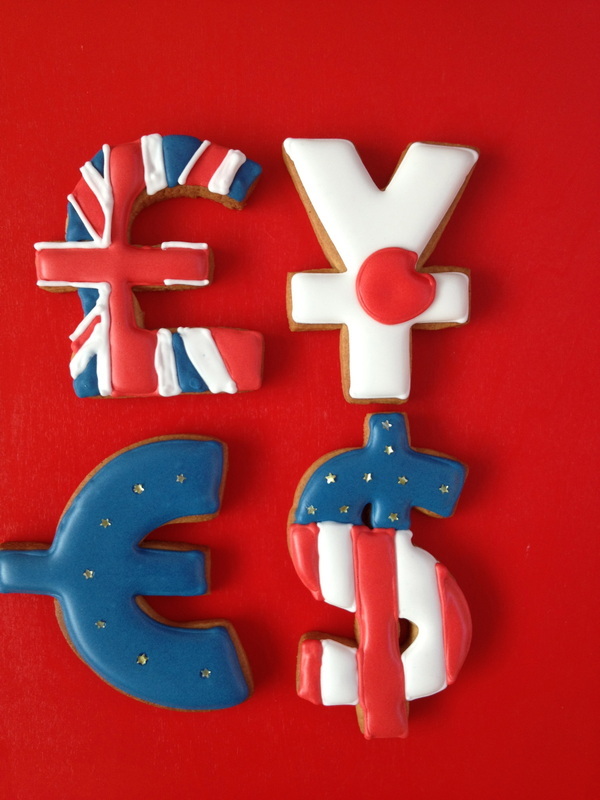 A box containing a minimum of six biscuits costs £35, a box or basket containing at least 10 biscuits costs £55 and a large box containing at least 16 biscuits costs £80. A box or basket of 20 or more biscuits costs £100. 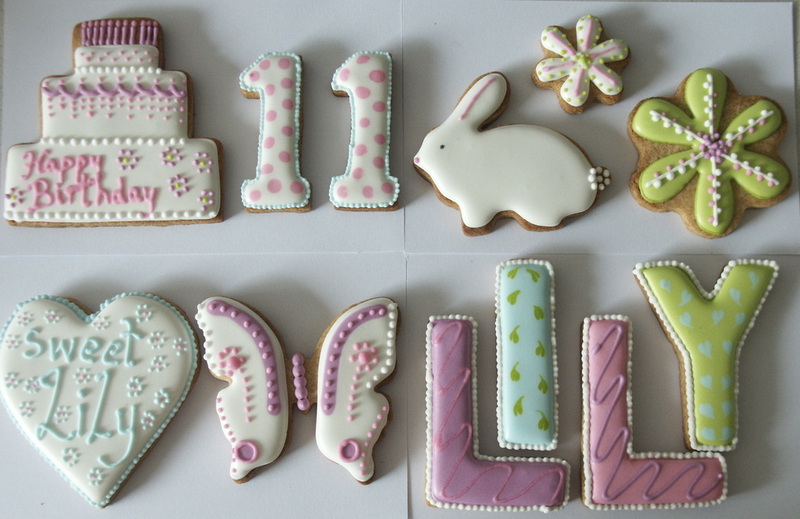 Please enquire for the cost of bespoke designs or larger orders and all delivery charges. 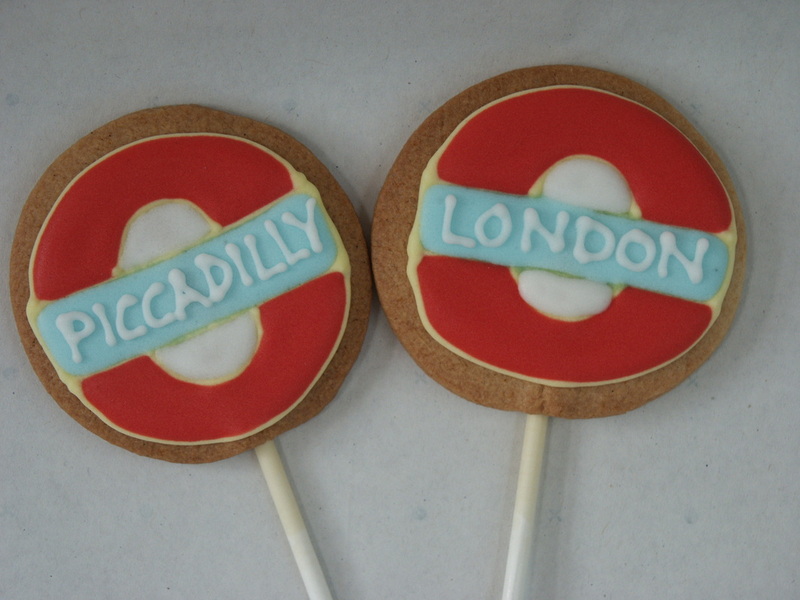 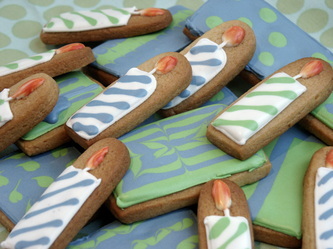 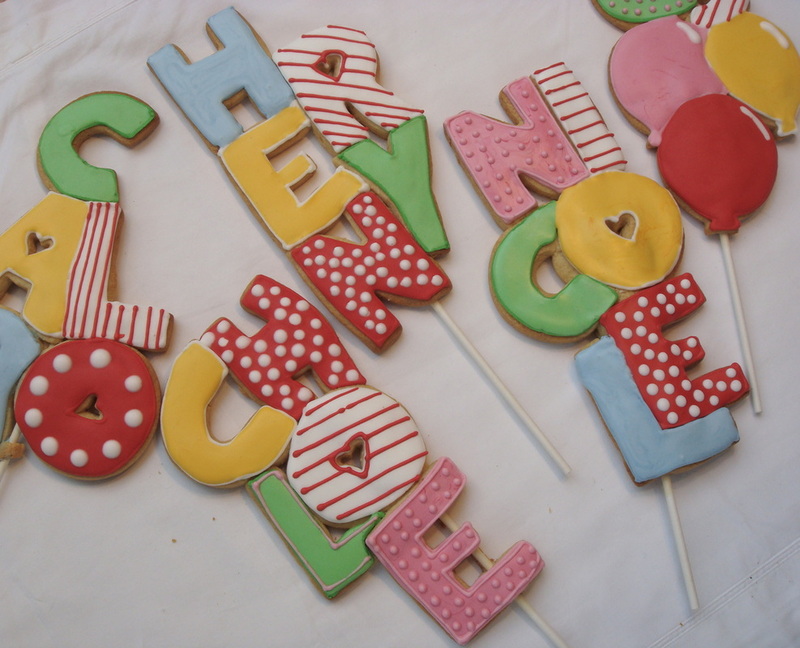 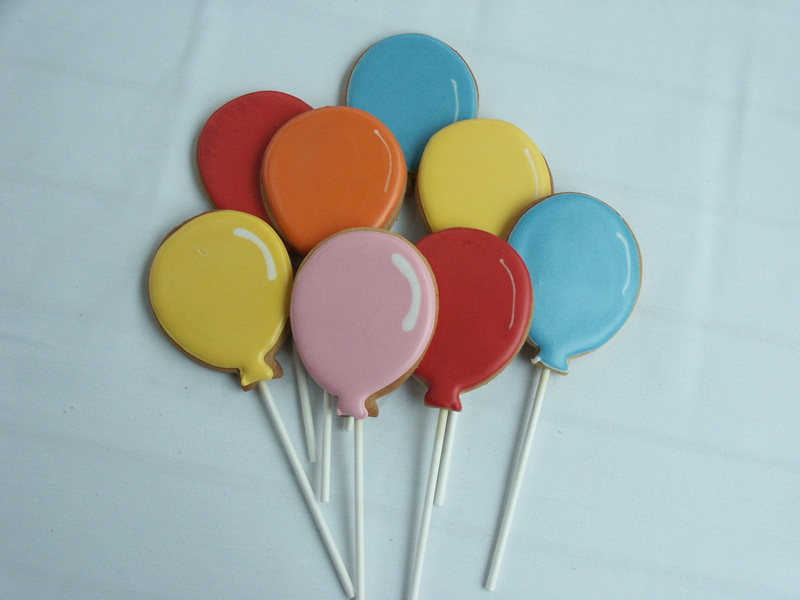 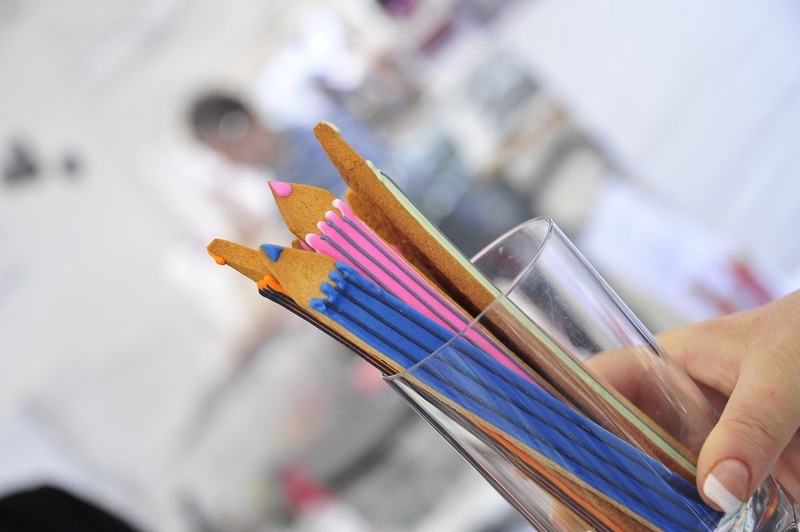 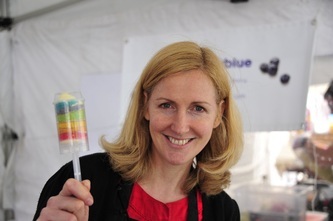 How about some Namepops: Bright, fun biscuits on a stick to celebrate a birthday, name day or event. 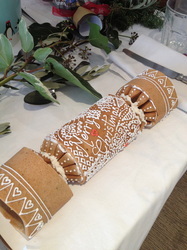 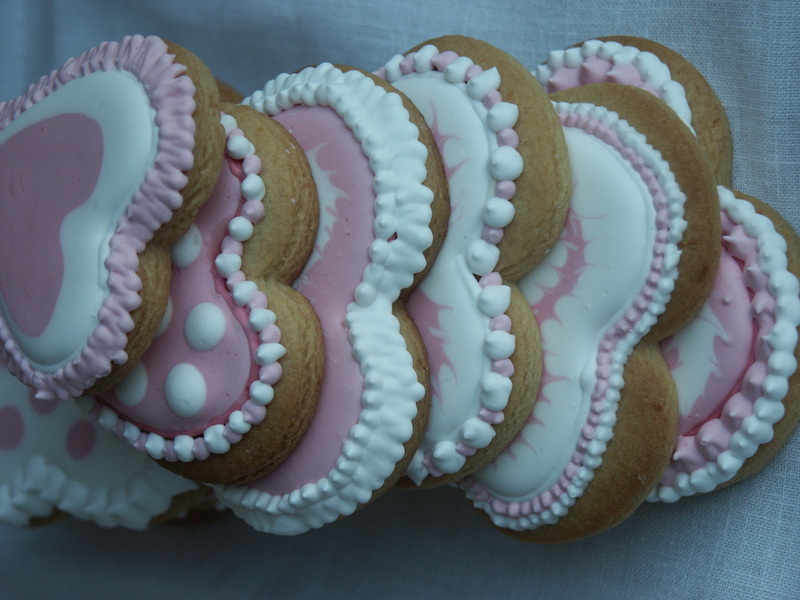 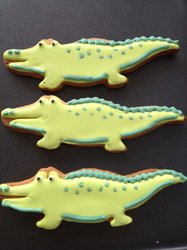 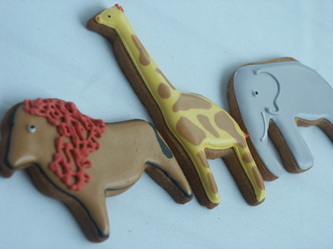 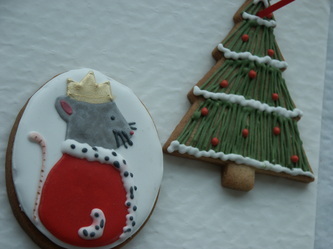 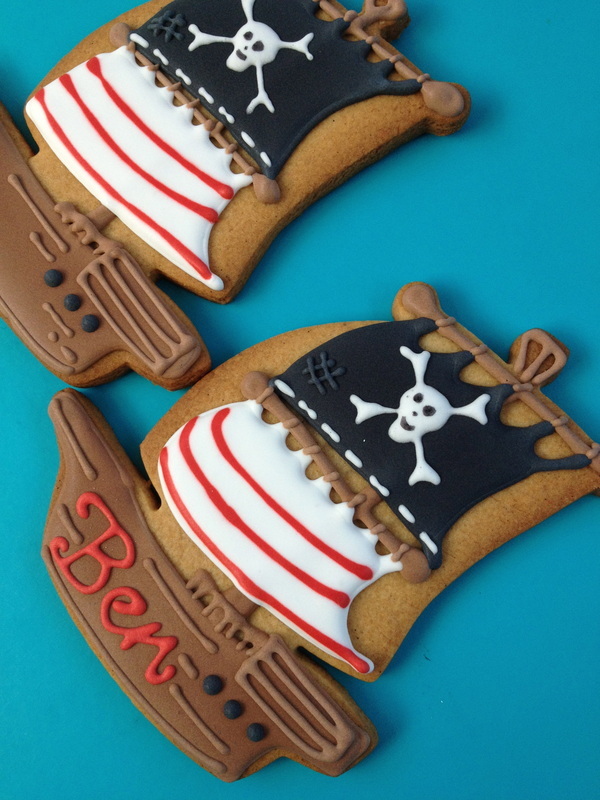 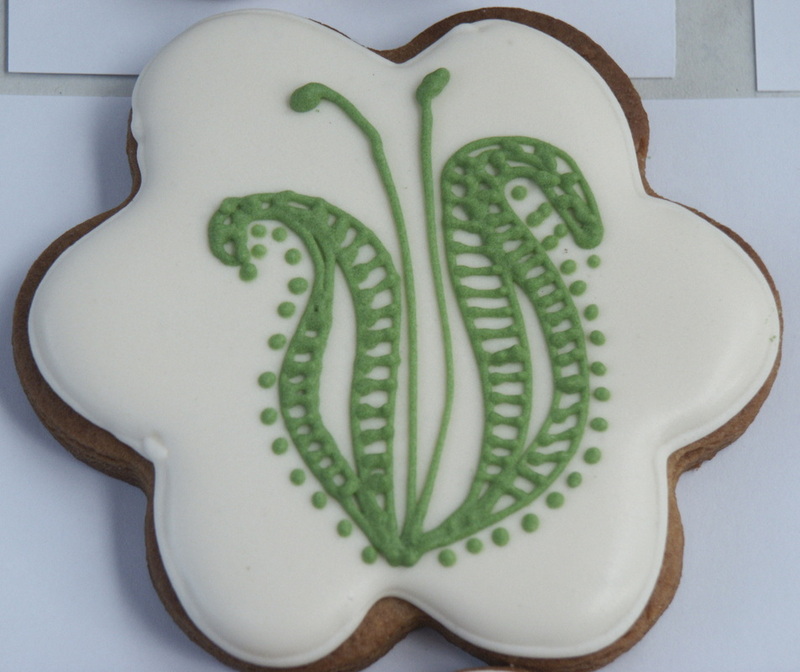 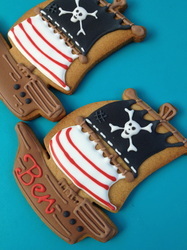 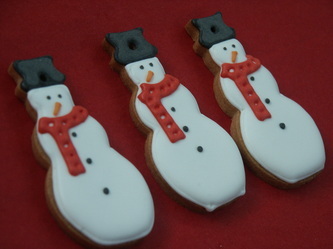 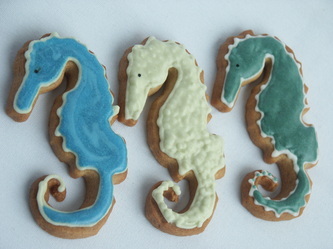 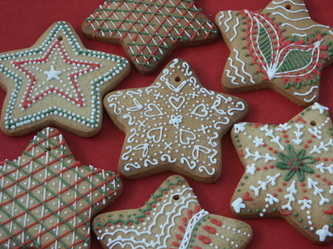 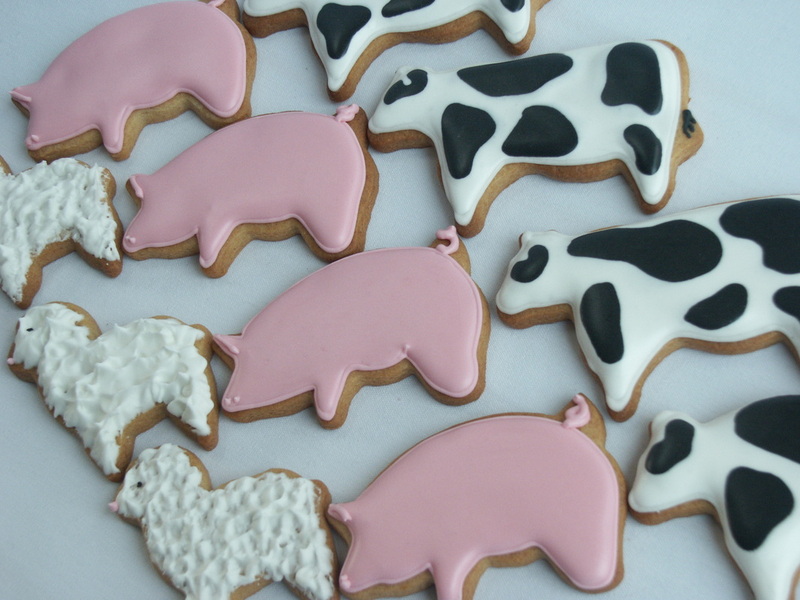 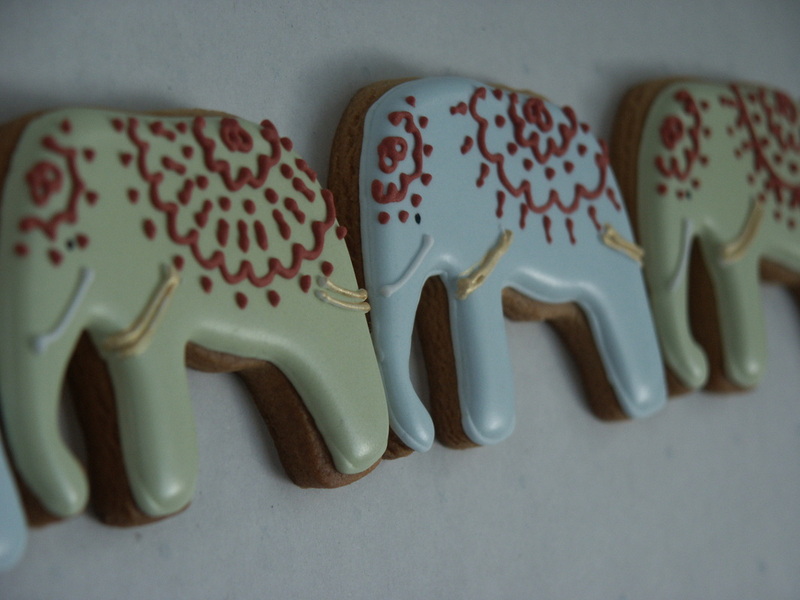 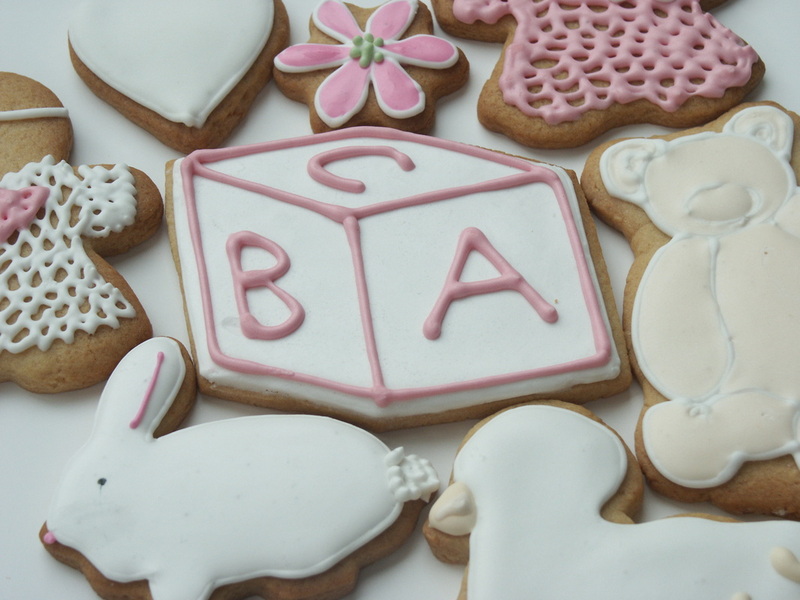 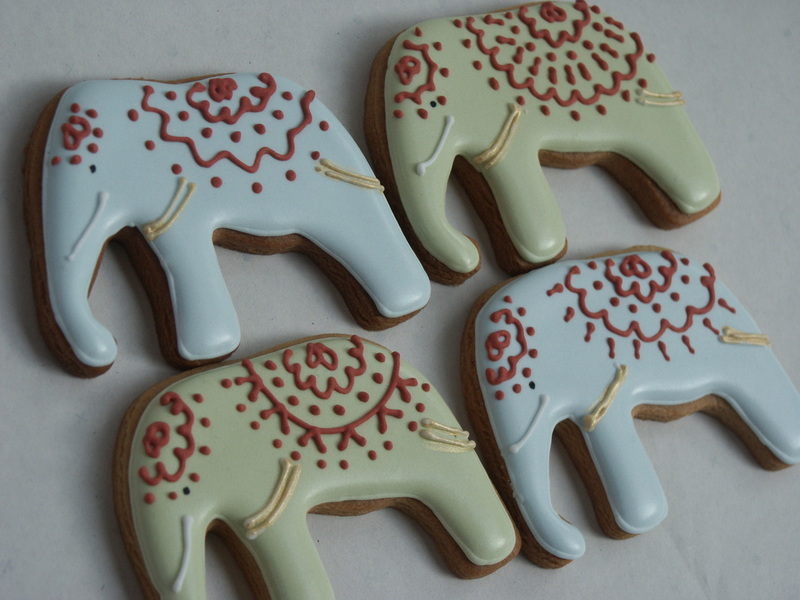 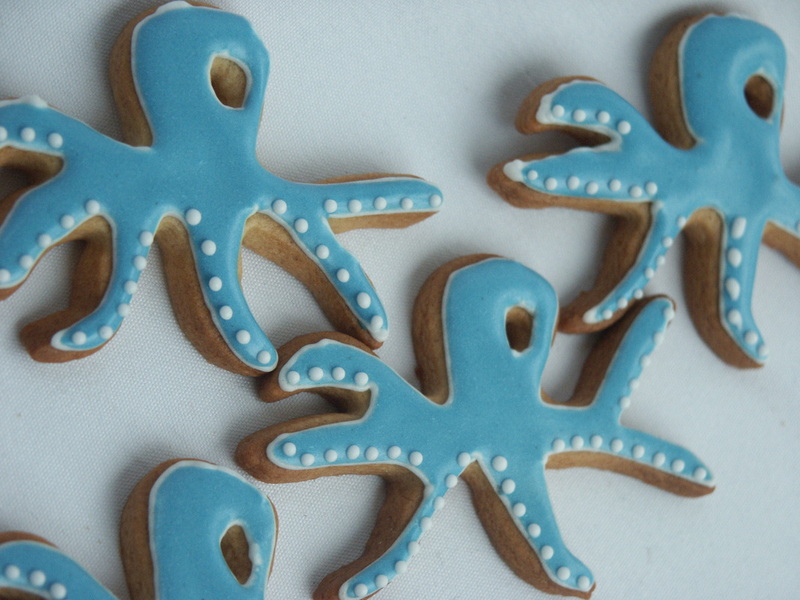 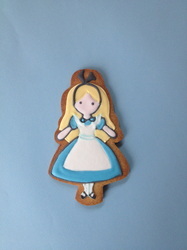 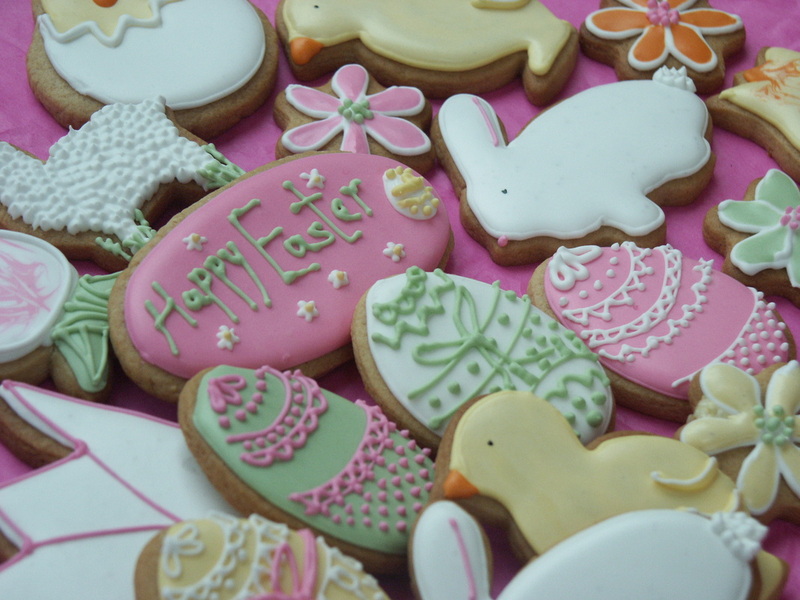 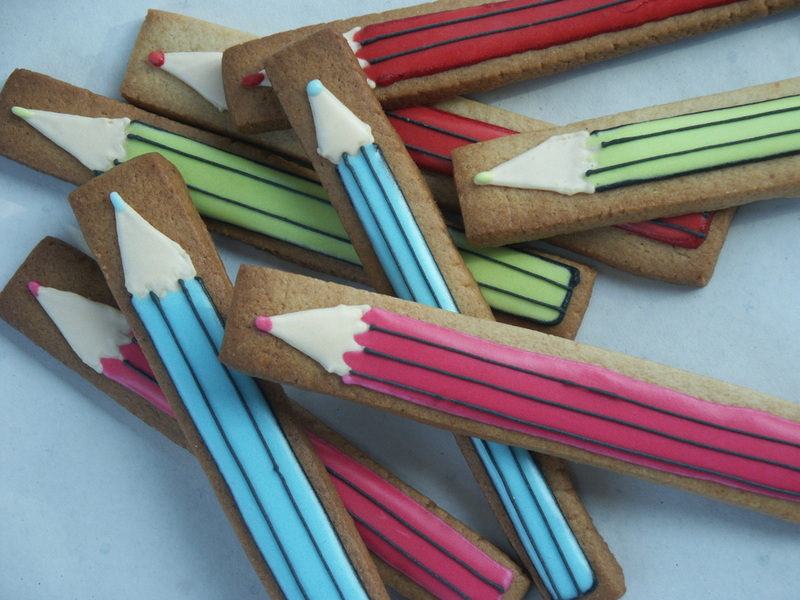 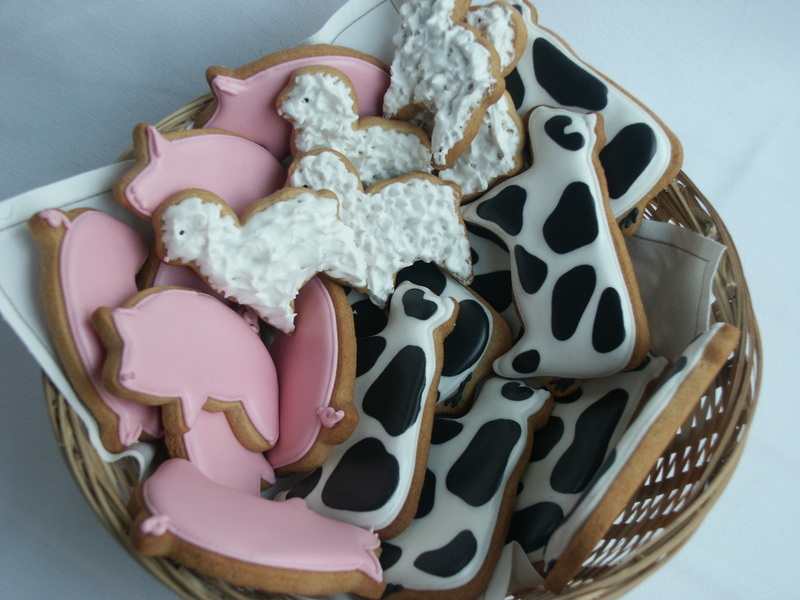 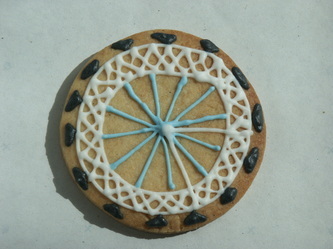 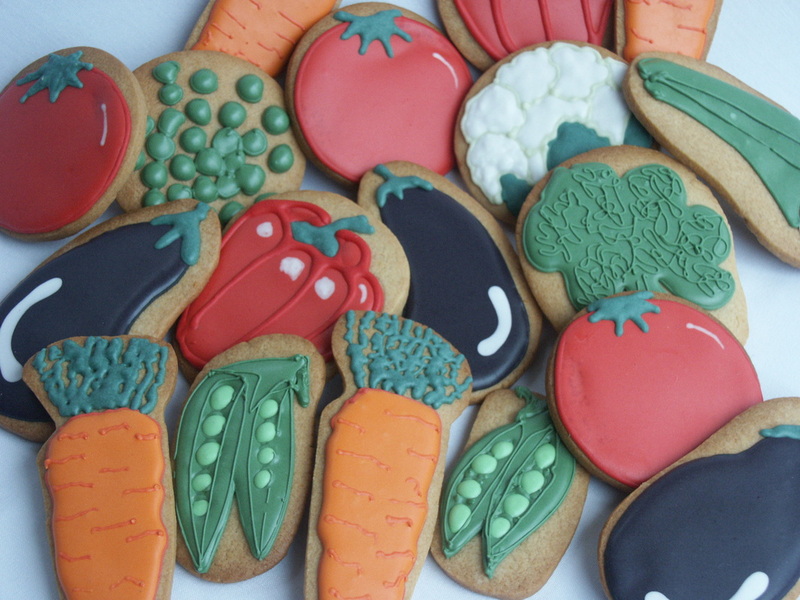 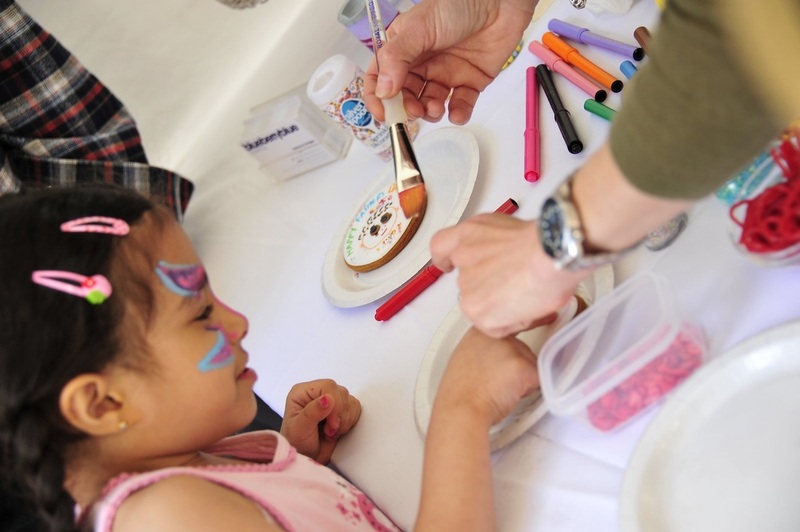 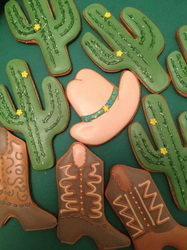 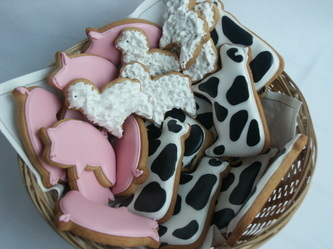 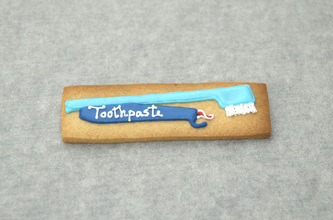 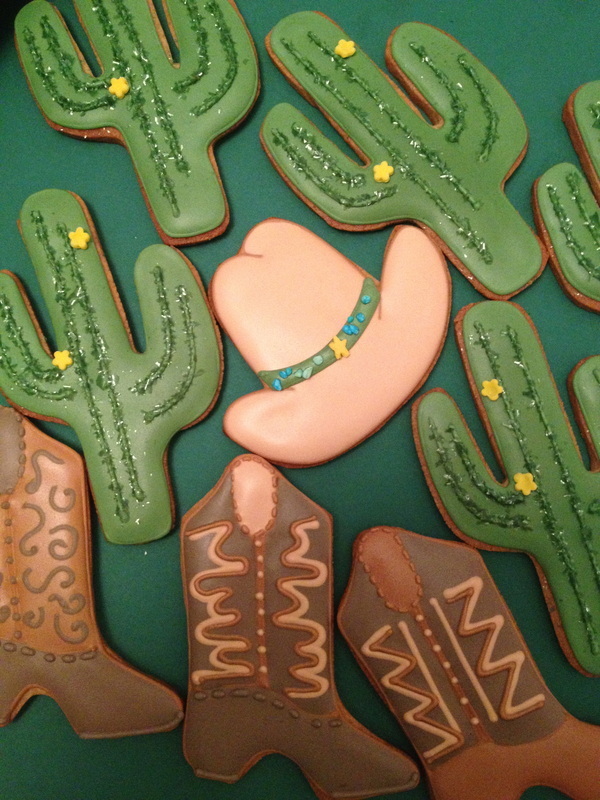 Biscuit decorating parties are a great way of entertaining the children AND keeping the adults happy too! 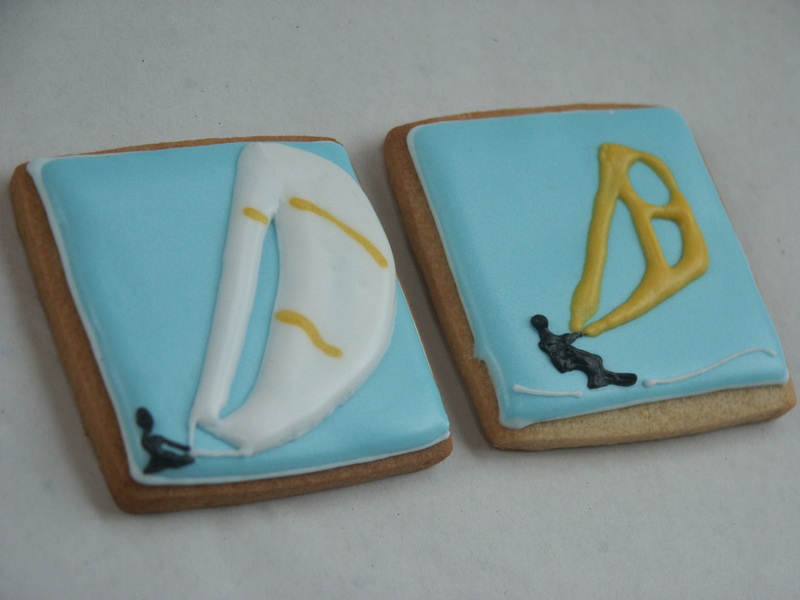 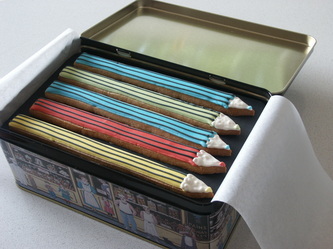 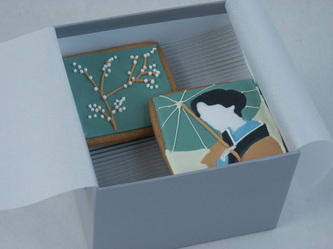 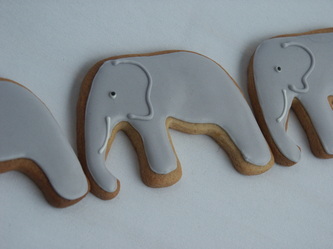 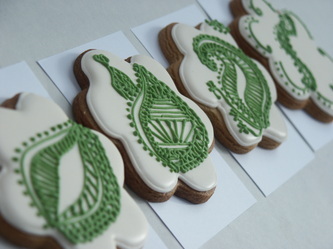 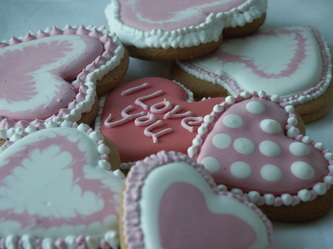 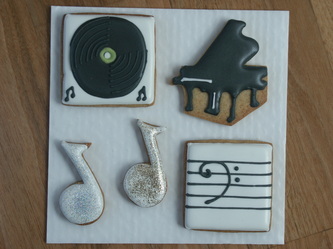 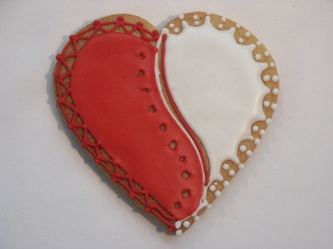 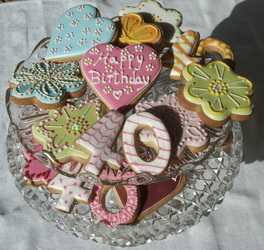 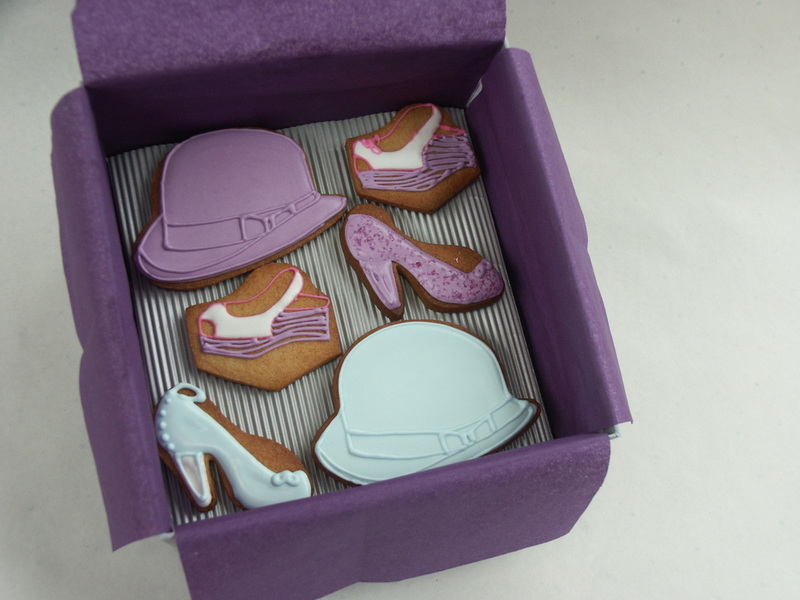 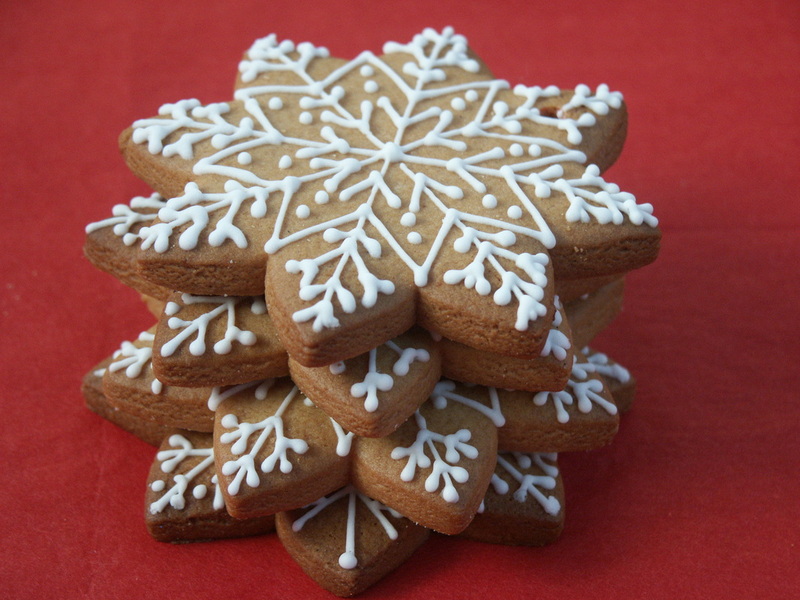 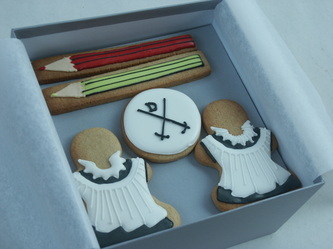 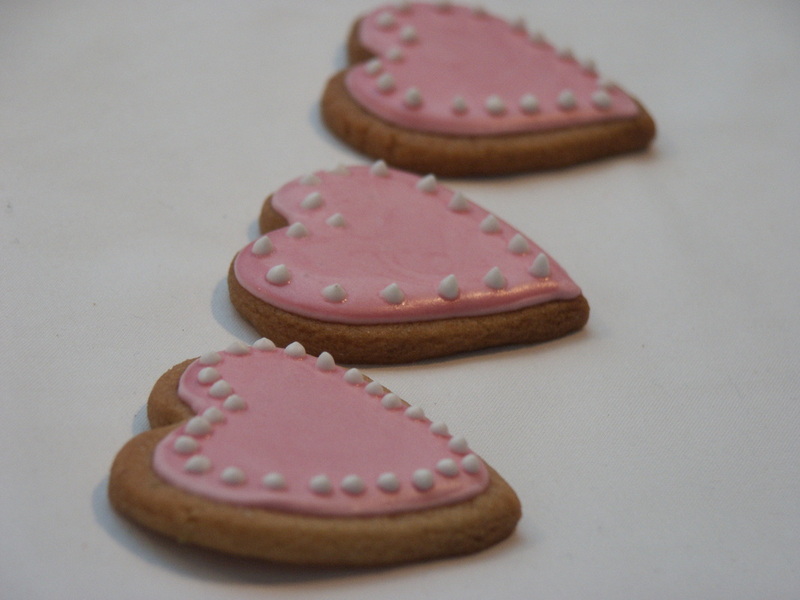 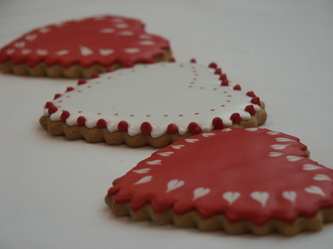 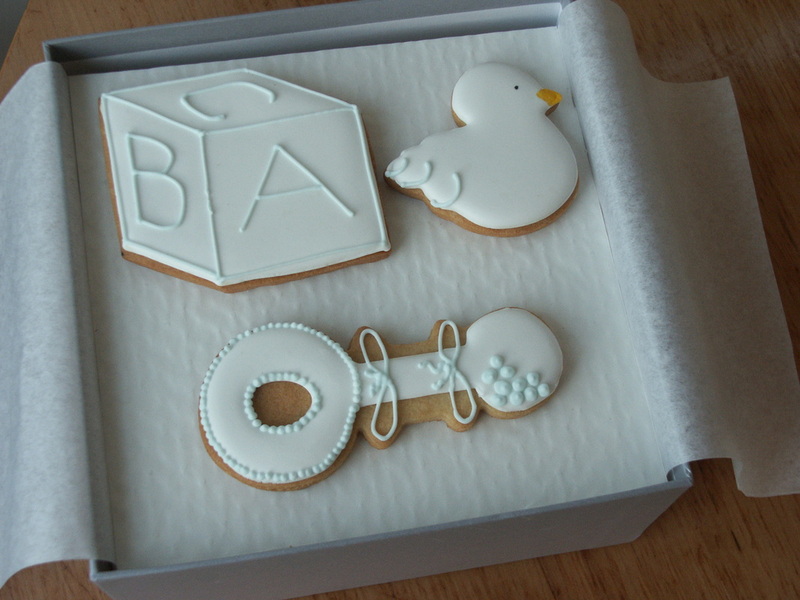 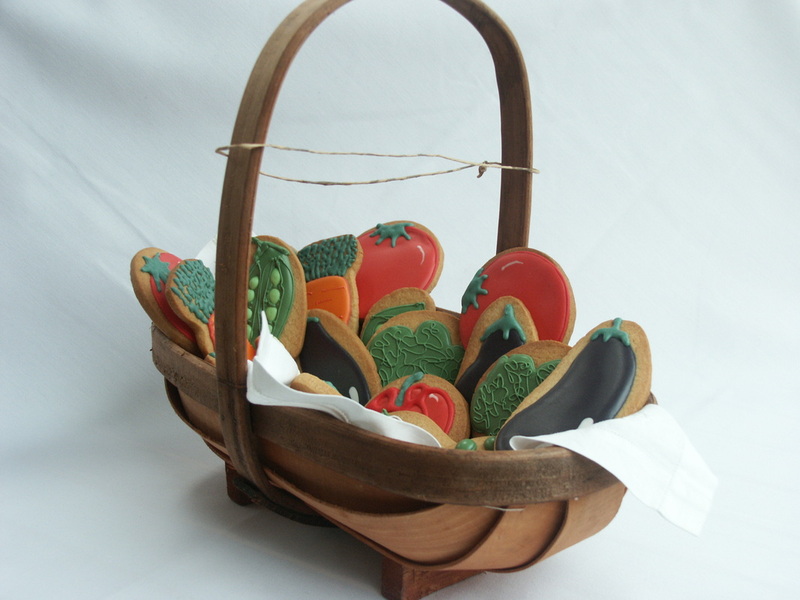 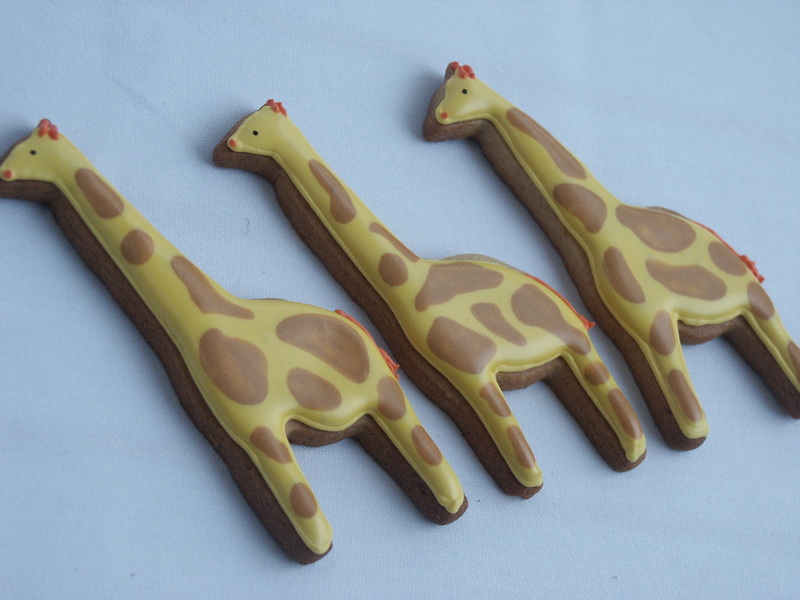 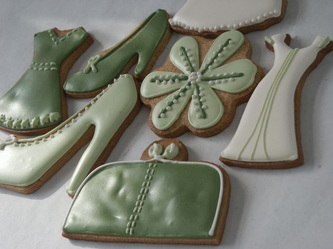 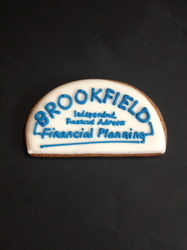 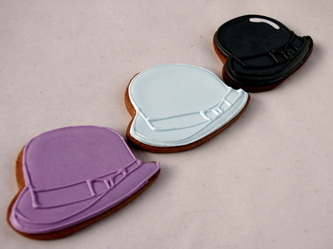 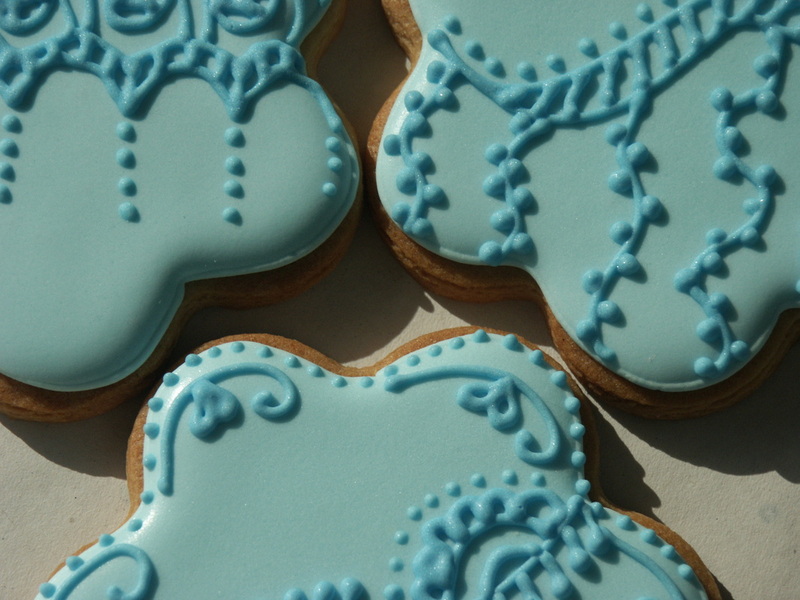 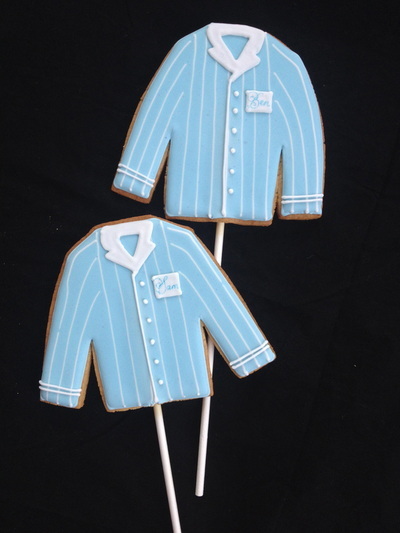 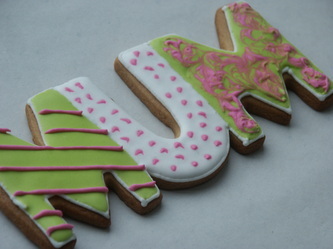 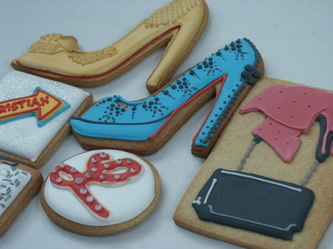 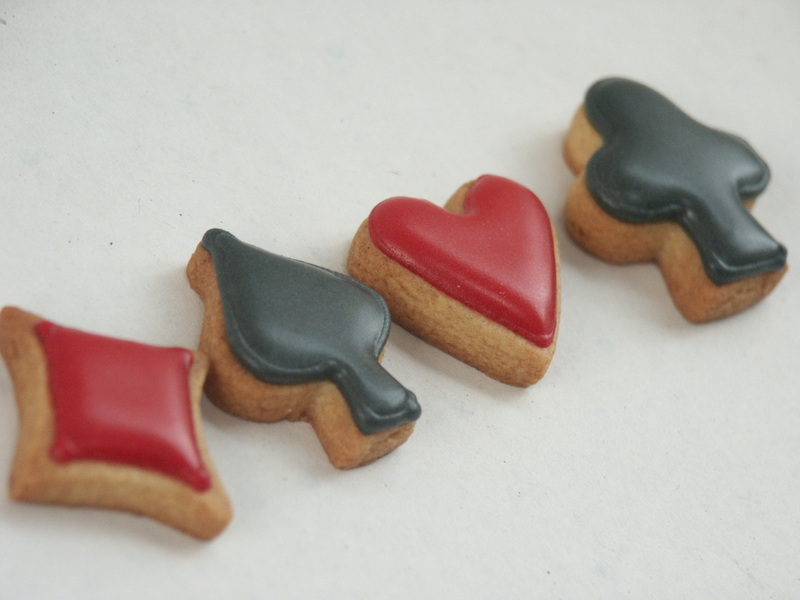 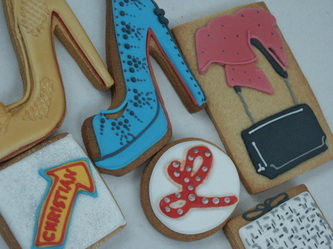 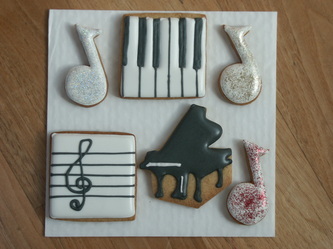 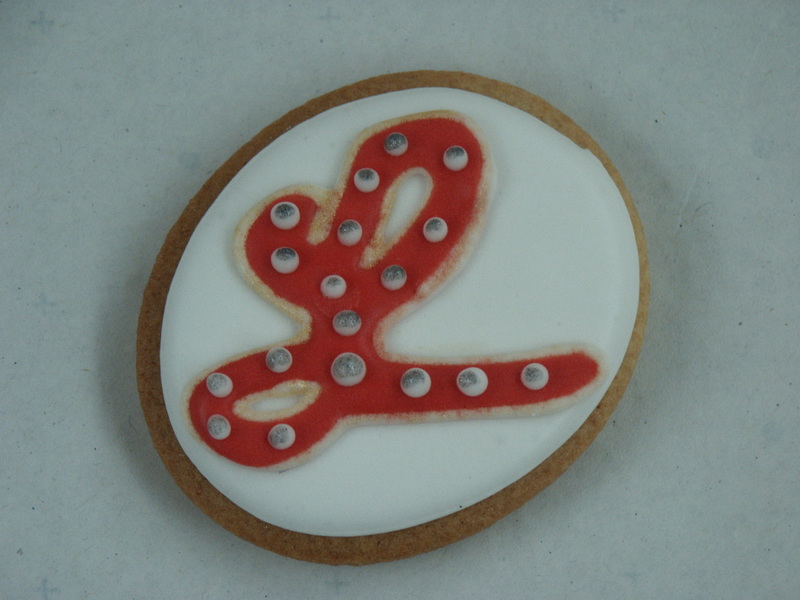 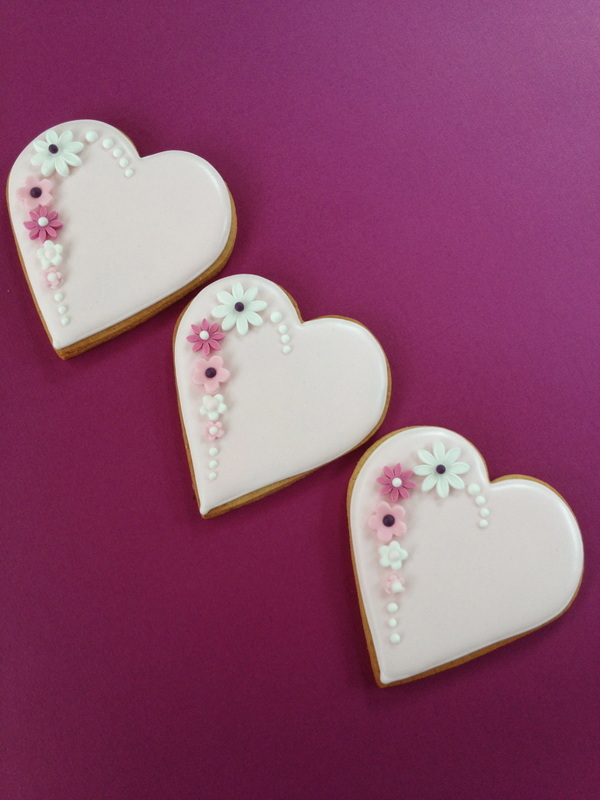 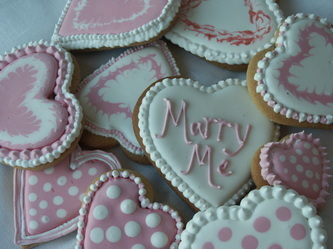 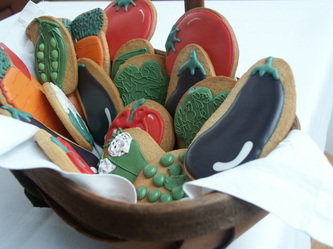 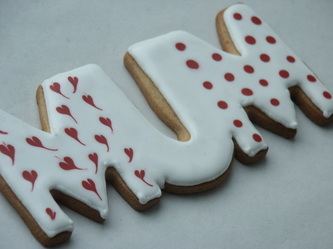 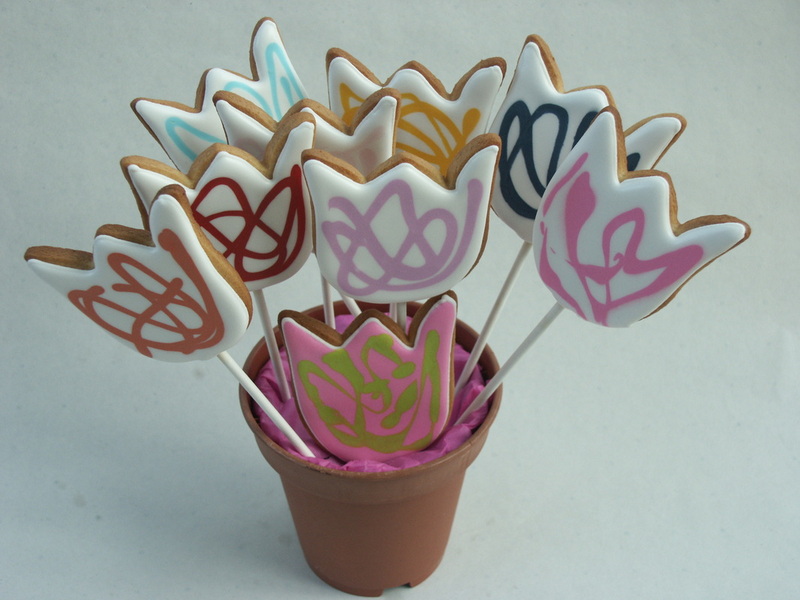 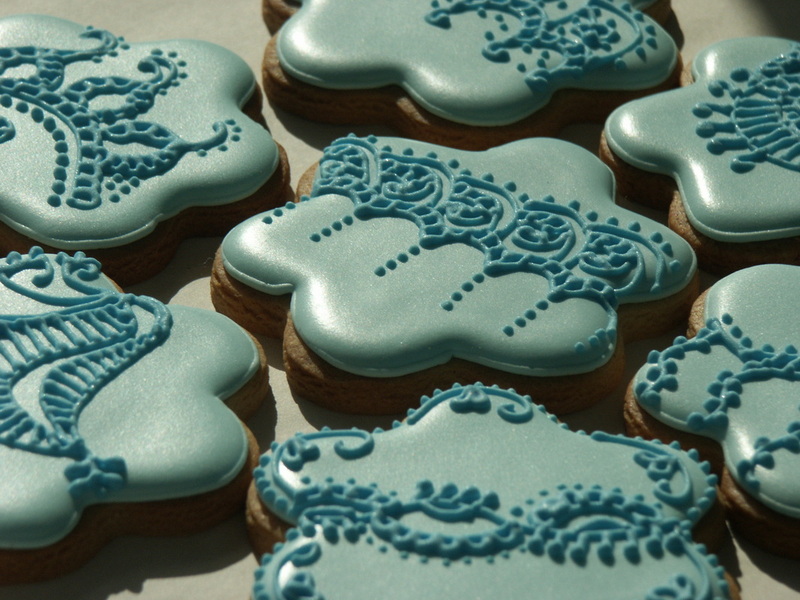 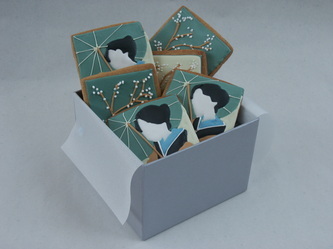 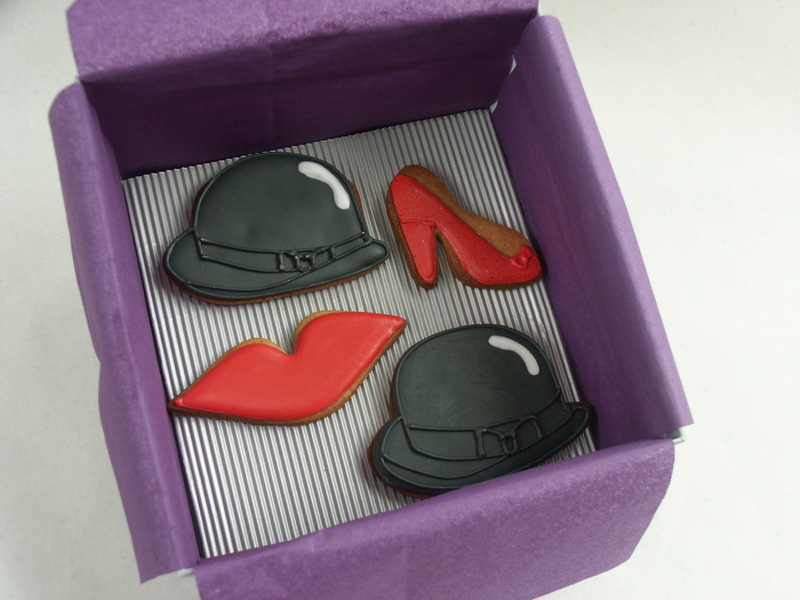 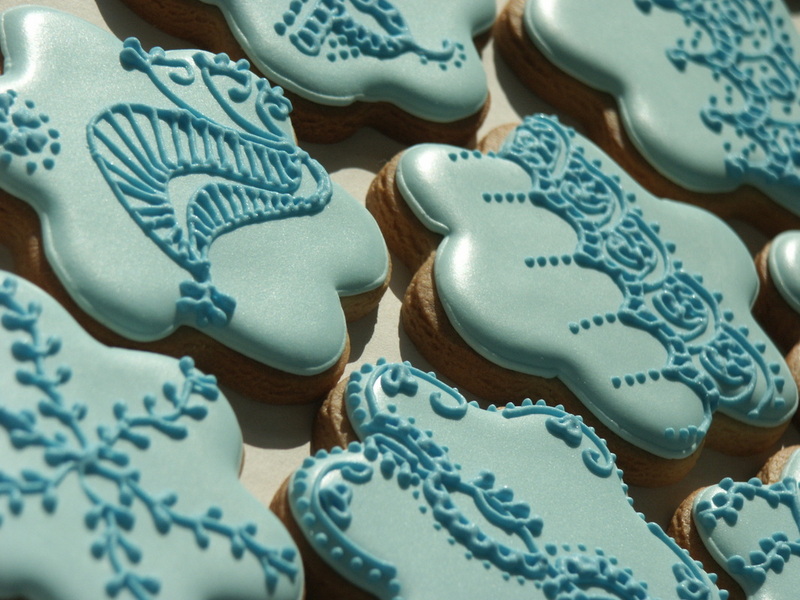 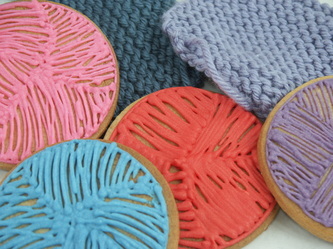 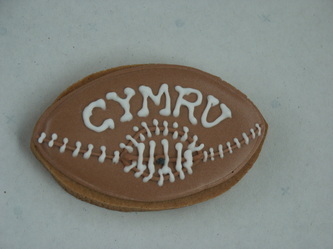 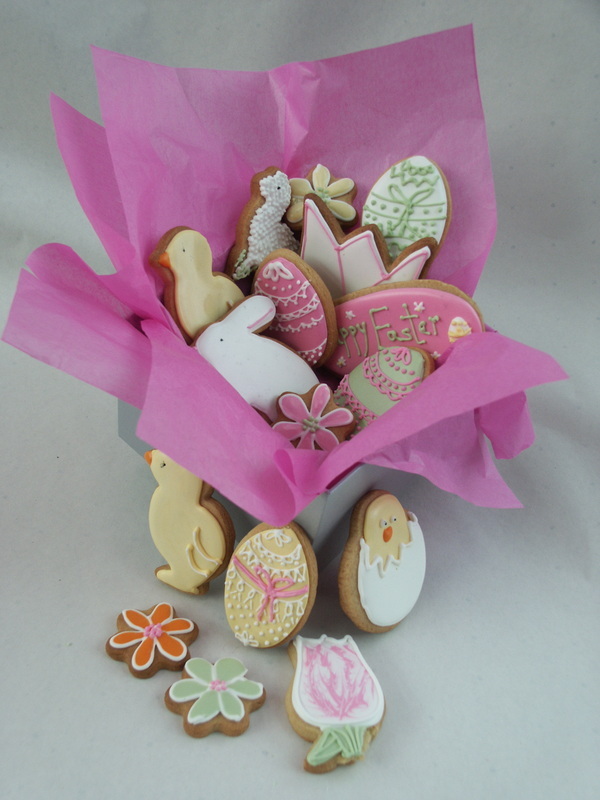 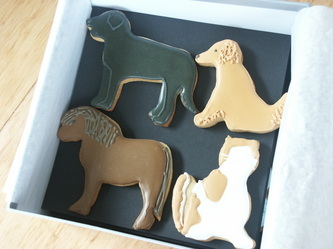 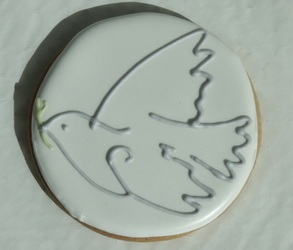 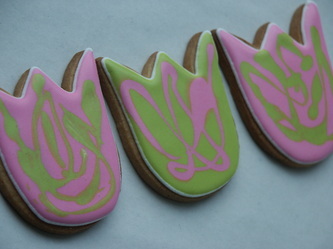 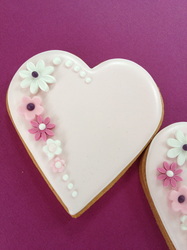 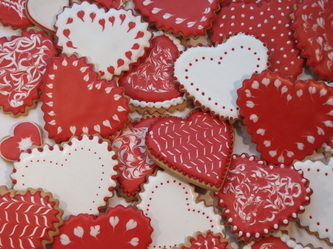 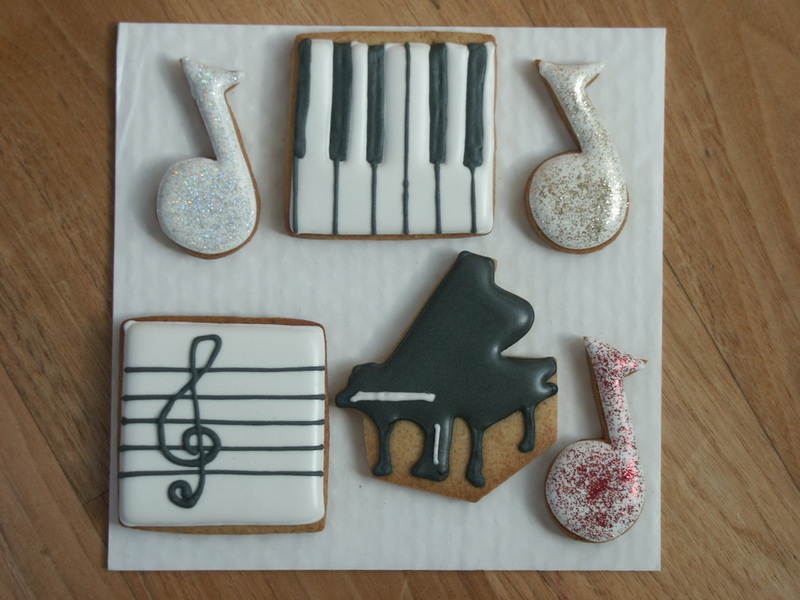 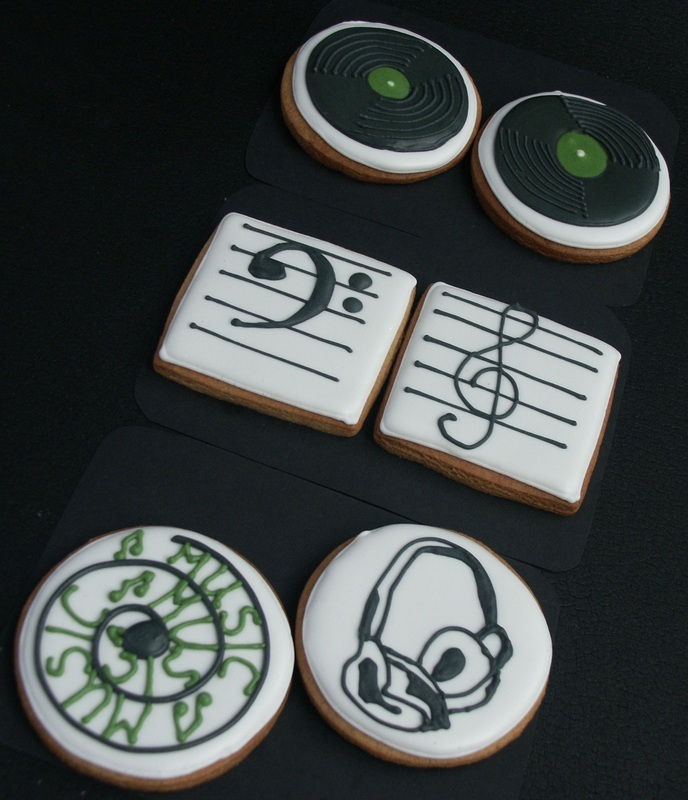 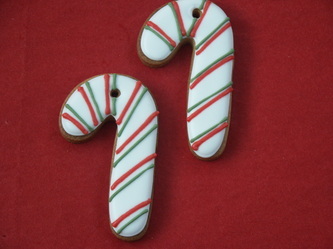 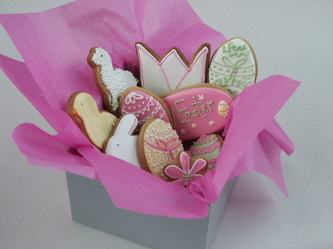 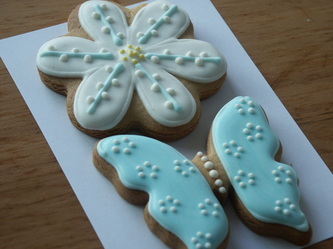 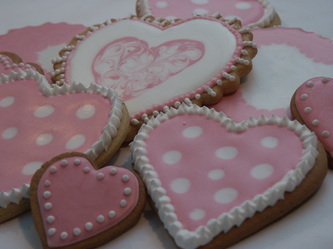 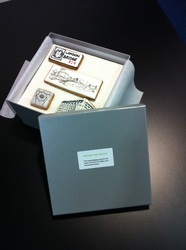 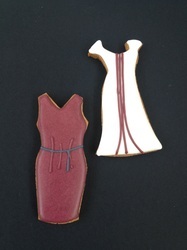 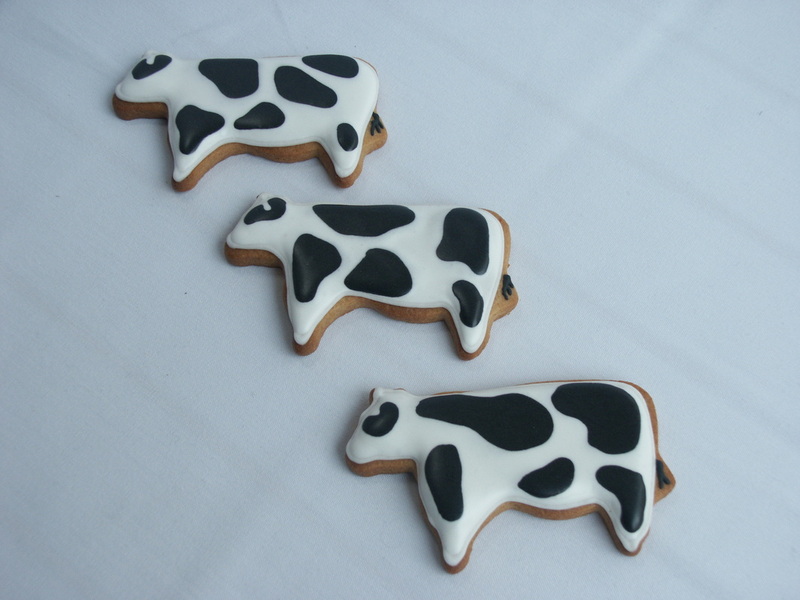 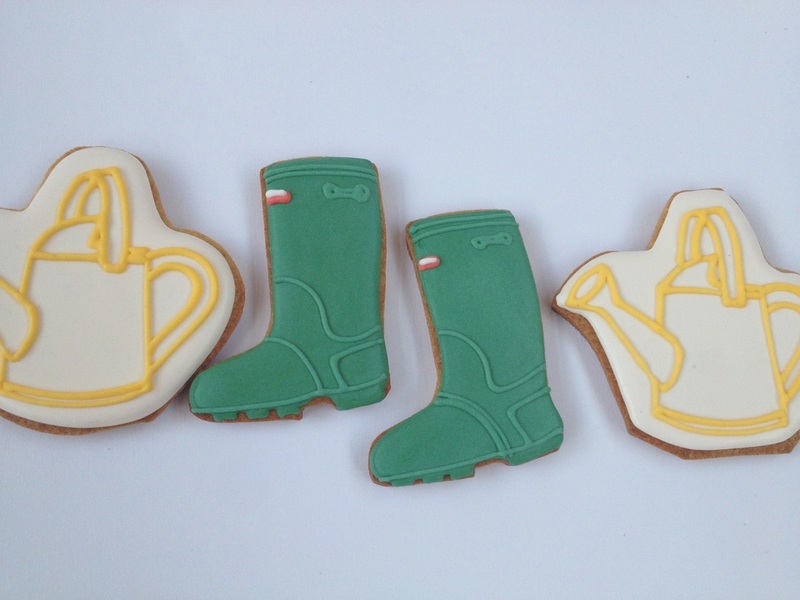 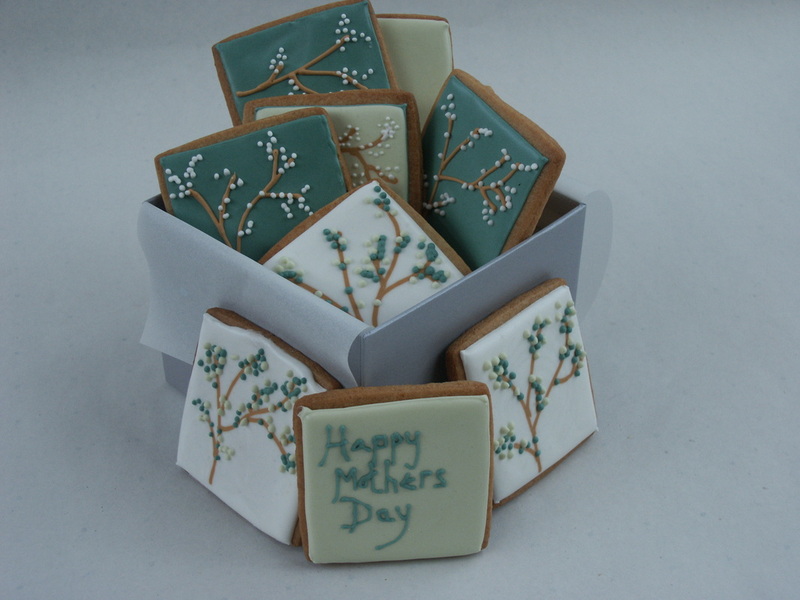 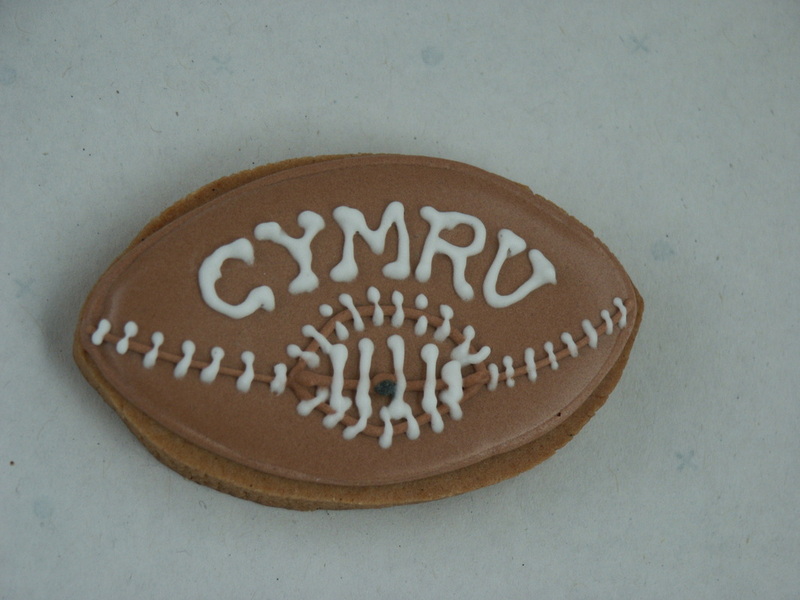 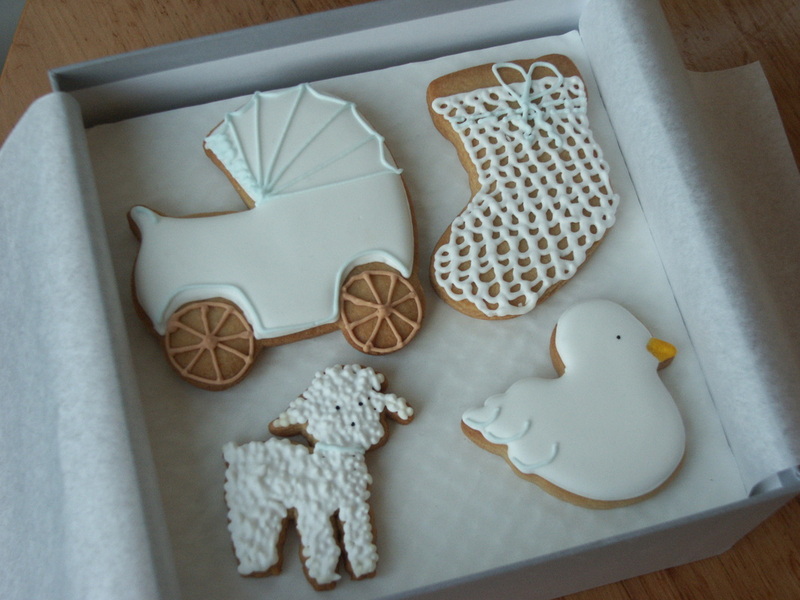 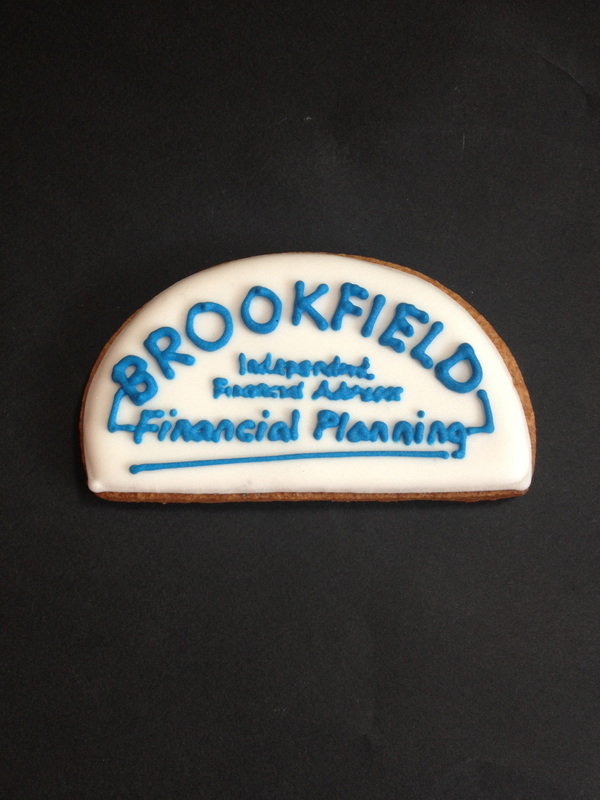 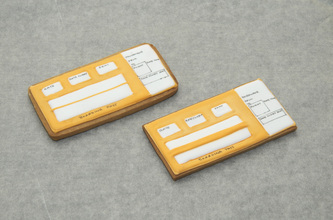 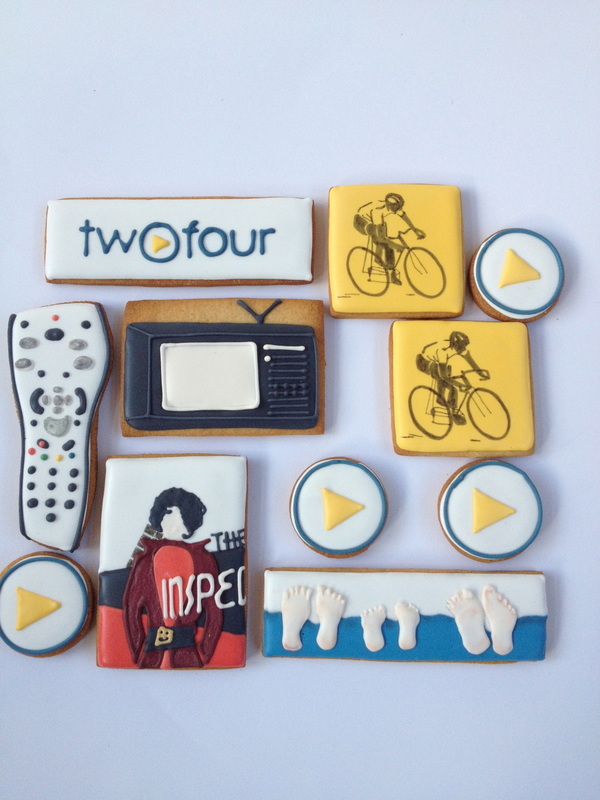 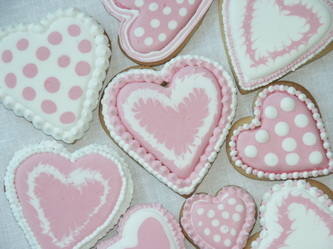 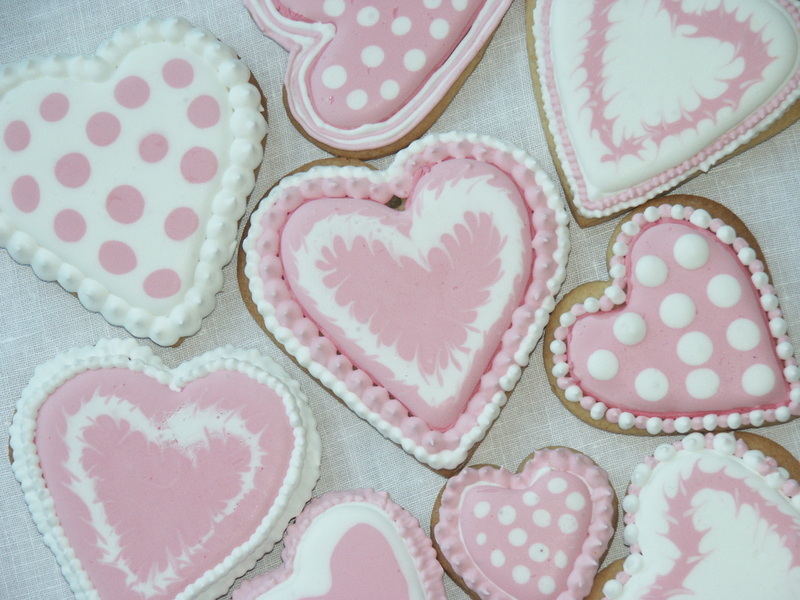 Why not send your clients some biscuits with their logo on : a single biscuit, a box or a bouquet. 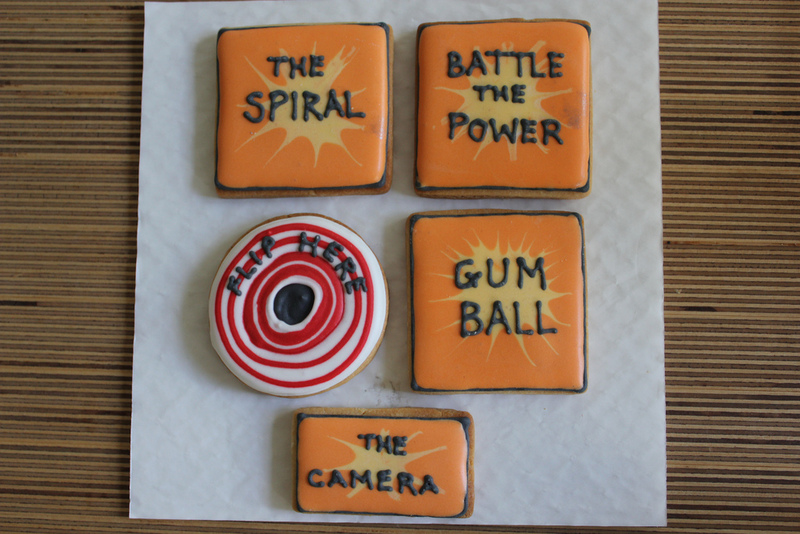 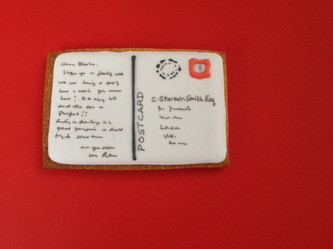 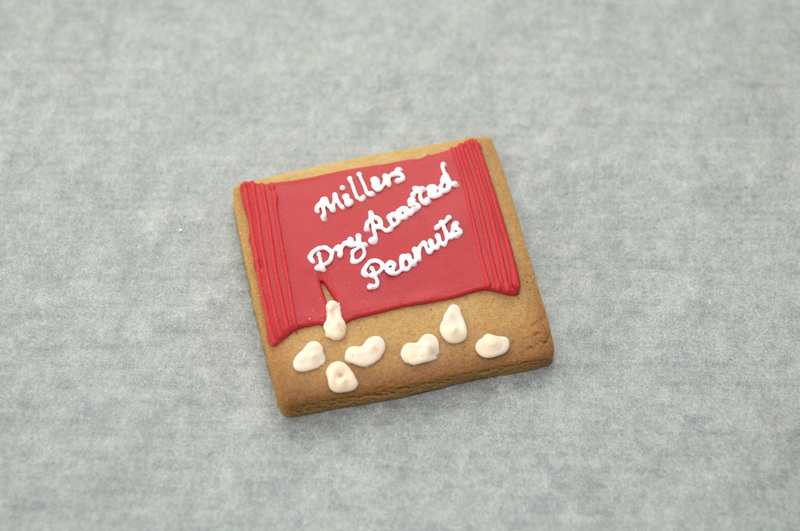 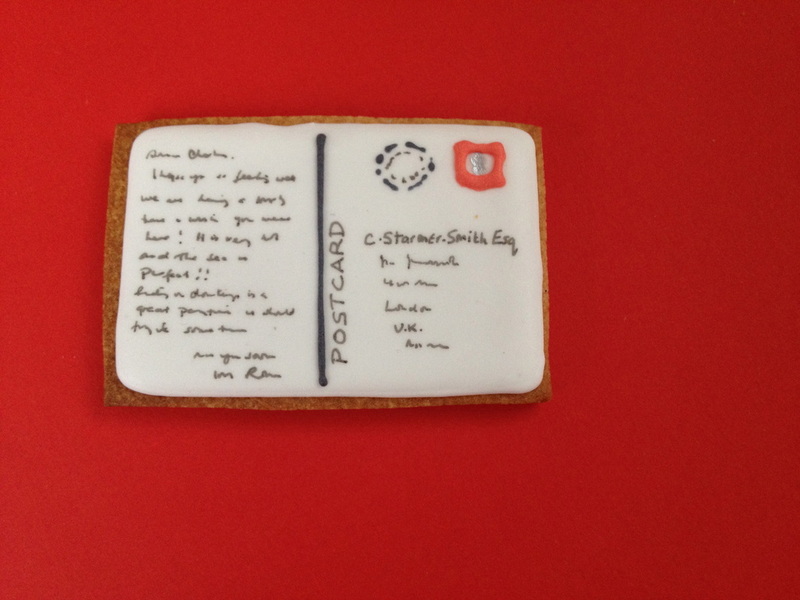 You can add your own message to each biscuit package for a truly original gift. 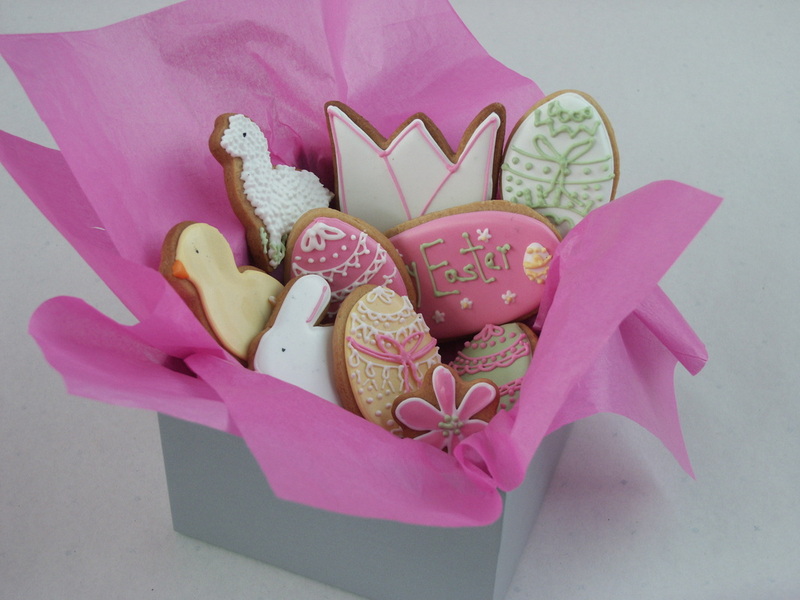 Send one of our beautiful bouquets to brighten up your office, reception or meeting room and bring a smile to everyone's face. 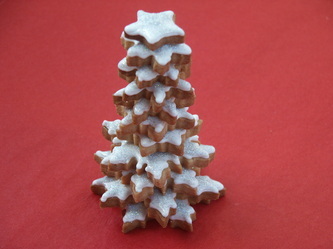 Seasonal, themed or just plain gorgeous , make an order every month for a discount. 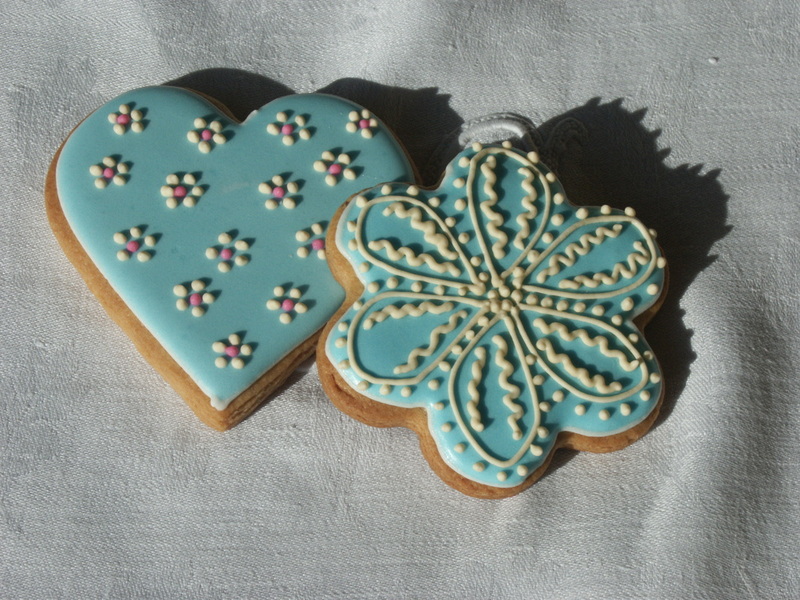 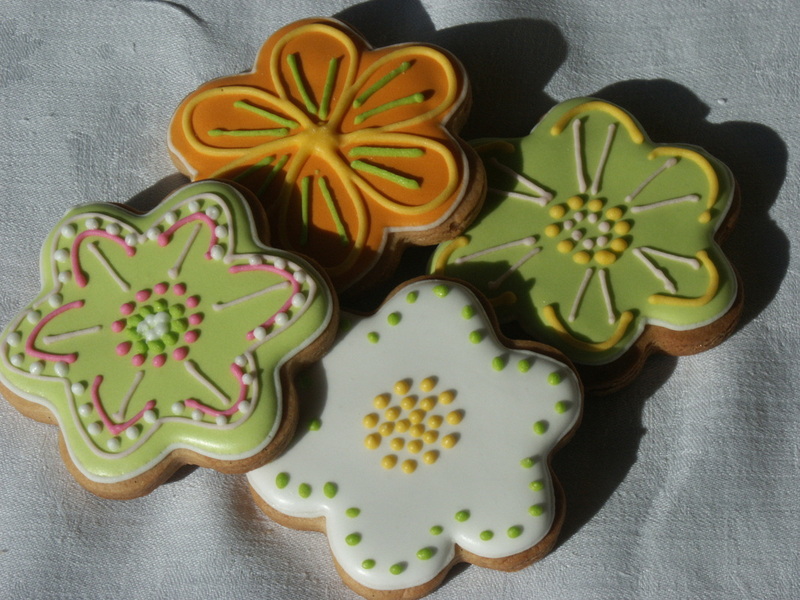 Why use flowers when biscuits taste much better! 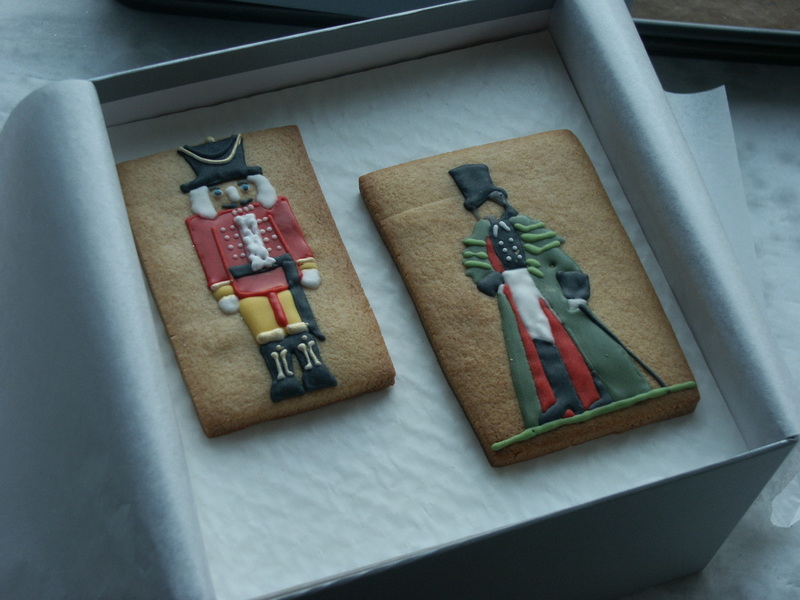 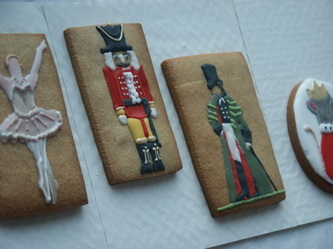 These Nutcracker biscuits were a bespoke order which included Uncle Drosselmeyer, the Sugar Plum Fairy, the Soldier and the Mouse King. 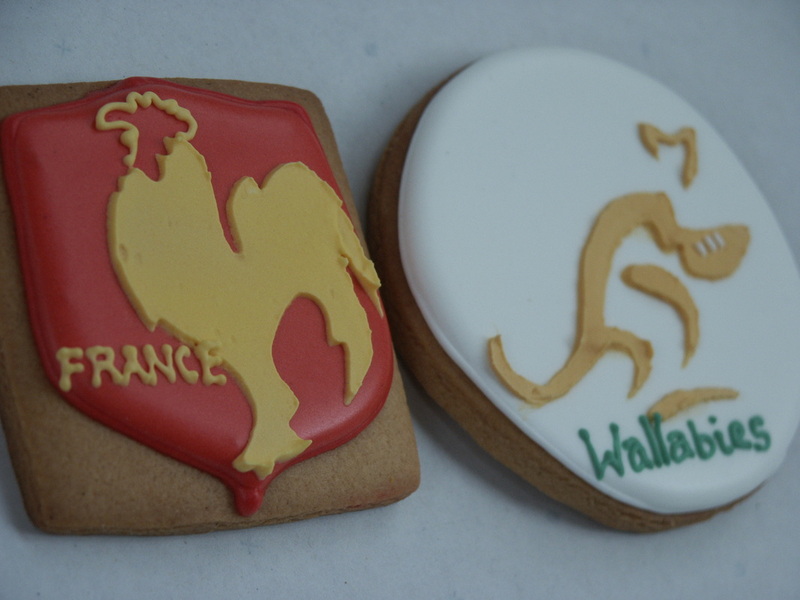 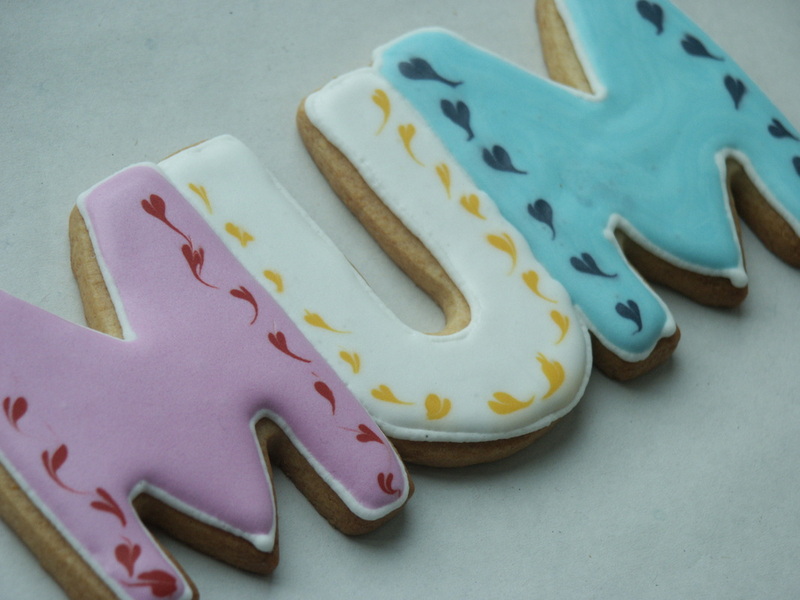 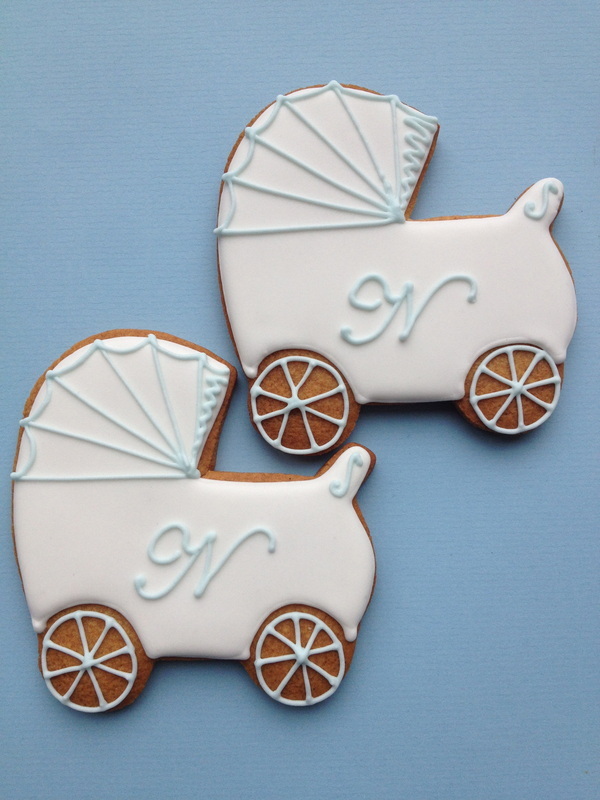 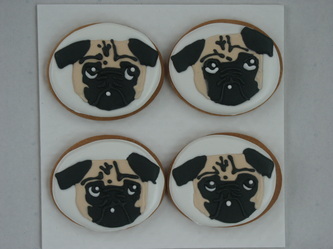 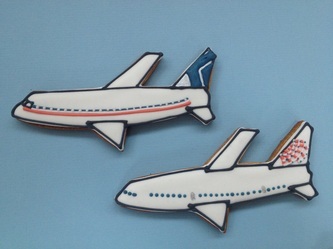 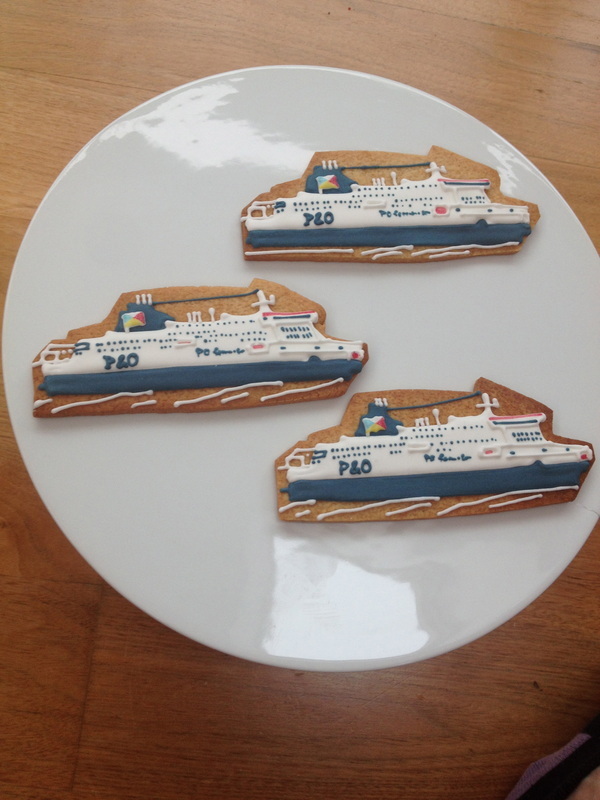 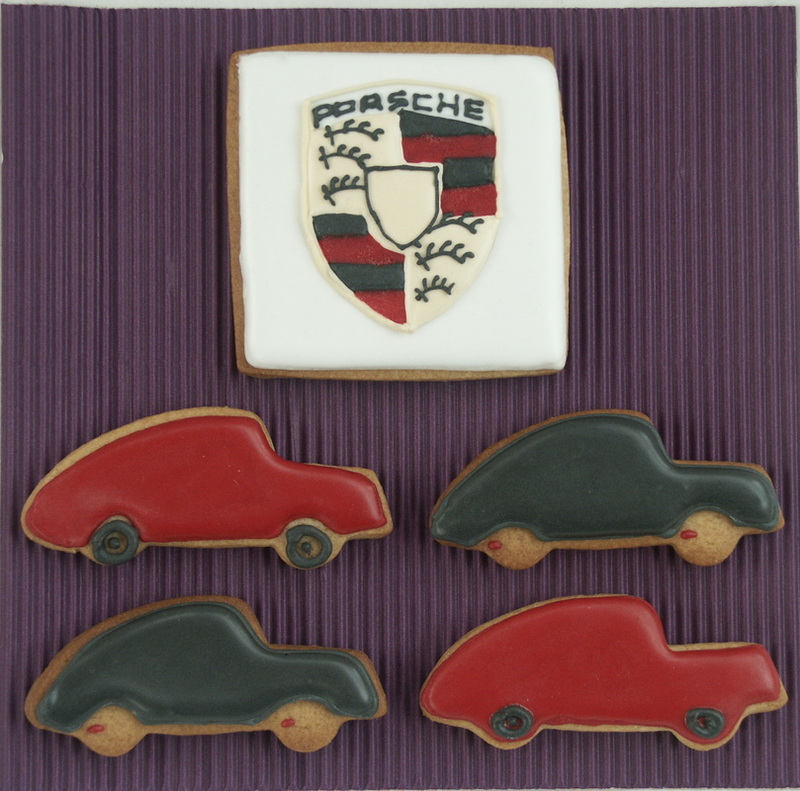 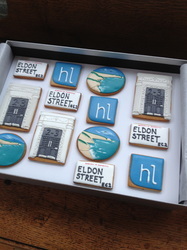 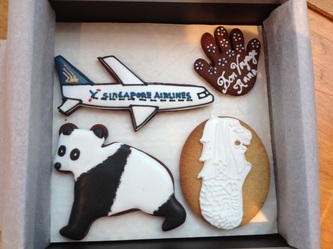 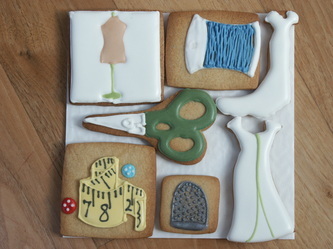 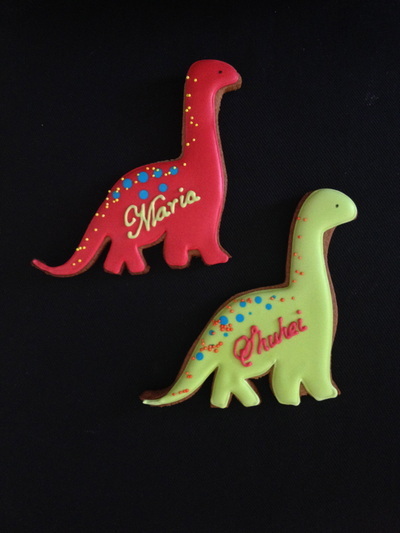 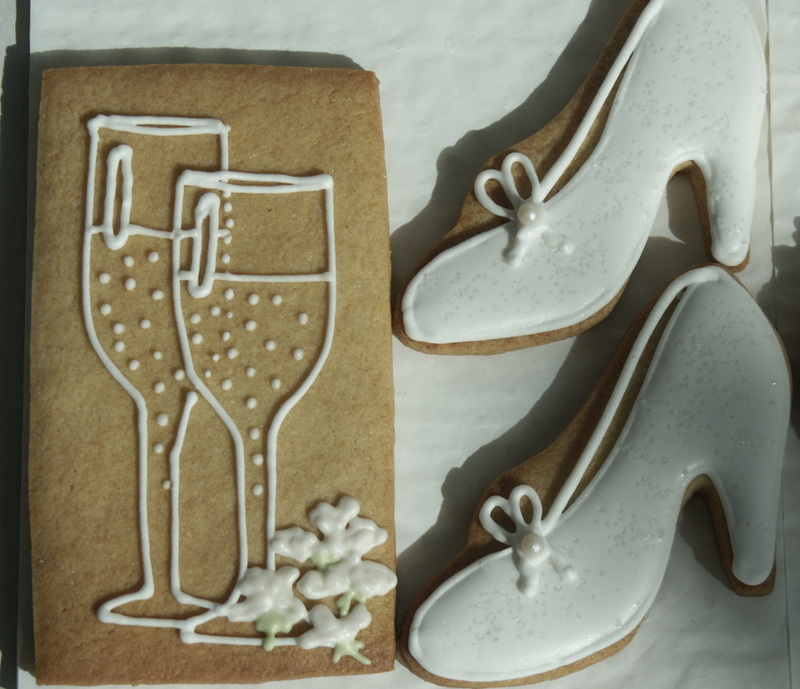 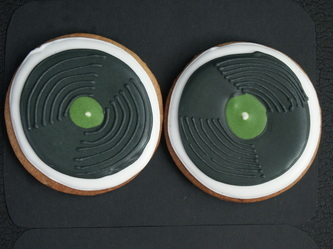 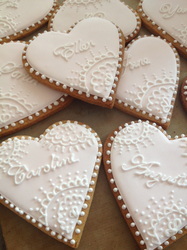 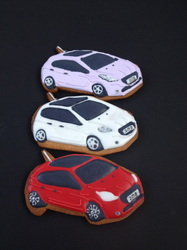 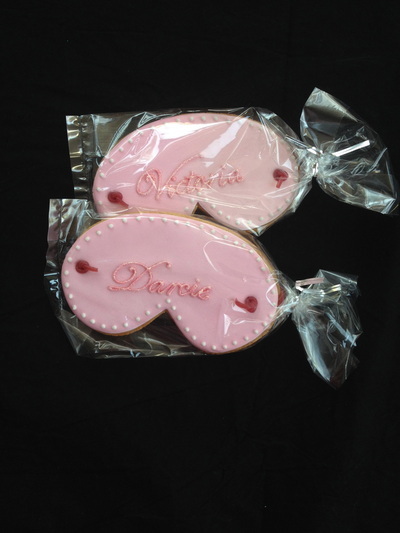 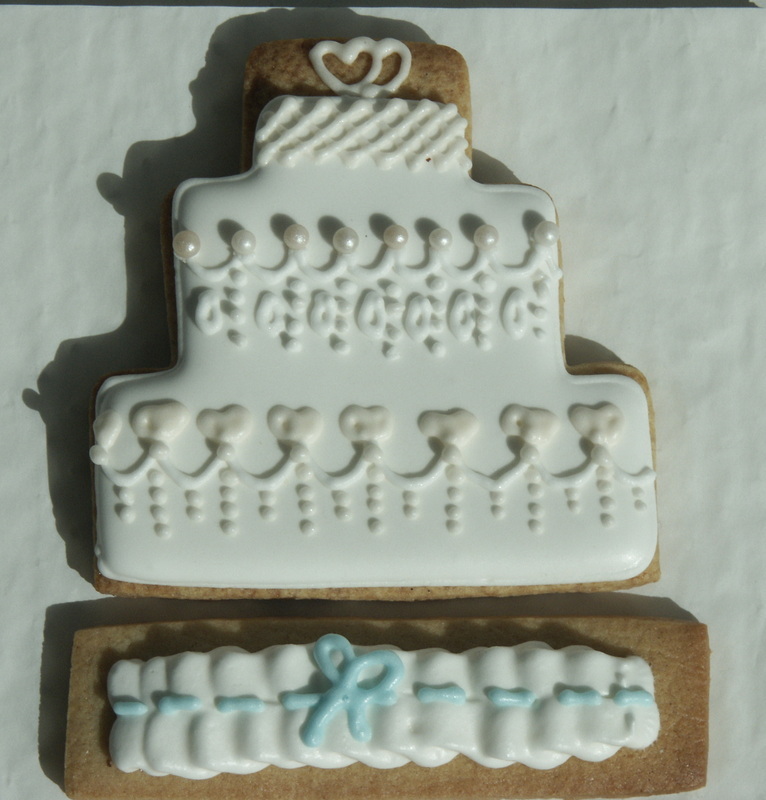 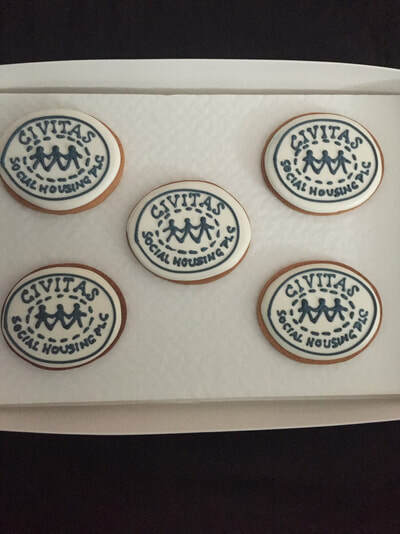 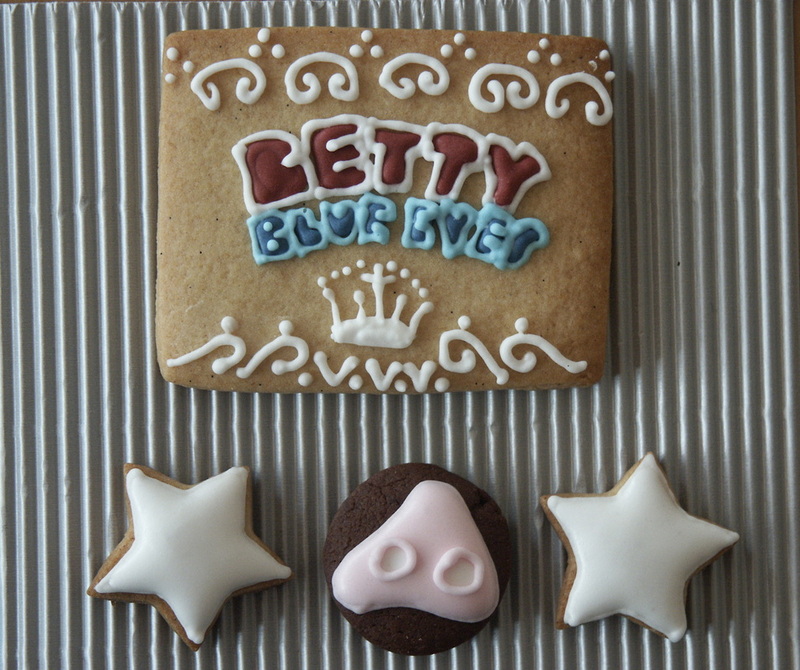 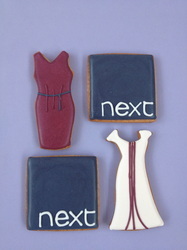 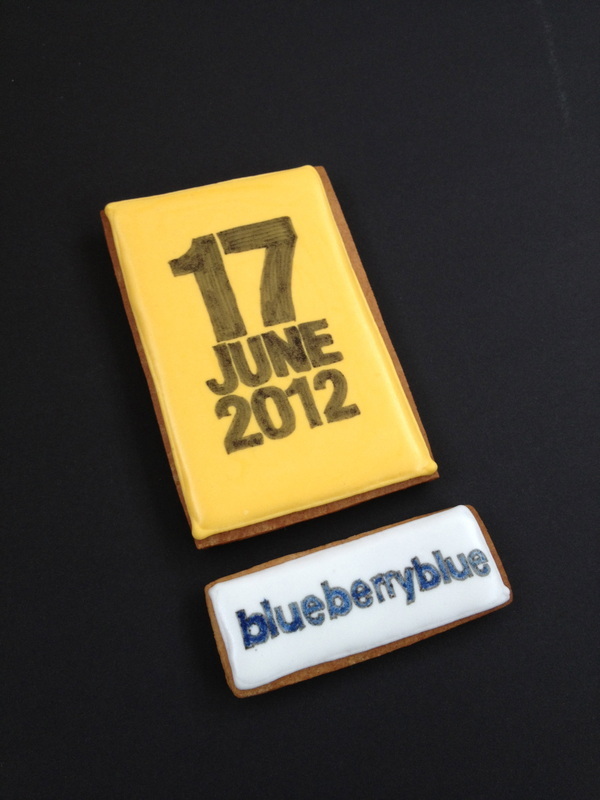 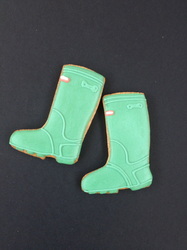 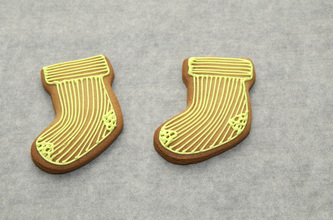 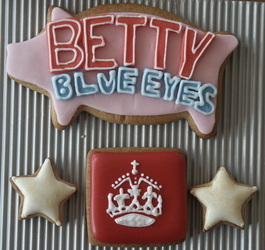 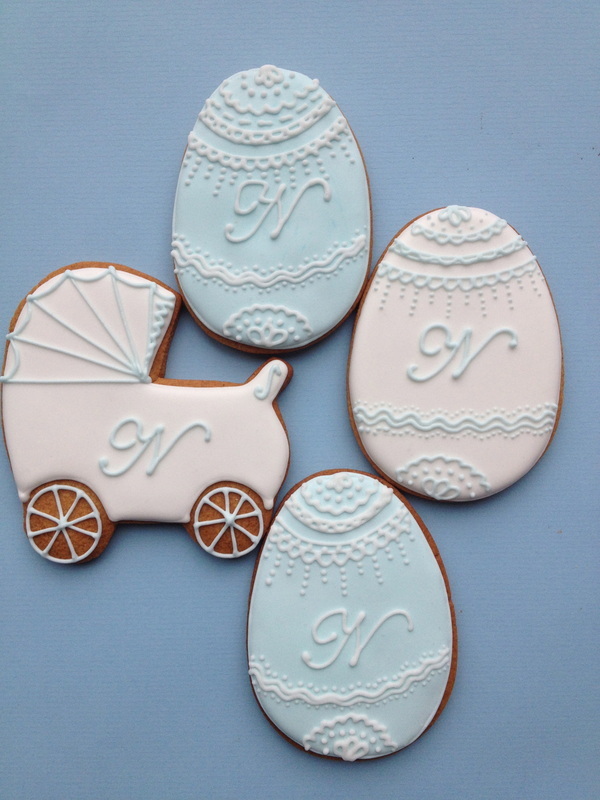 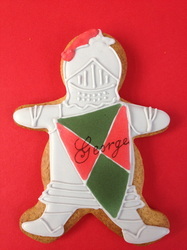 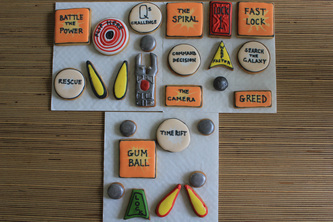 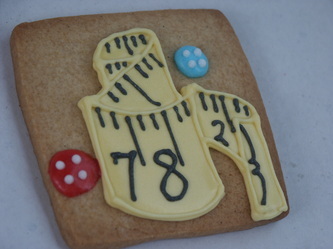 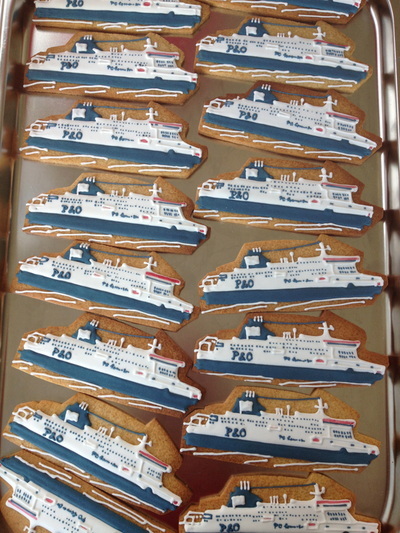 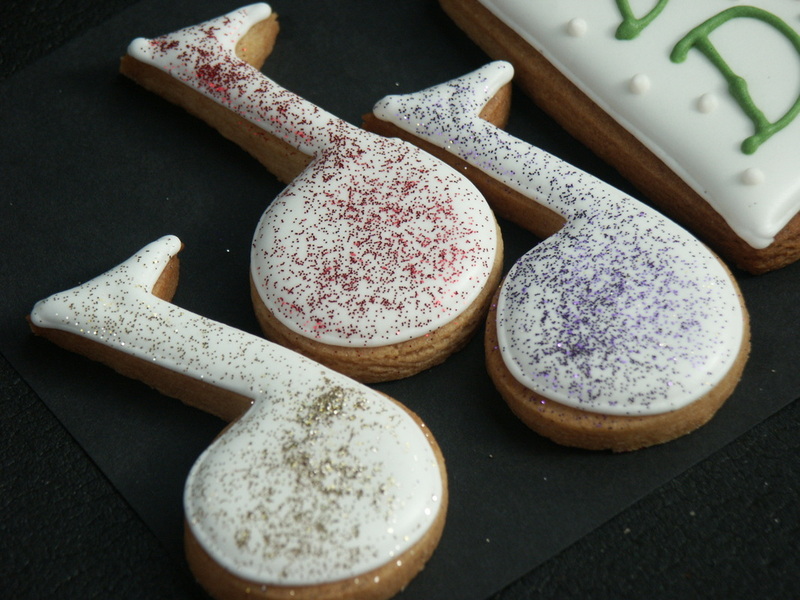 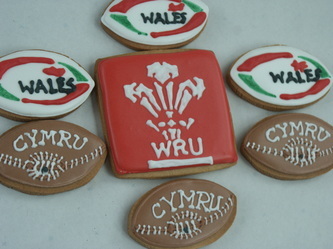 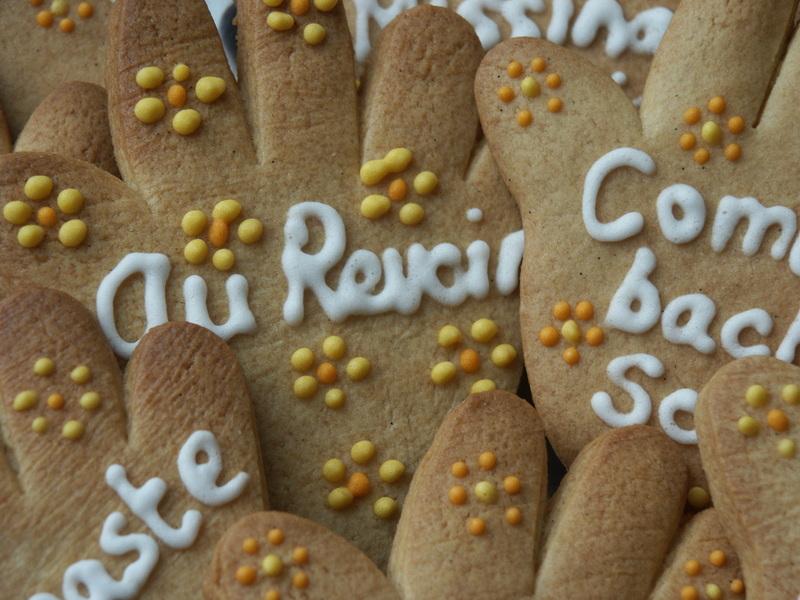 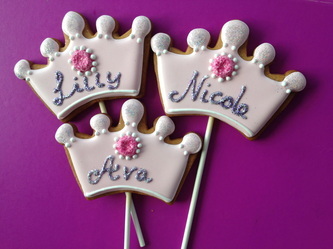 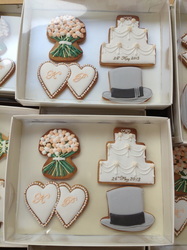 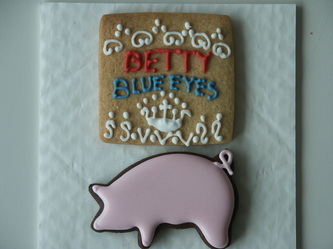 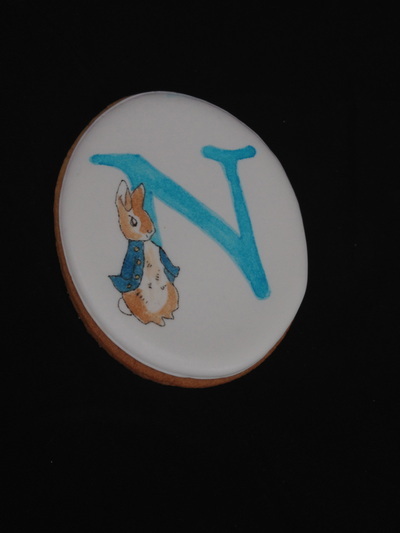 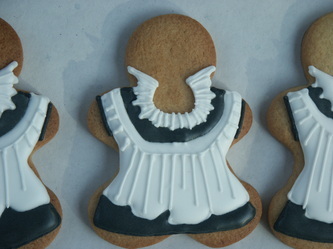 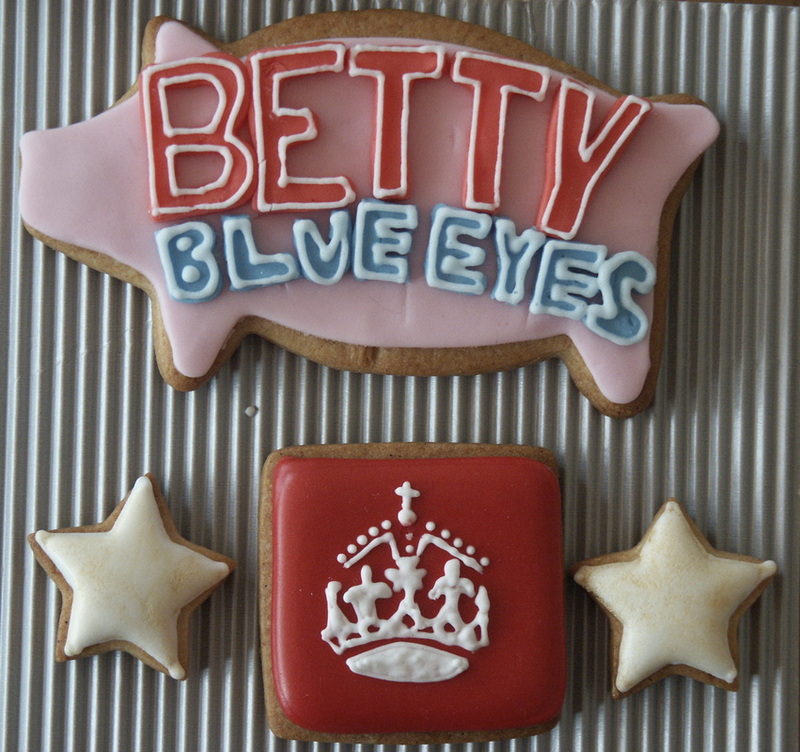 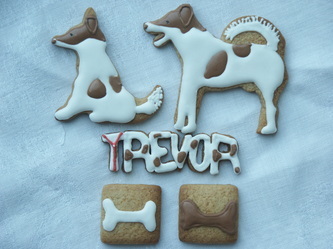 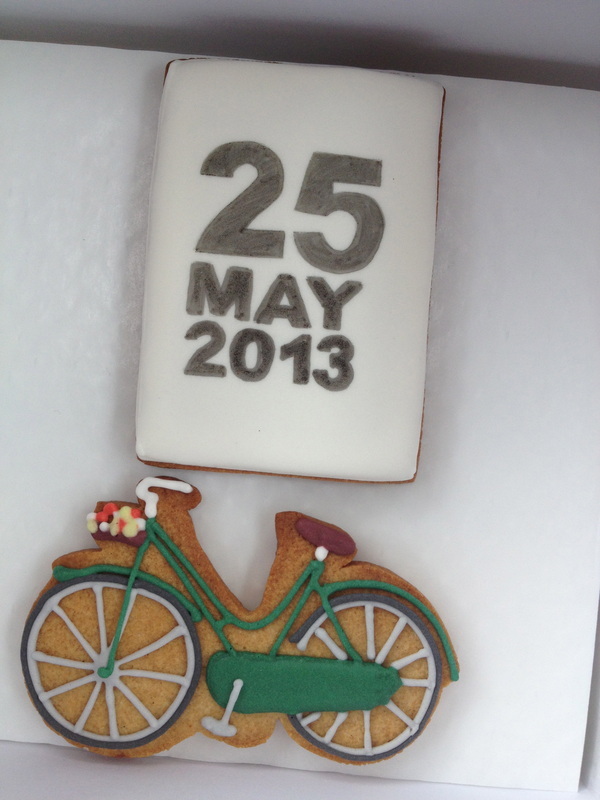 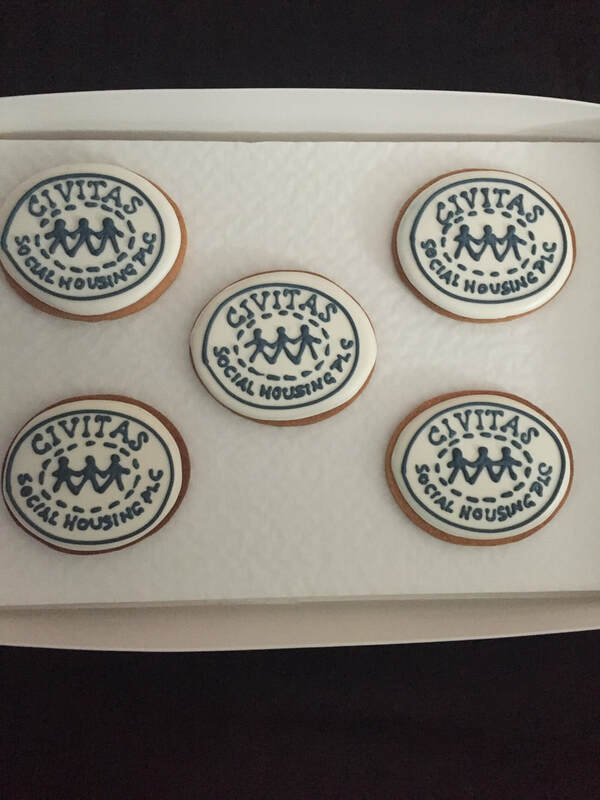 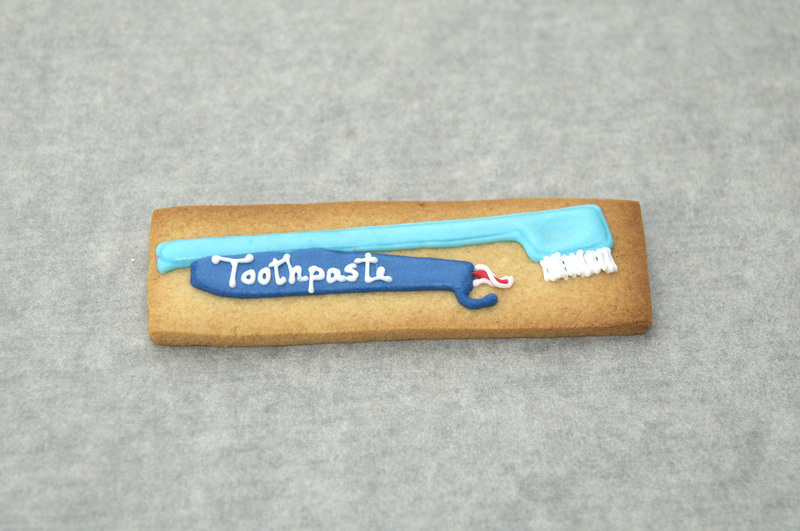 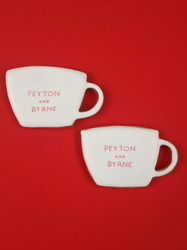 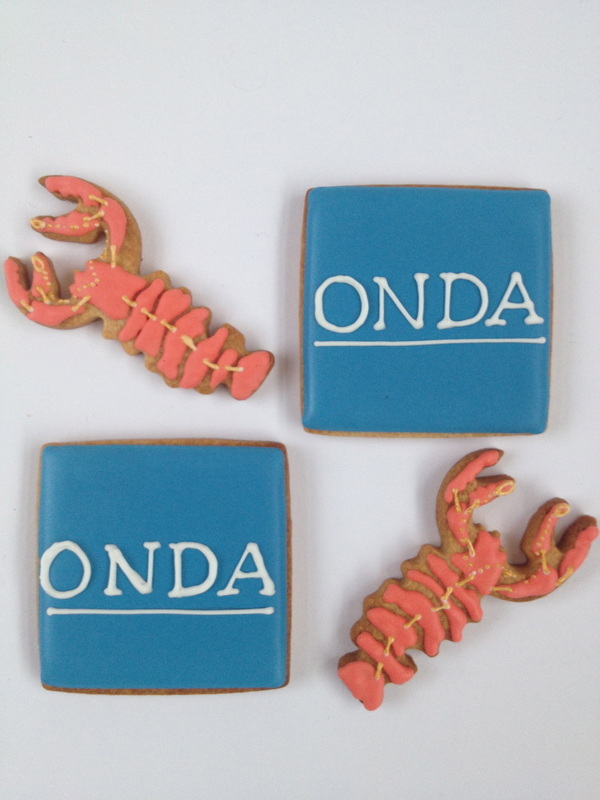 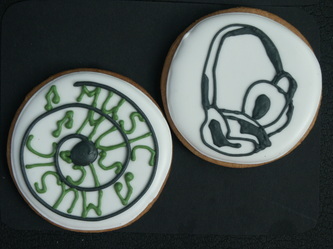 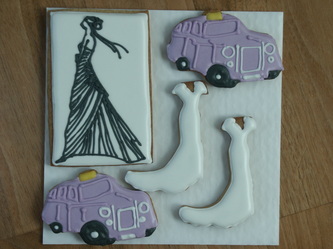 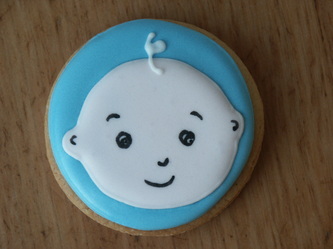 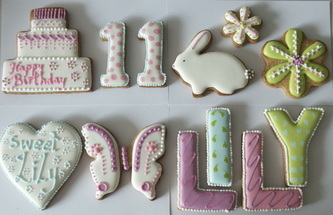 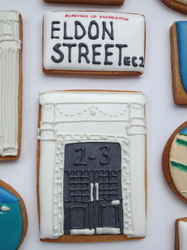 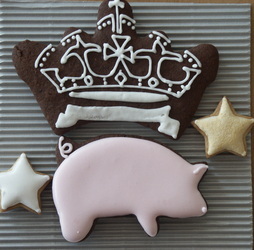 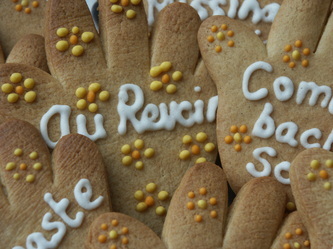 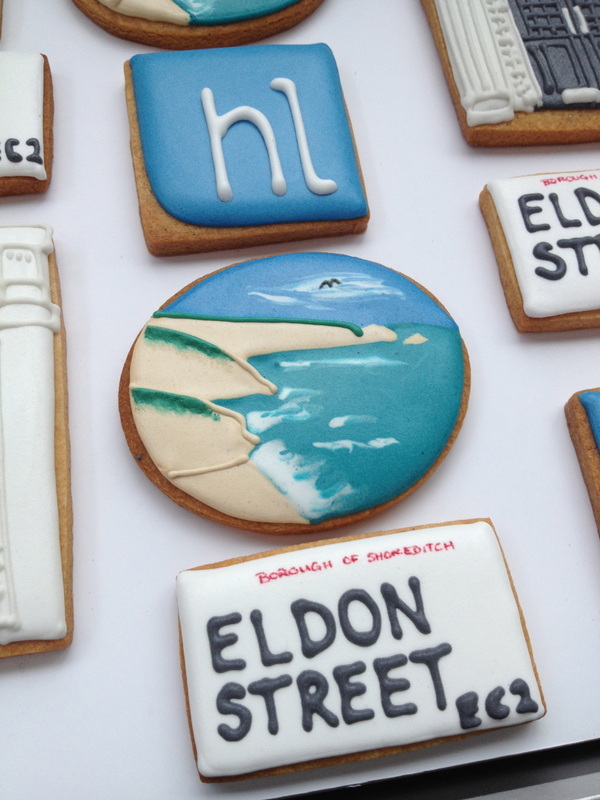 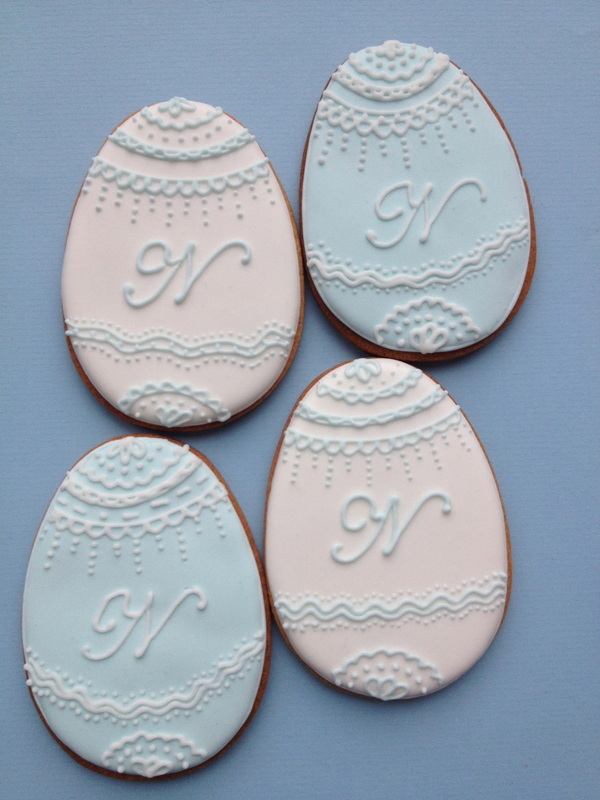 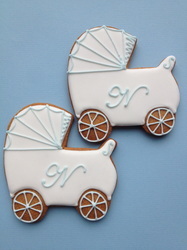 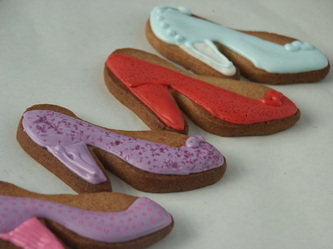 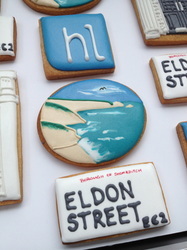 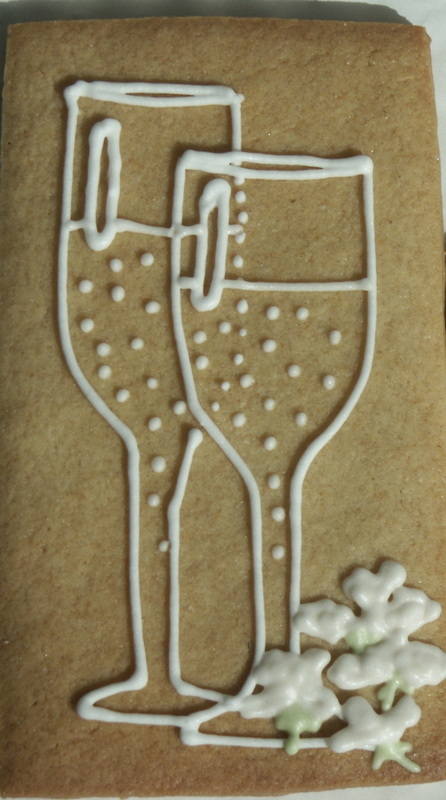 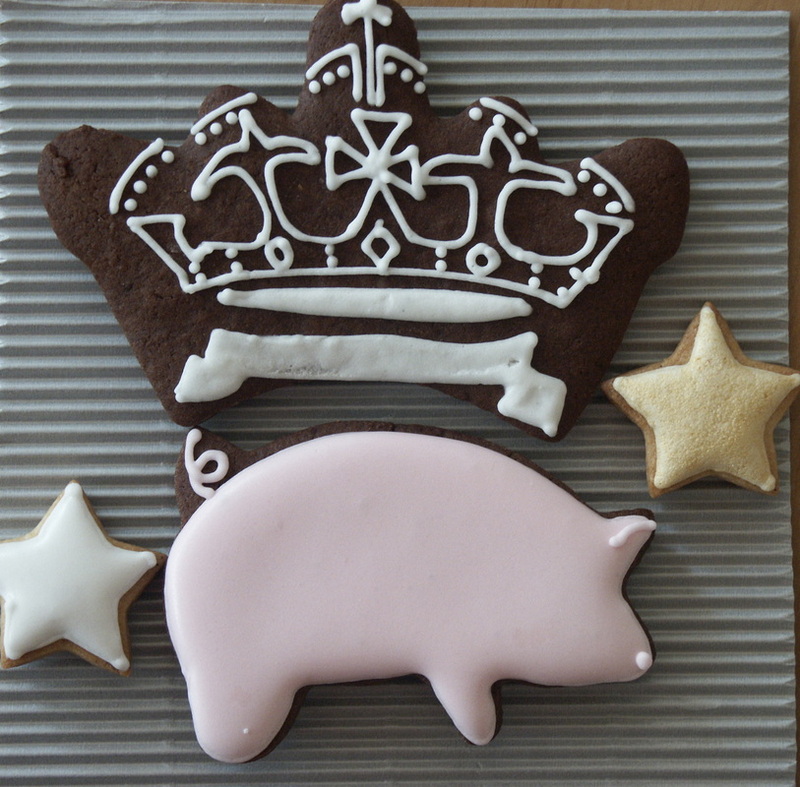 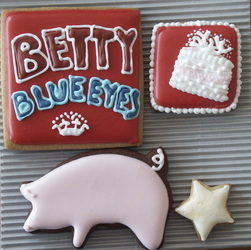 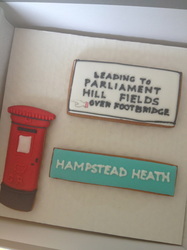 Personalised biscuits to add a touch of joy and congratulations. 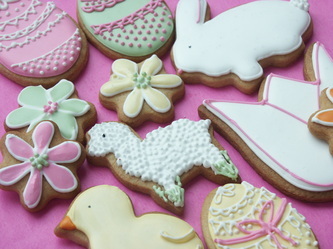 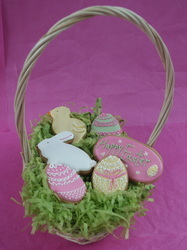 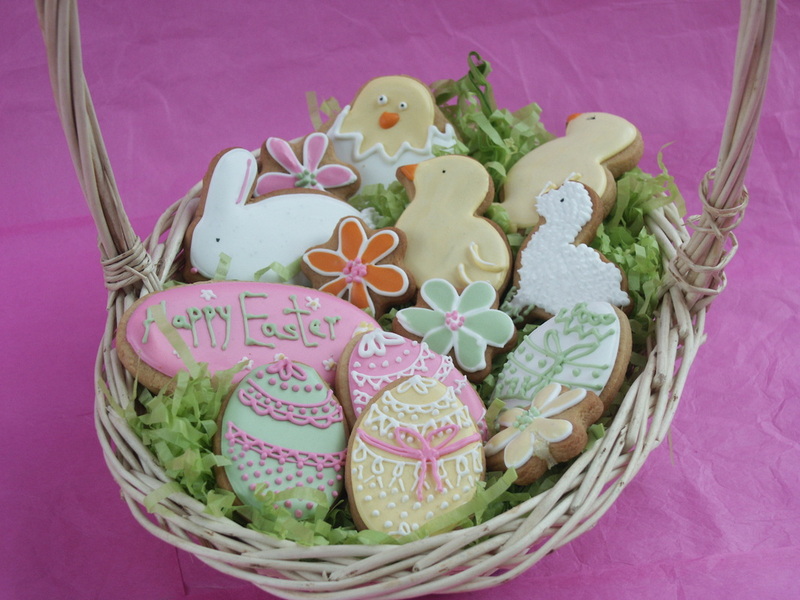 Send an Easter basket or box full of spring lambs, daffodils, bunnies and delicate easter eggs. 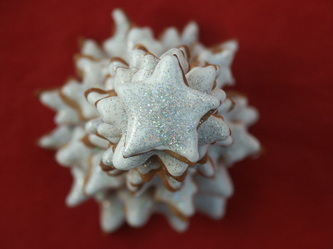 All individually iced to make an exquisite gift that also tastes delicious. Call 07775 833 892 to place an order for delivery by courier or post in London or first class Royal Mail elsewhere. 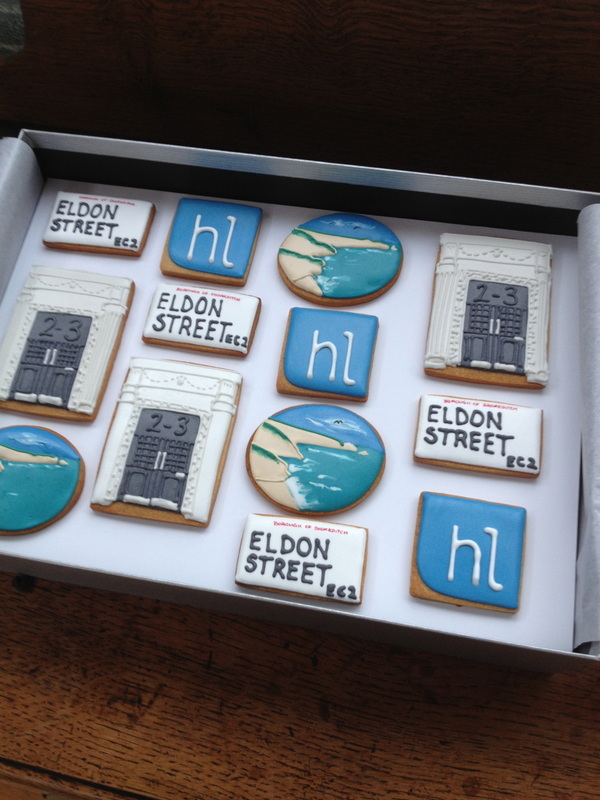 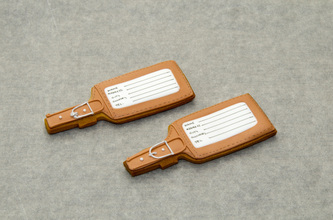 Welcome someone to their new home with a personalised gift. 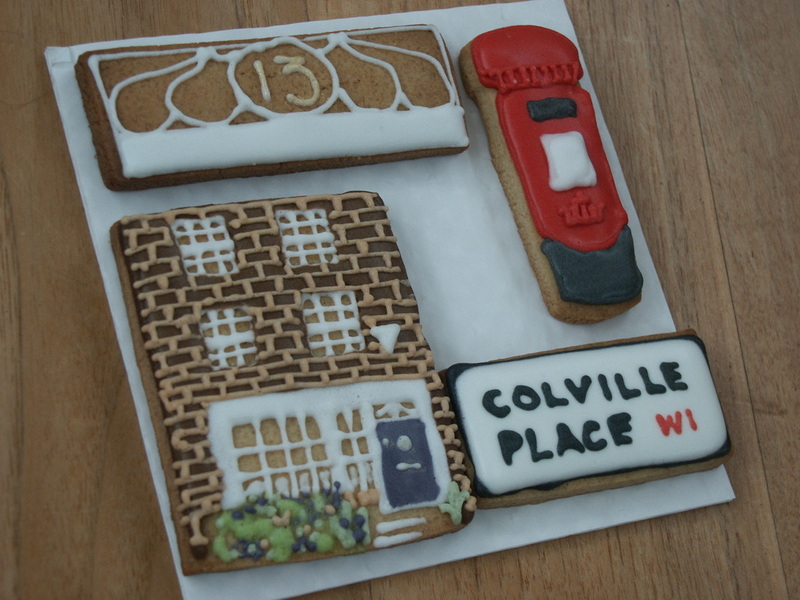 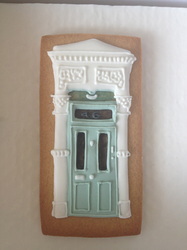 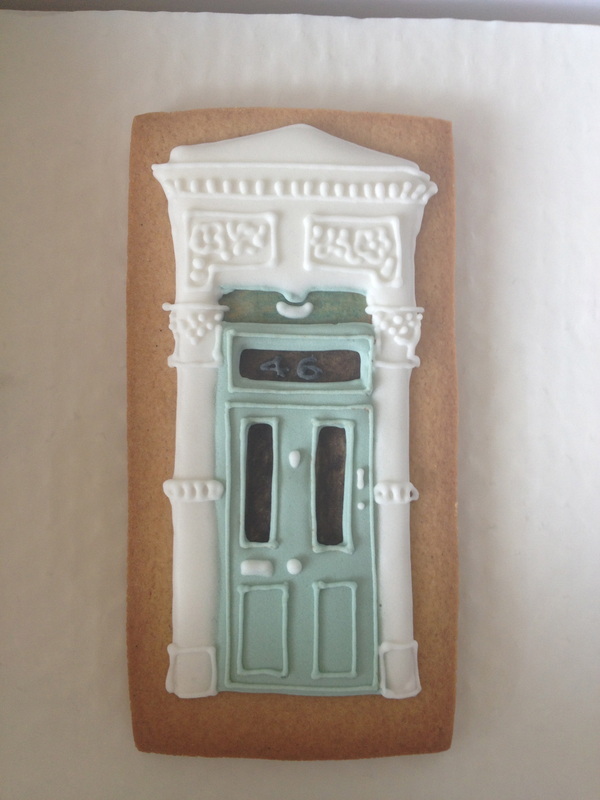 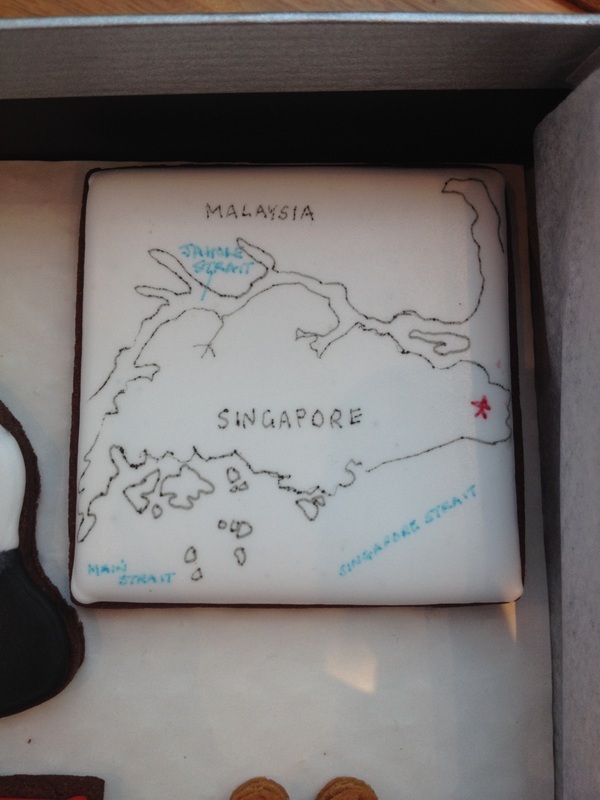 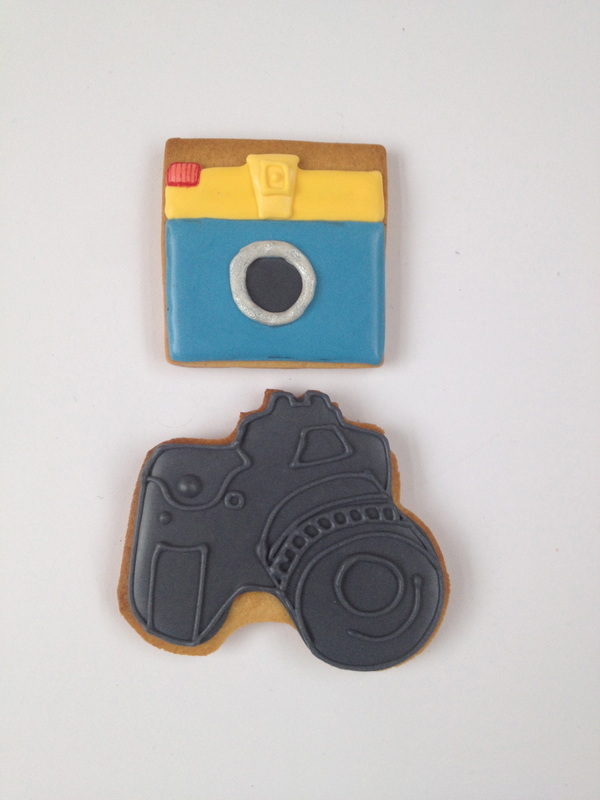 Send us pictures of their new abode and we'll create a tasty treat. 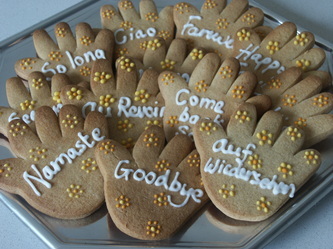 Send a perfect golden handshake to someone who's leaving! 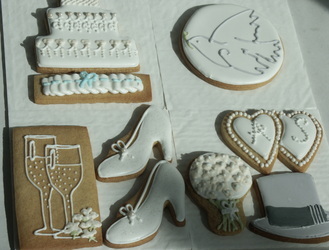 Delicate & beautiful designs for any occasion. 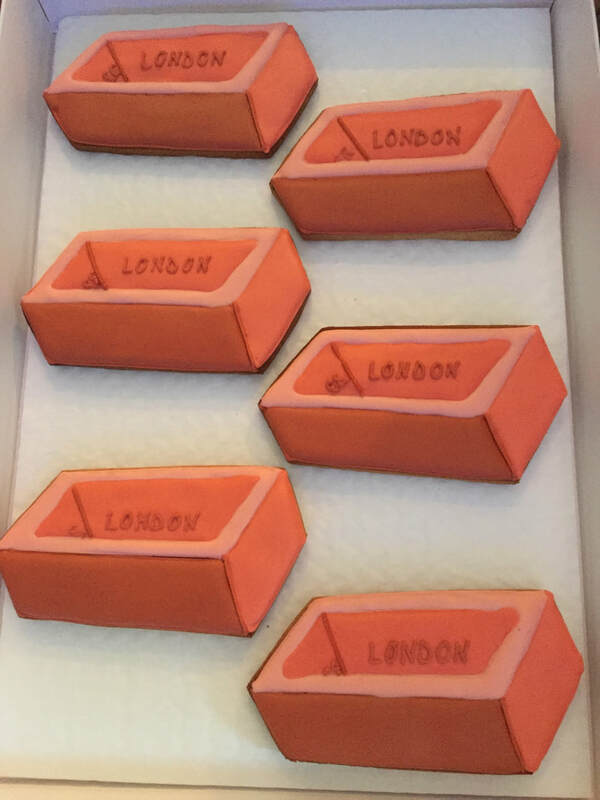 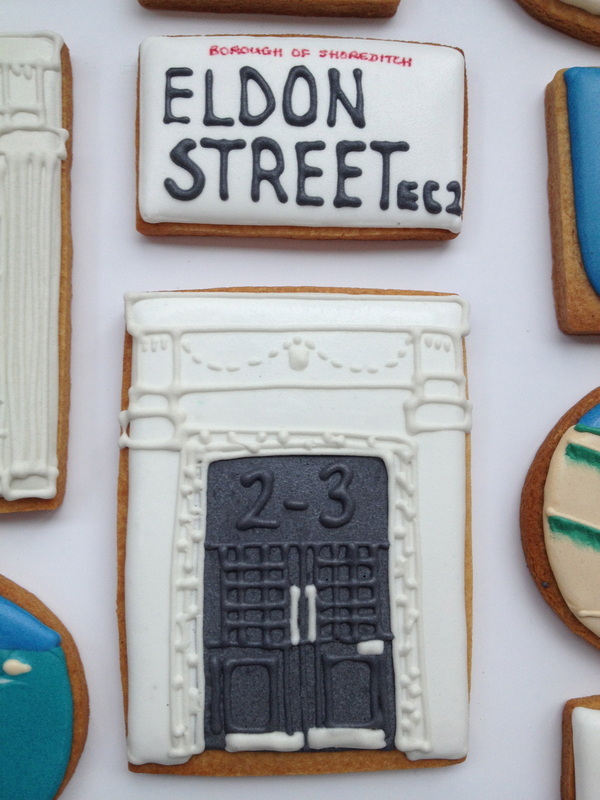 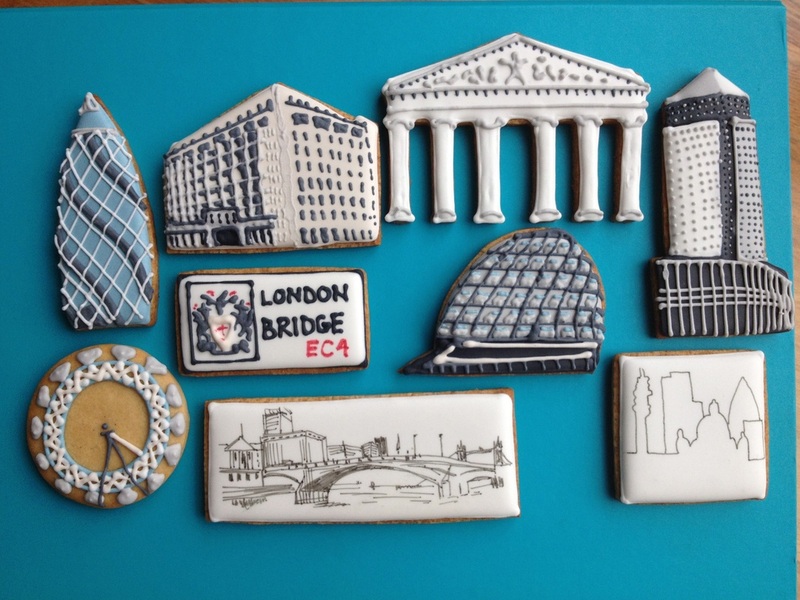 Welcome a client, friend or colleague to London with a basket of biscuits which include major landmarks, tube signs, road names, london buses. 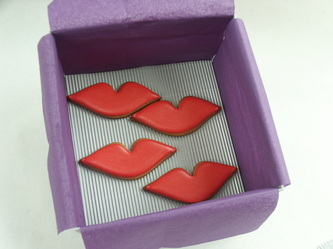 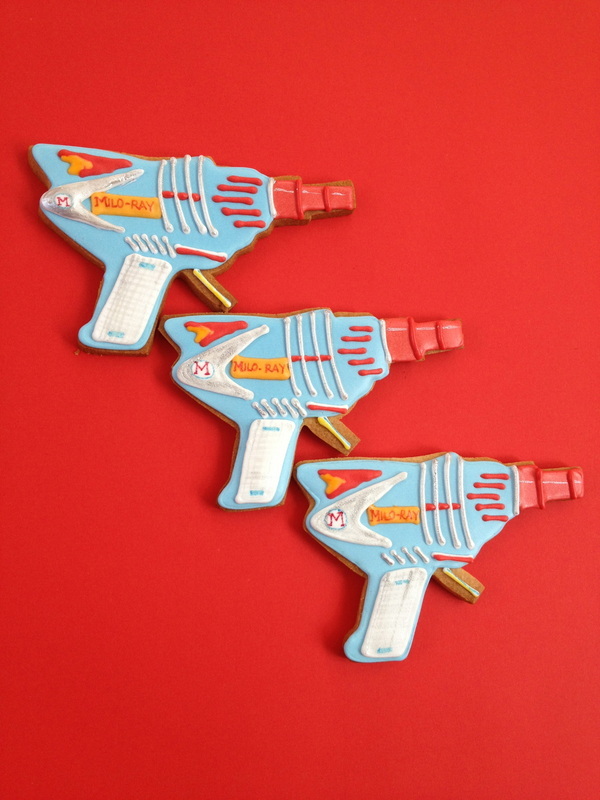 Make them feel extra special with this original and fun gift. 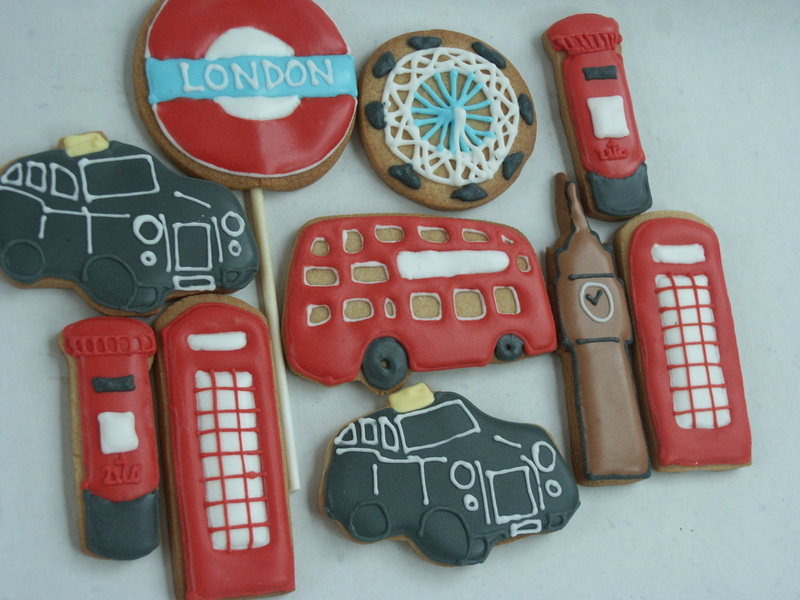 Send some of the sights of London for a fun present. 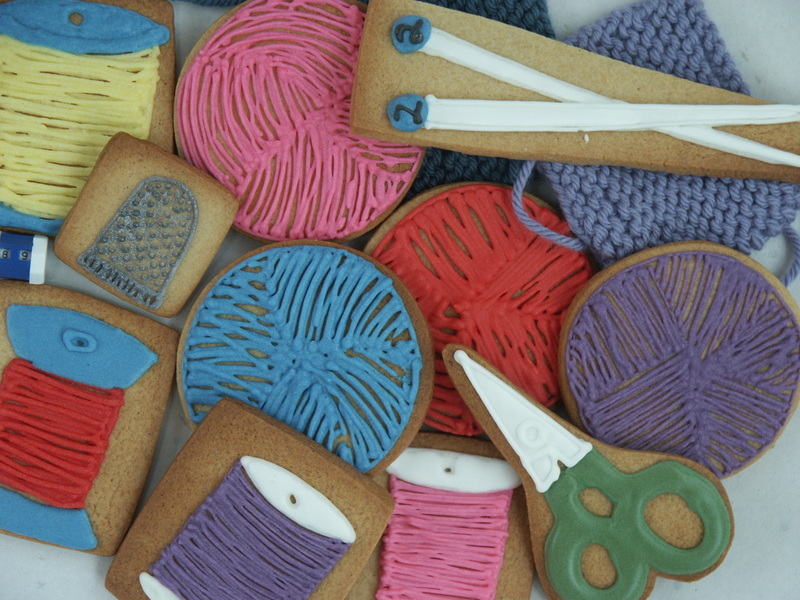 Too busy to sit and knit? Send a sewing kit instead! 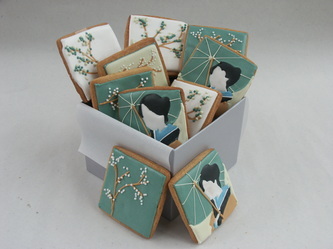 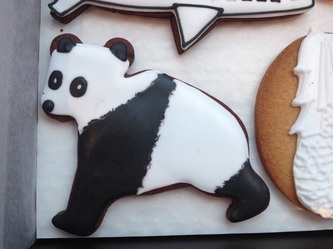 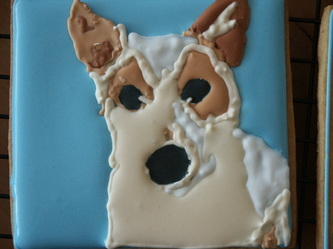 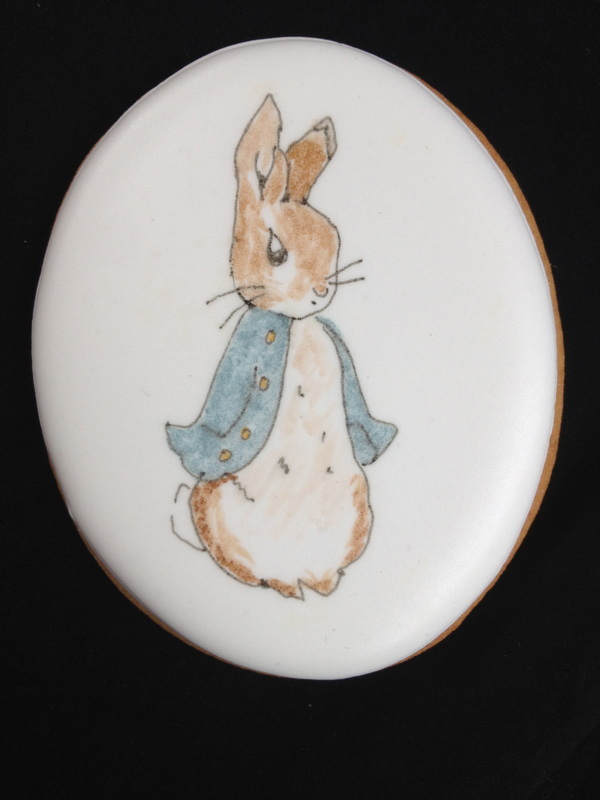 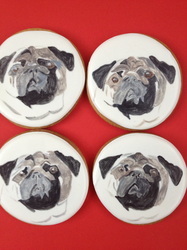 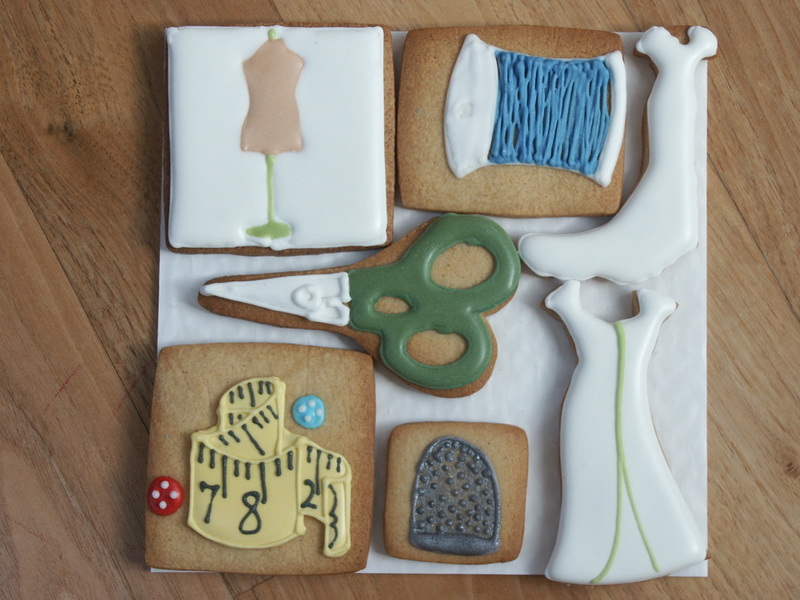 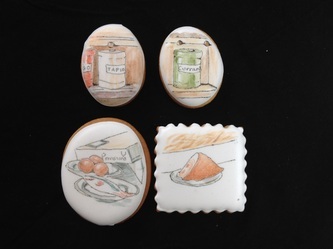 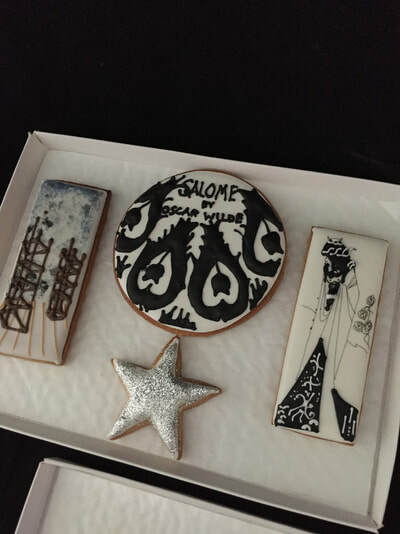 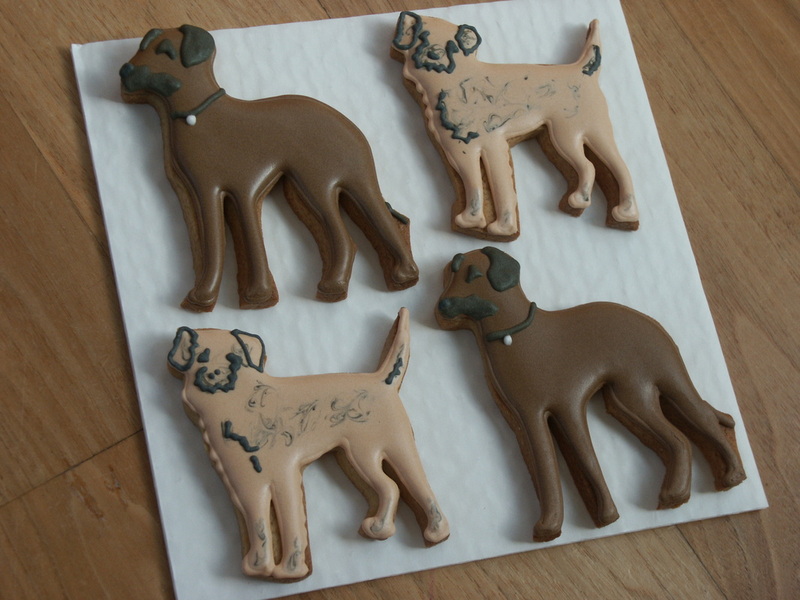 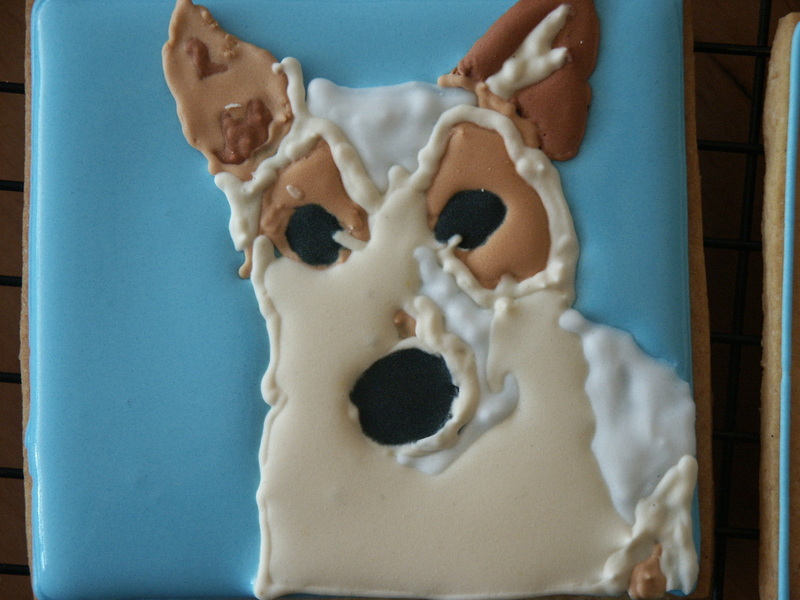 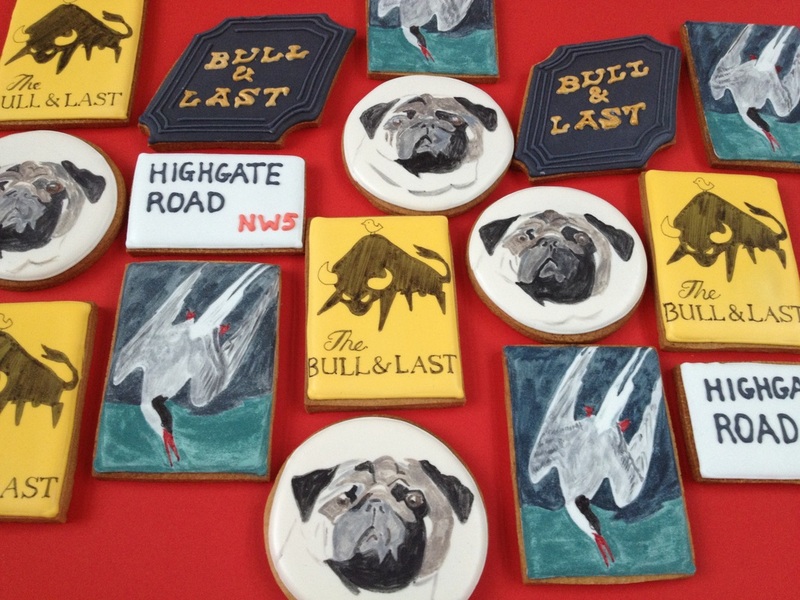 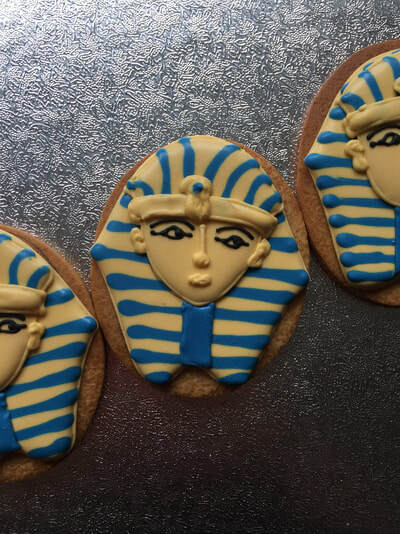 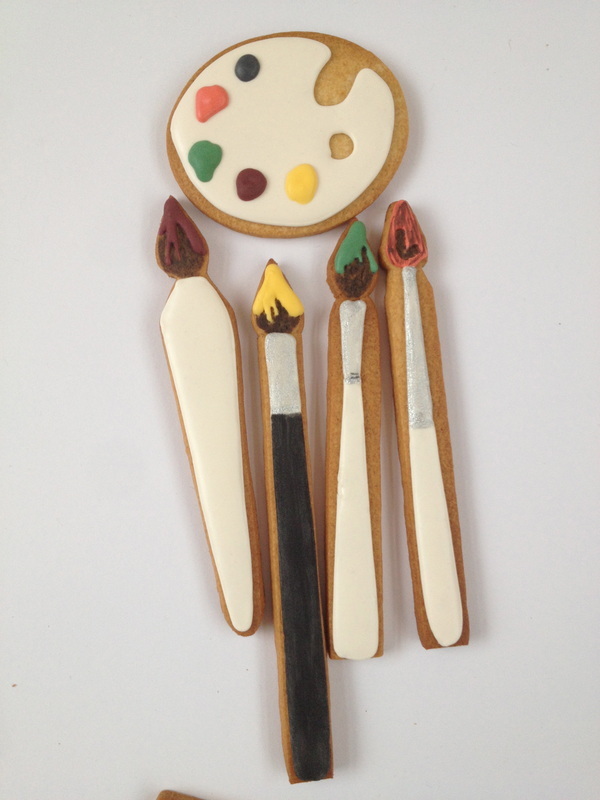 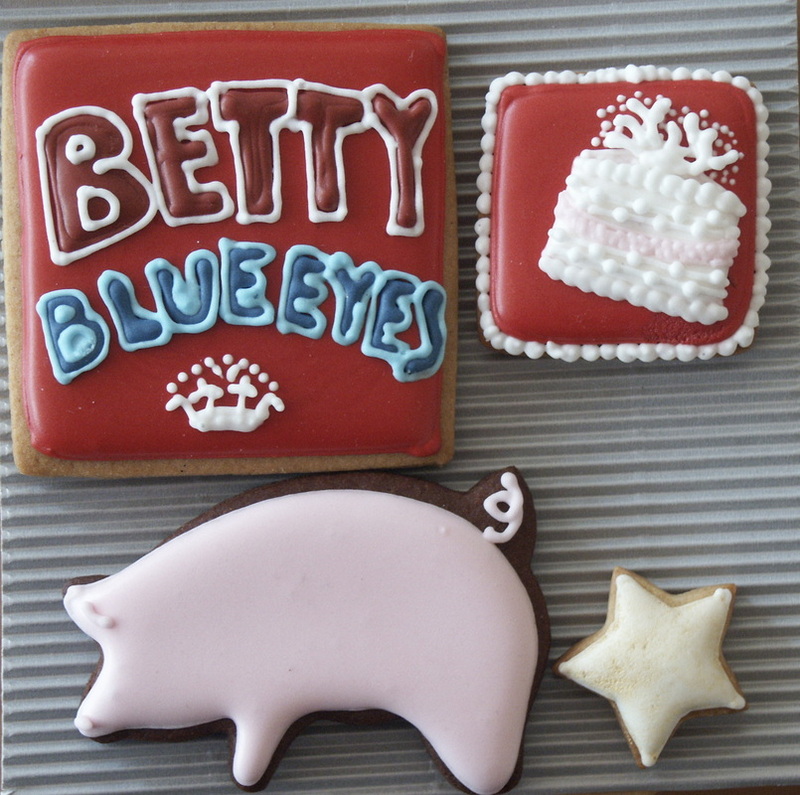 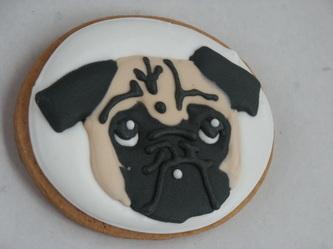 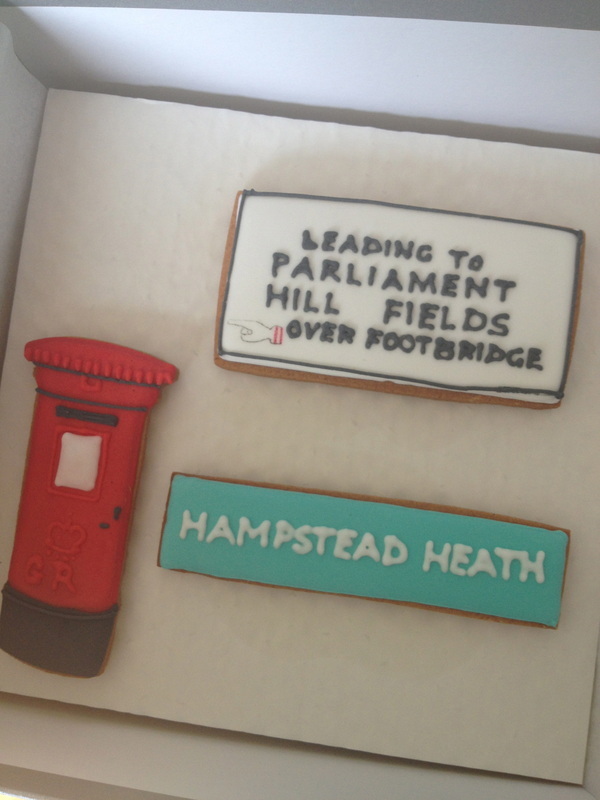 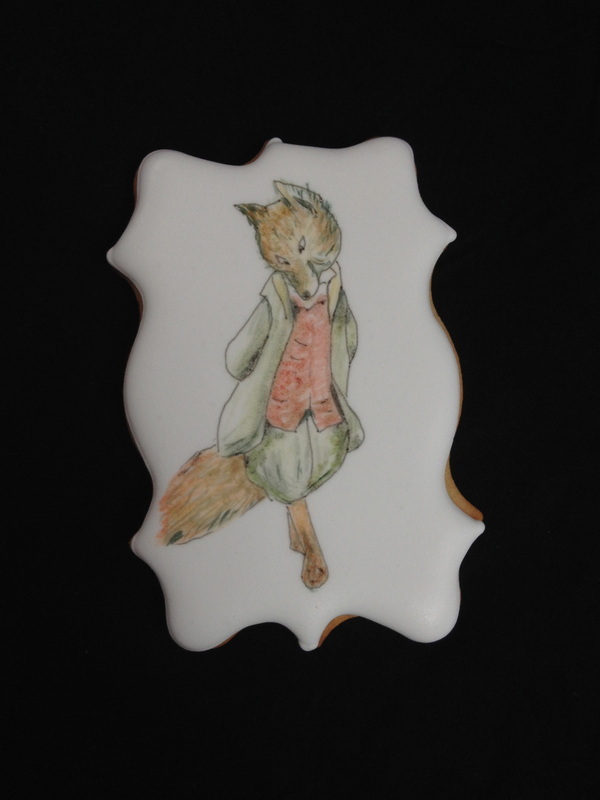 Send us a picture for some memorable bespoke biscuits of your favourite friend..
A beautiful and sophisticated gift to give or send instead of flowers. 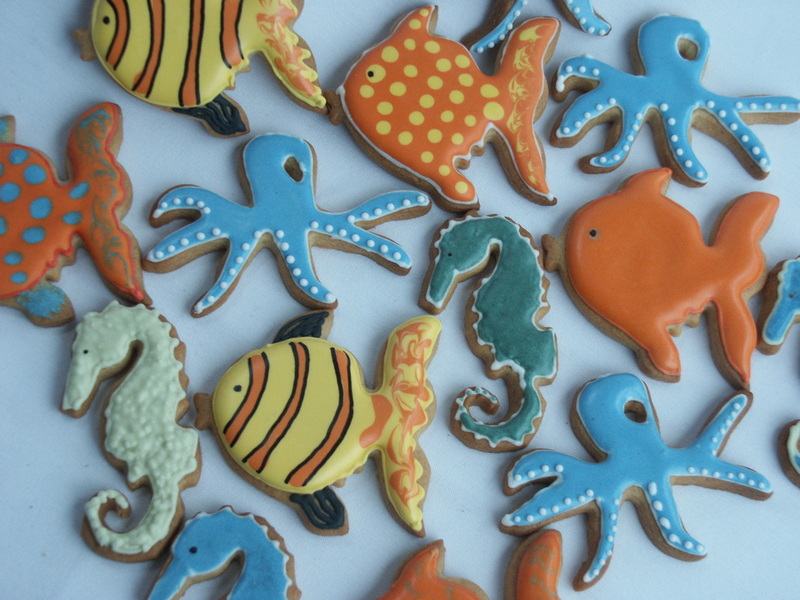 A wonderful underwater world of sea creatures for your delight. 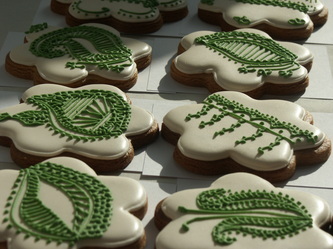 Order your five-a-day and everyone loves these greens. 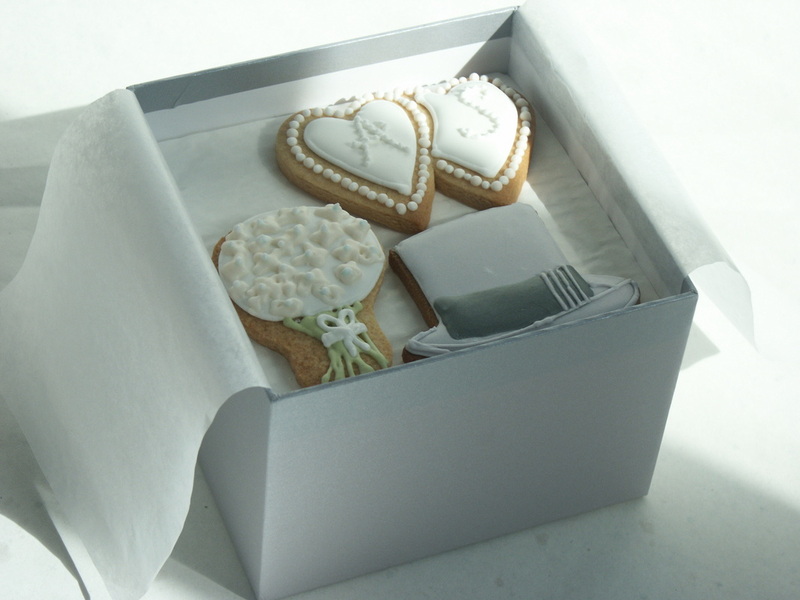 Choose a tool box or his favourite pastime to make a very special gift for a very special person. Any hobbies or pastimes can be turned into a beautiful and original gift. 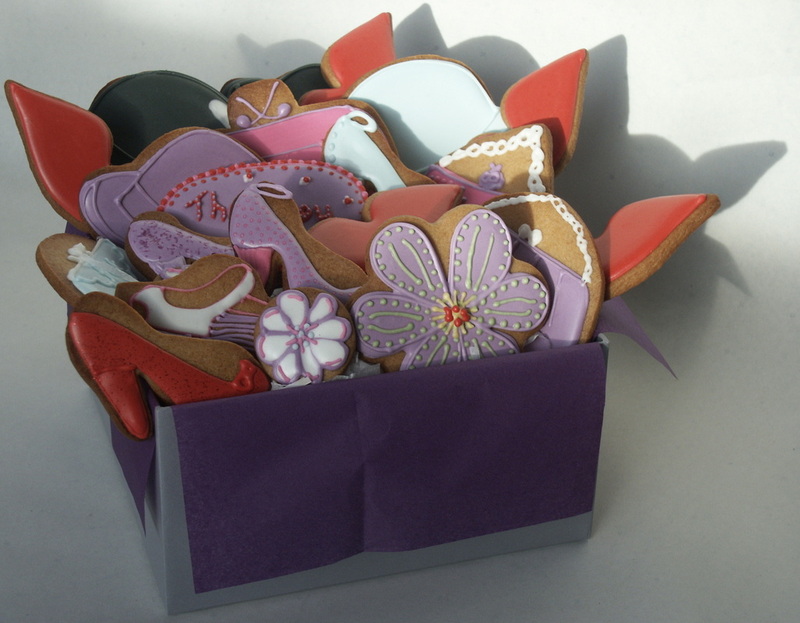 Bowlers, bags and shoes: a fashionable thank you! Large or small, no order is beyond us... Choose your theme and delight your friends or colleagues. 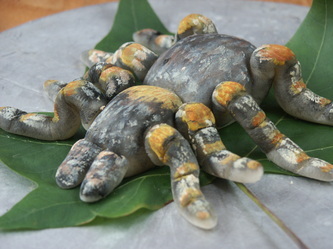 Want something a little different? Hand made marzipan moulded, hand coloured and hand painted for an extra special gift. 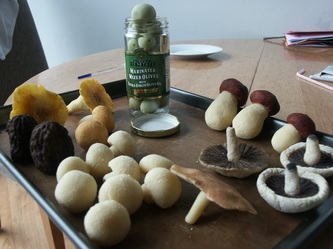 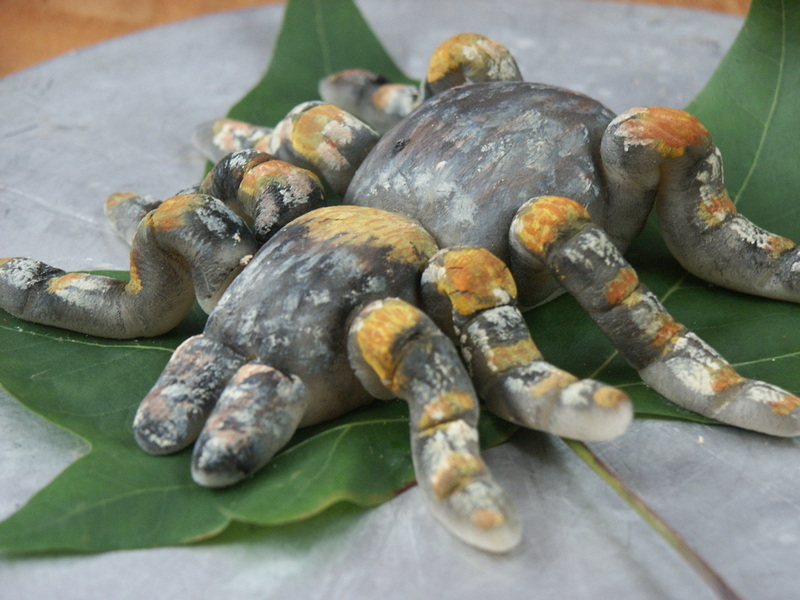 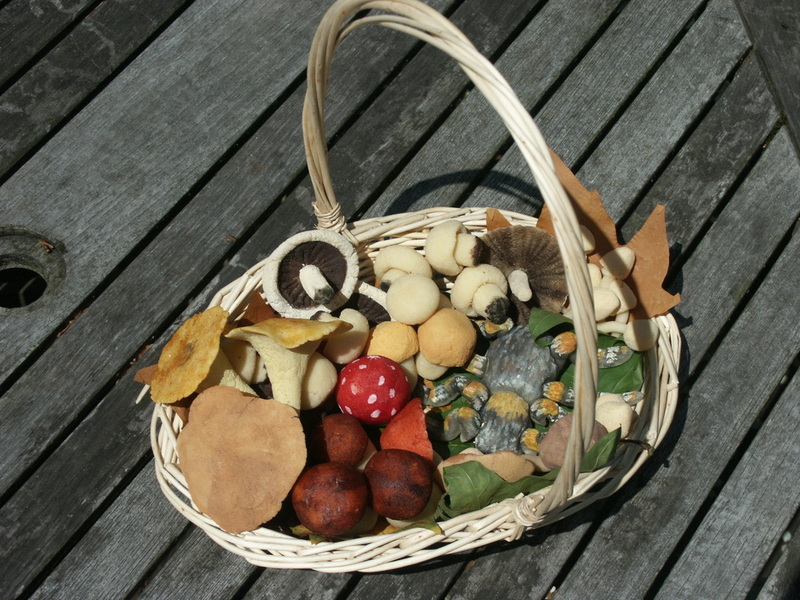 These marzipan mushrooms , tarantula and jar of olives were for a birthday treat with a difference! Give us a subject or theme and we'll see what we can do.